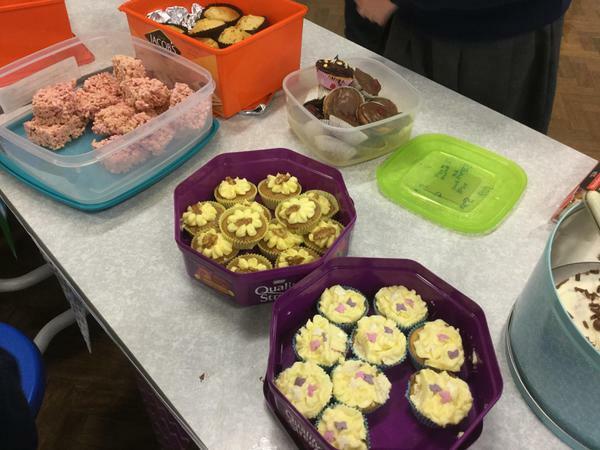 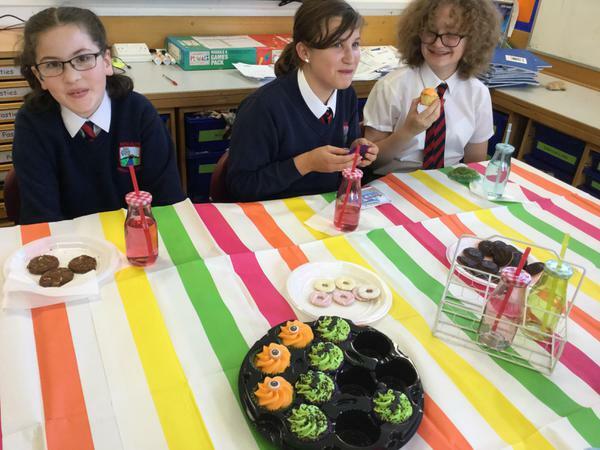 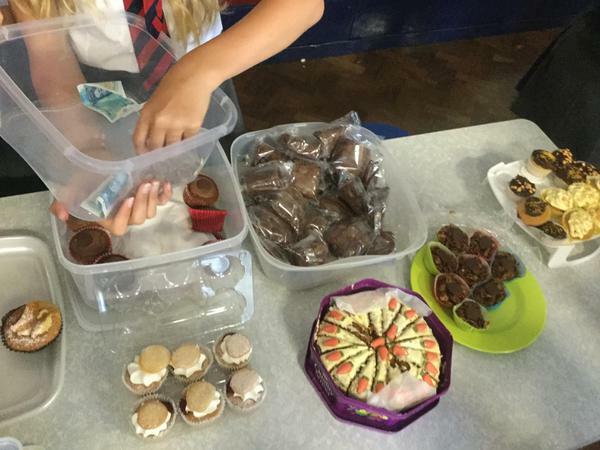 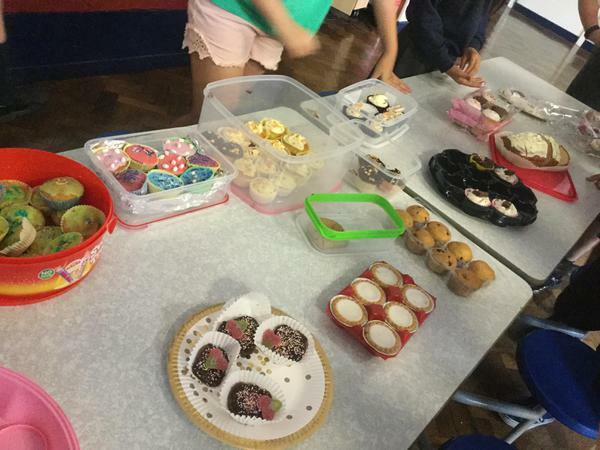 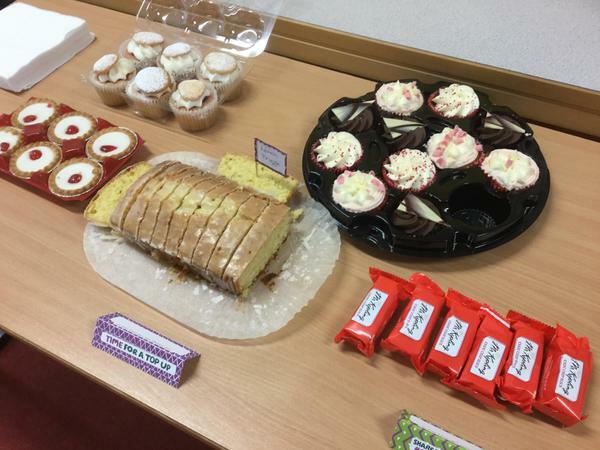 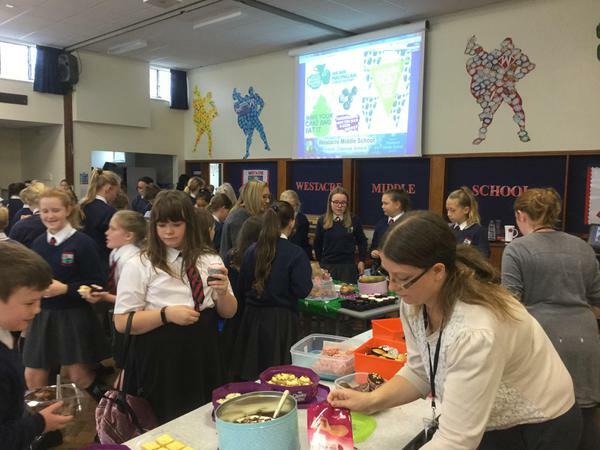 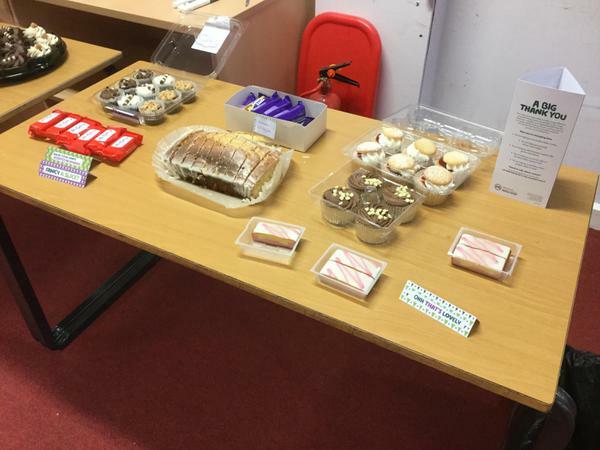 At the request of Year 7 girls Mia and Frankie, we were delighted to hold a cake sale for the Willow Foundation. 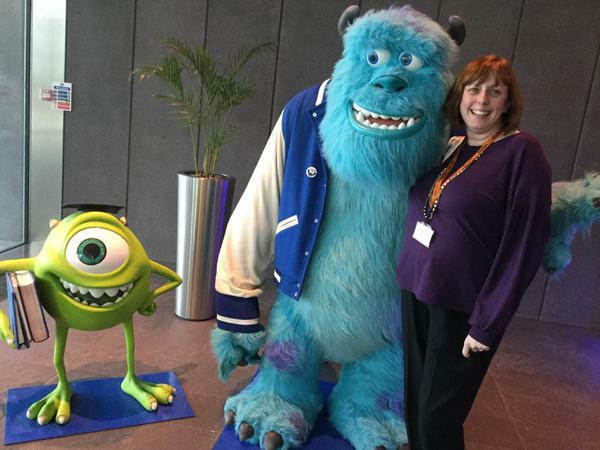 The charity helps seriously ill patients by organising memorable days out. 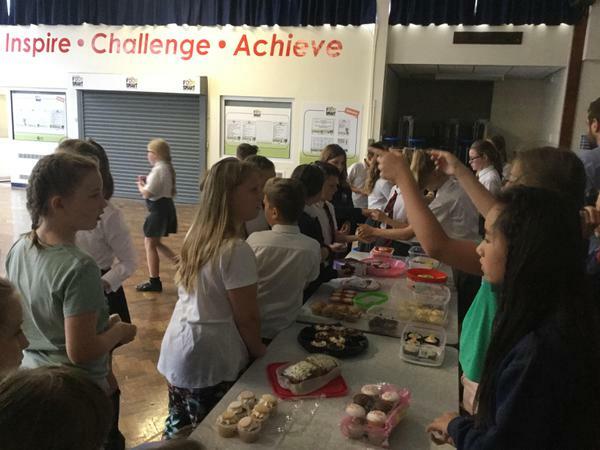 Overall, we are pleased to announce that the cake sale raised £95.70. 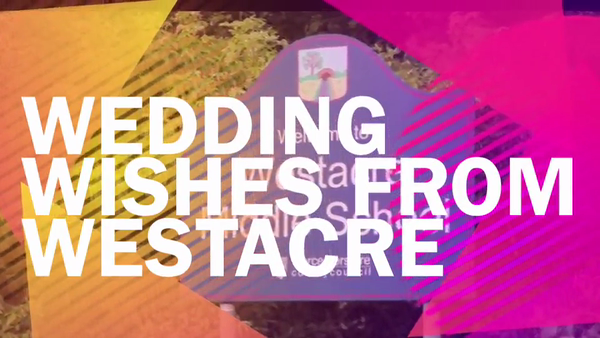 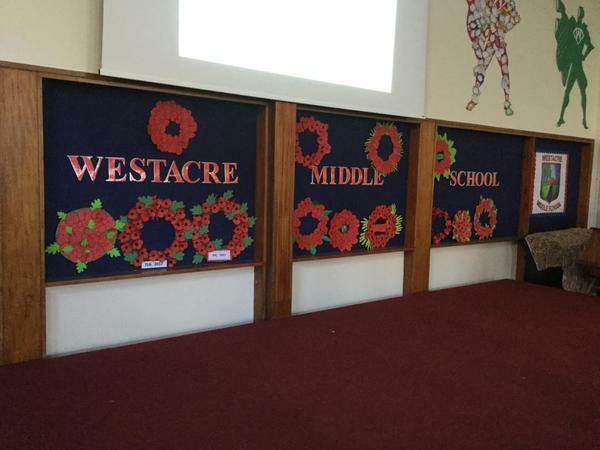 Well done again to all of the Westacre pupils and families for your support with this! 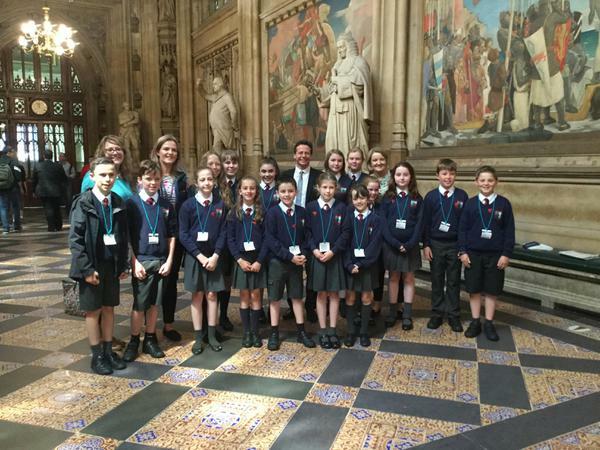 Both of these are impressive achievements, for which the children were rightly proud. 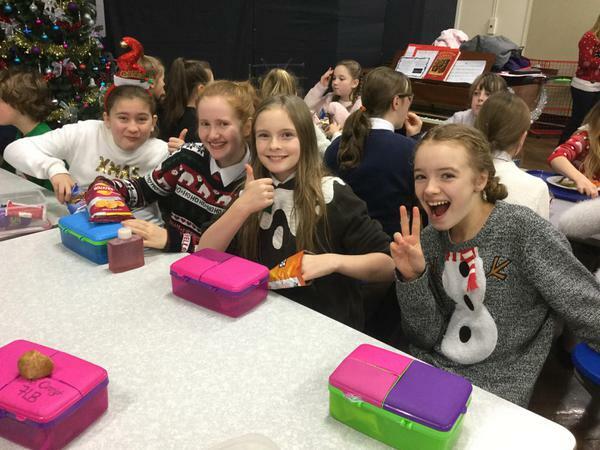 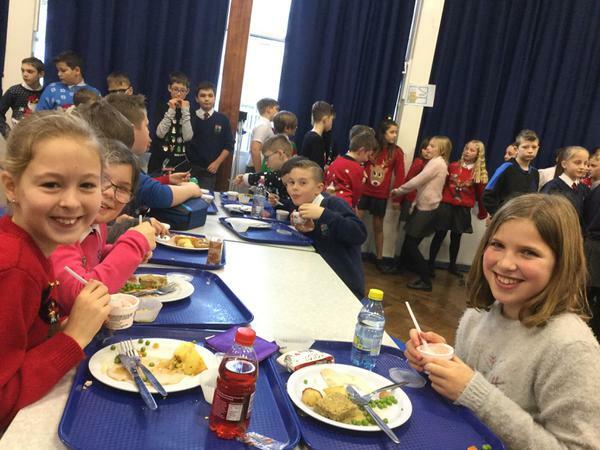 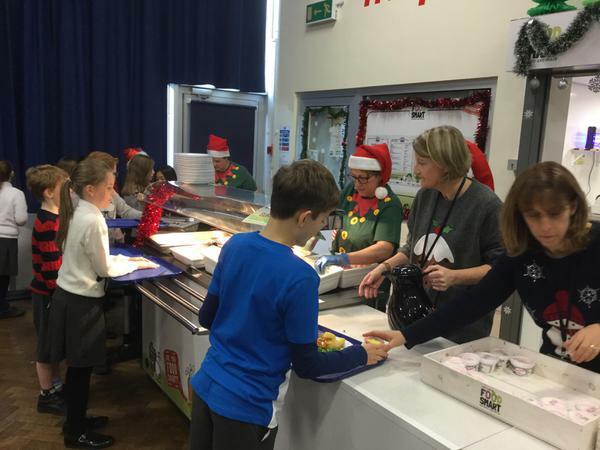 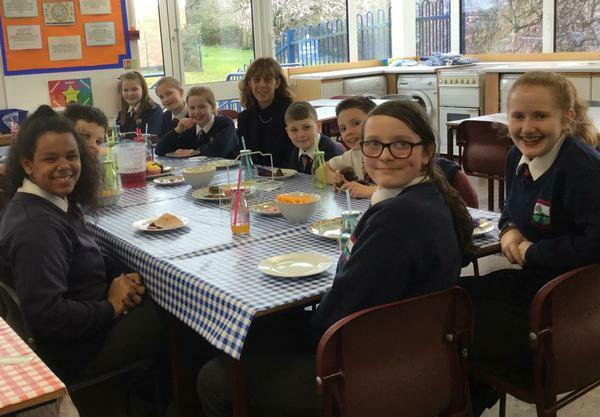 They thoroughly enjoyed the food provided and the time spent together. 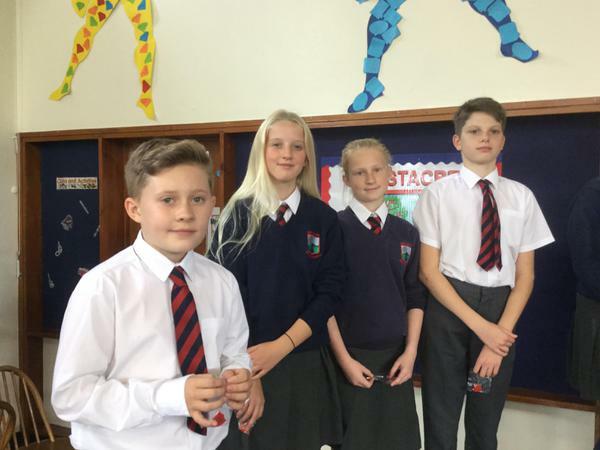 Well done to each and every pupil! 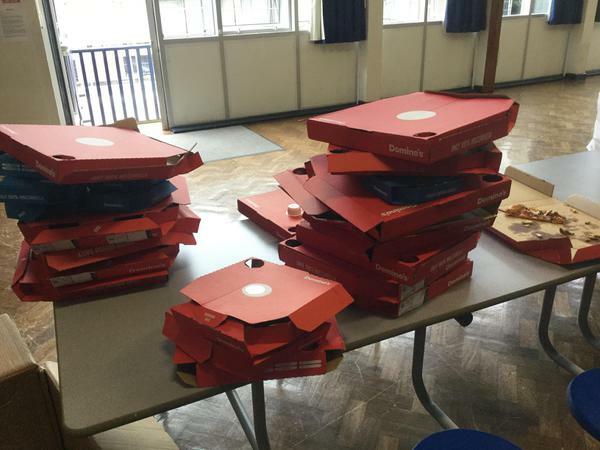 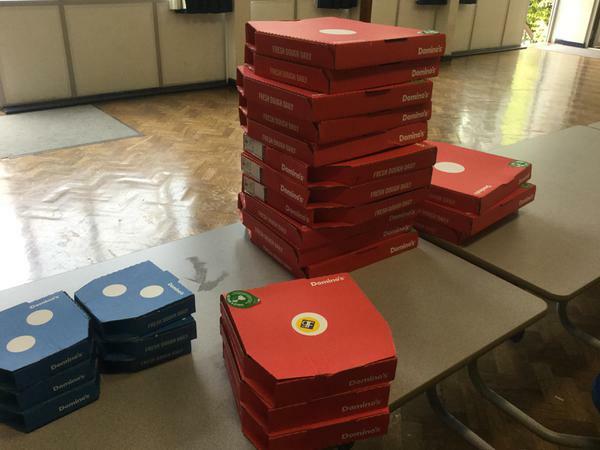 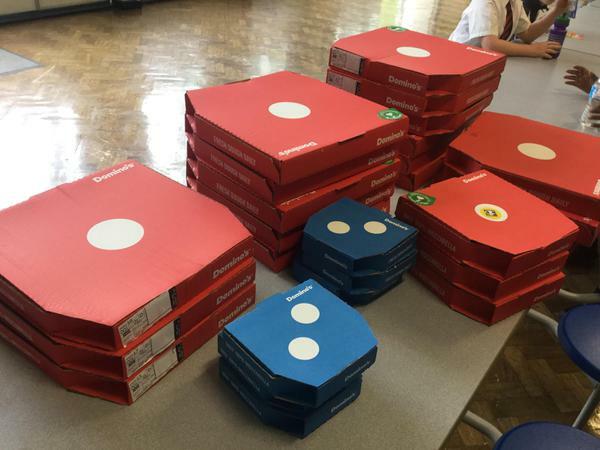 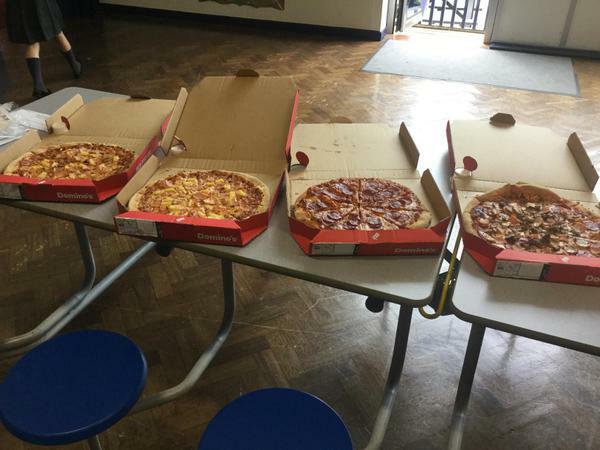 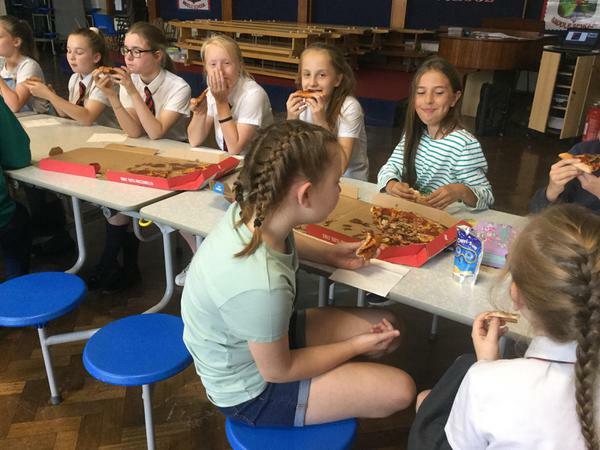 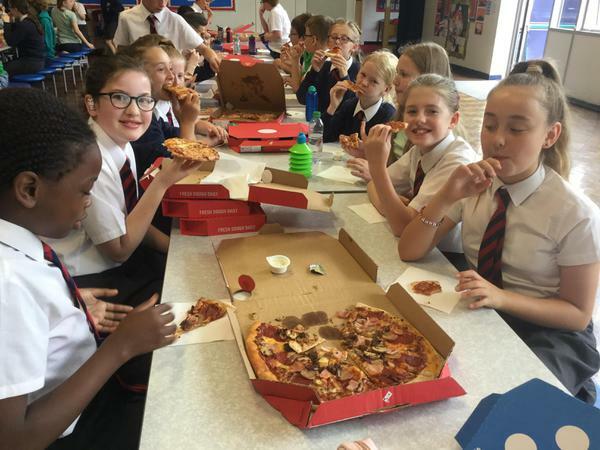 Thank you also to Domino's Droitwich for supporting this event! 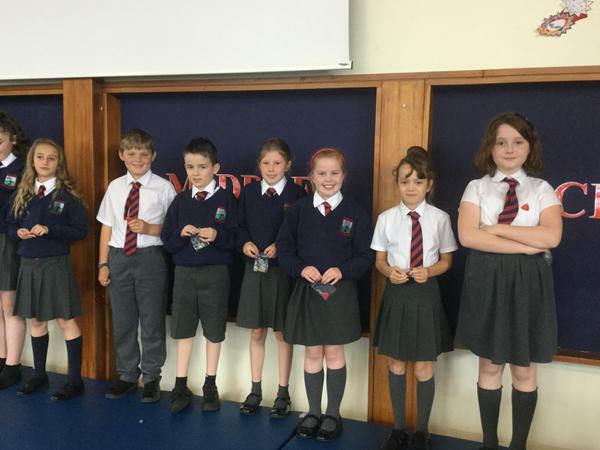 As we approach the end of Summer term, it is time for the special reward to all of the children in the house that earned the most house points. 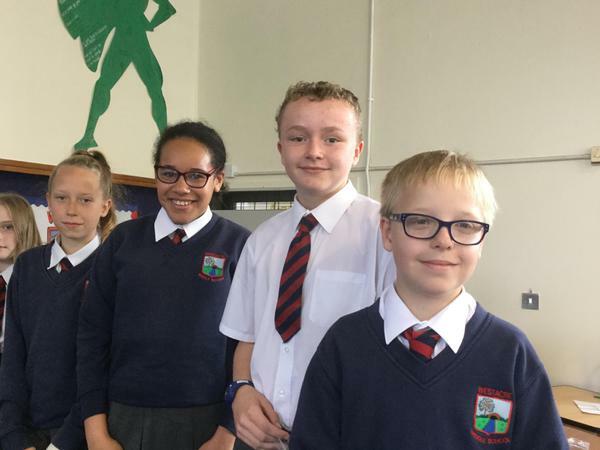 All pupils can earn house points for their particular house by earning bronze, silver, gold and platinum certificates linked to our 6Rs Learning Behaviours, as well as through participation in our various house competitions. 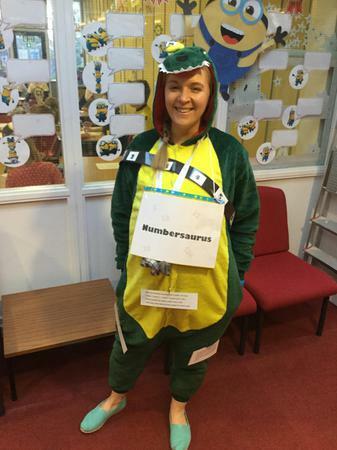 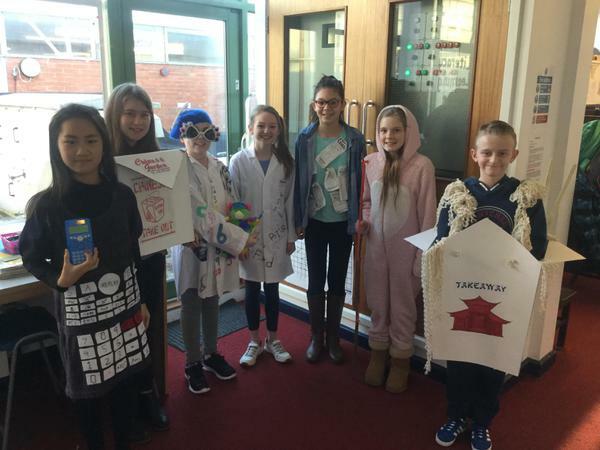 This term’s winning house is Attenborough. 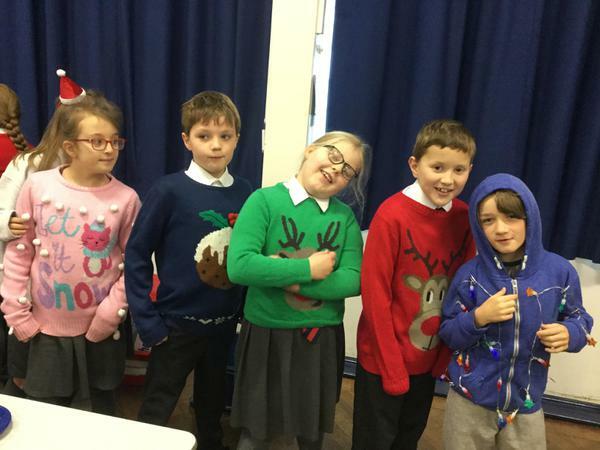 The children and staff in this house showed much effort in incorporating much green into their clothes as part of a special non-uniform day! 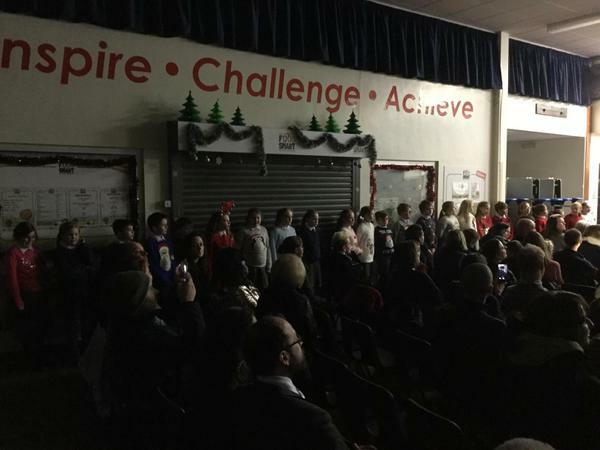 Well done to all of Attenbrough house for the achievement this term, as well as all of the pupils in the other houses who offered their congratulations on this day of celebration! 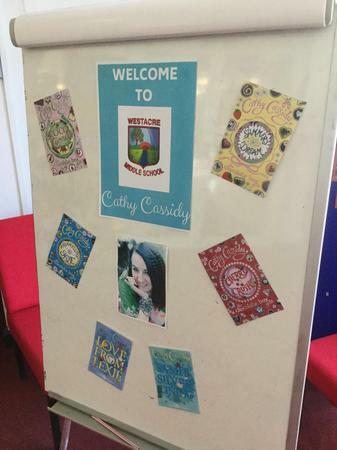 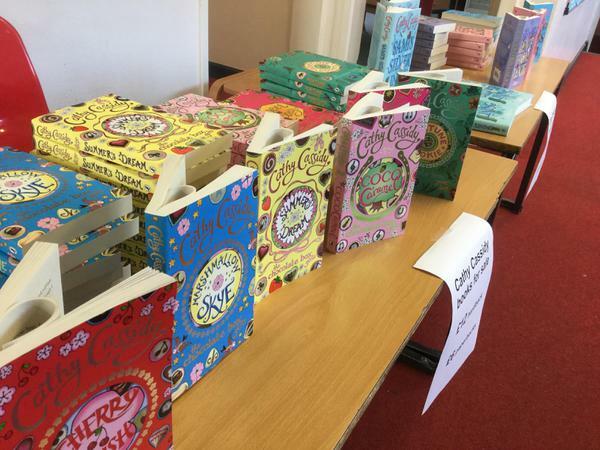 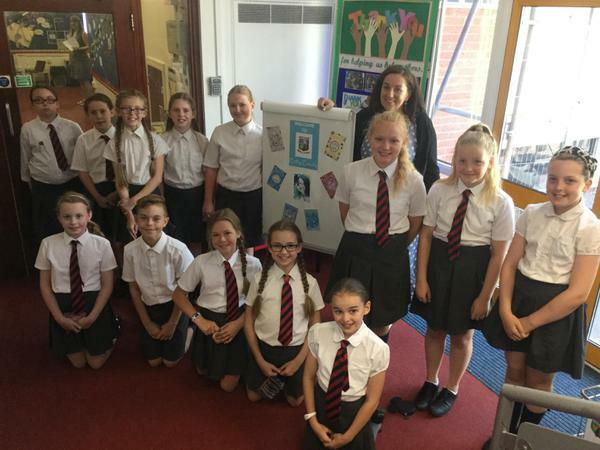 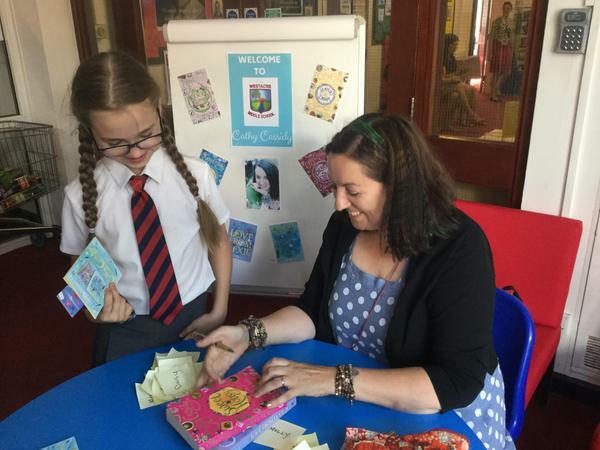 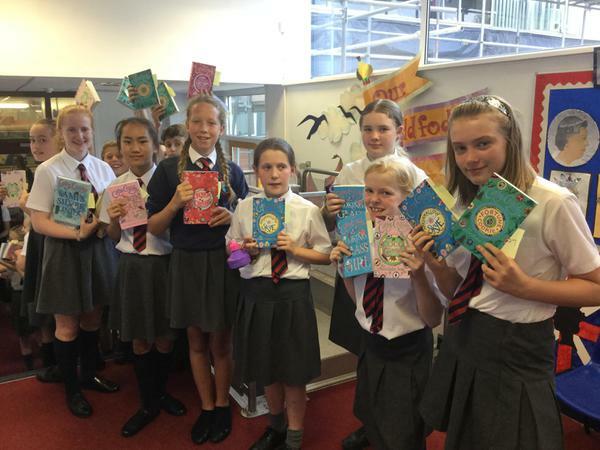 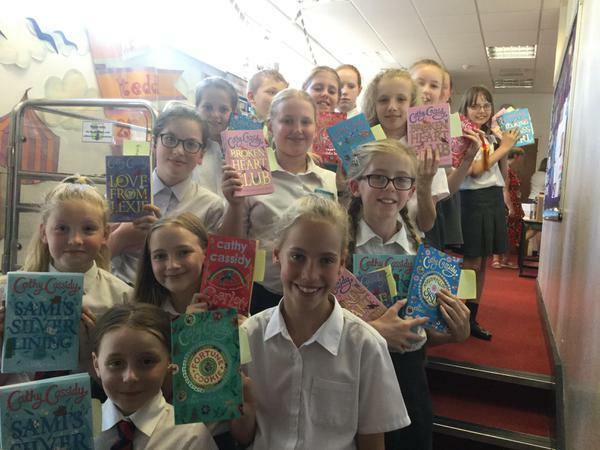 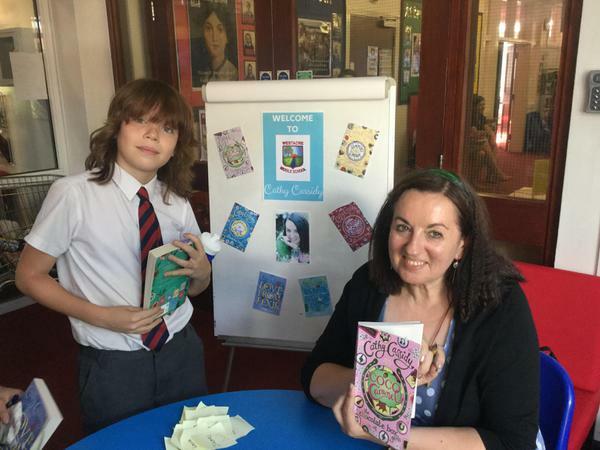 On Wednesday afternoon Westacre Middle School was delighted to play host to children’s author Cathy Cassidy. 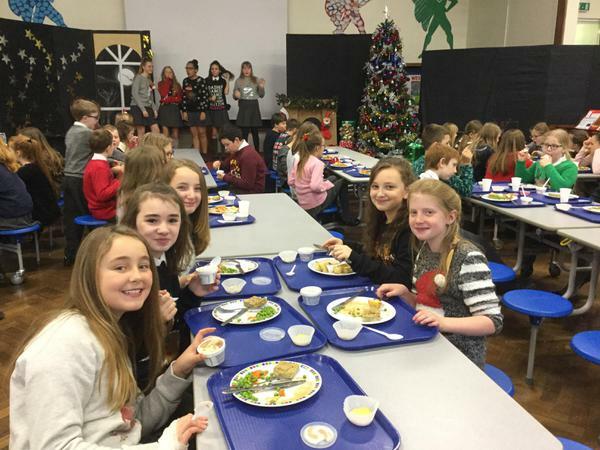 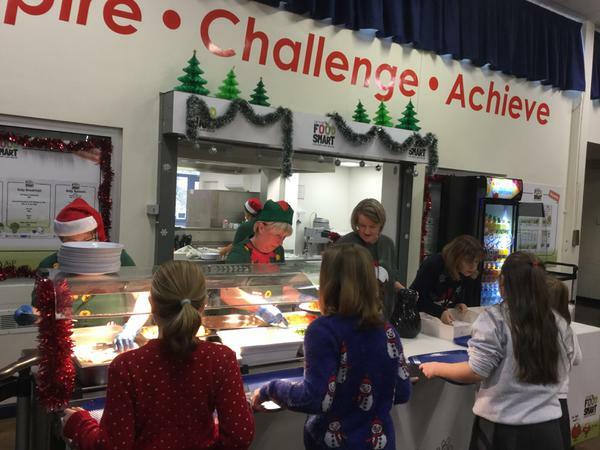 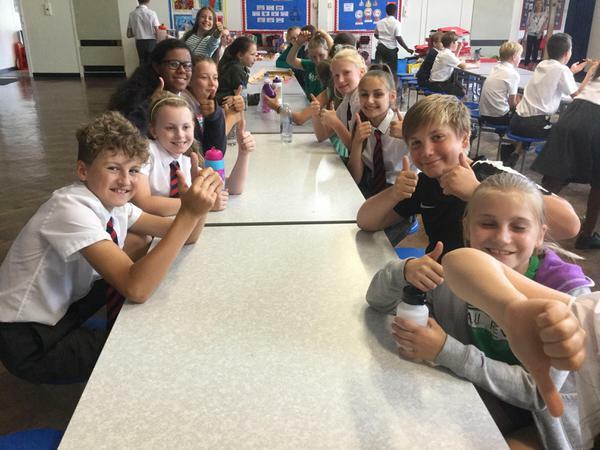 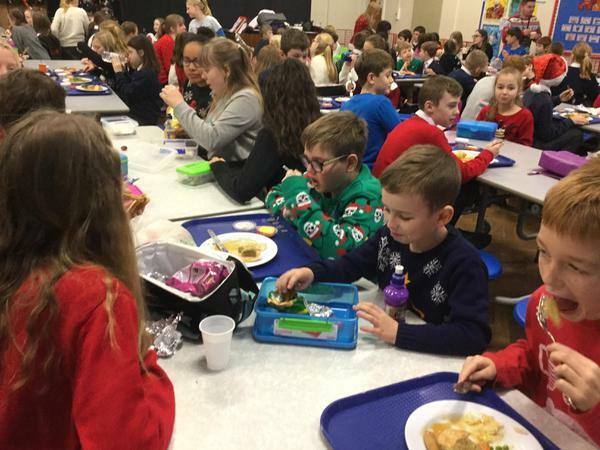 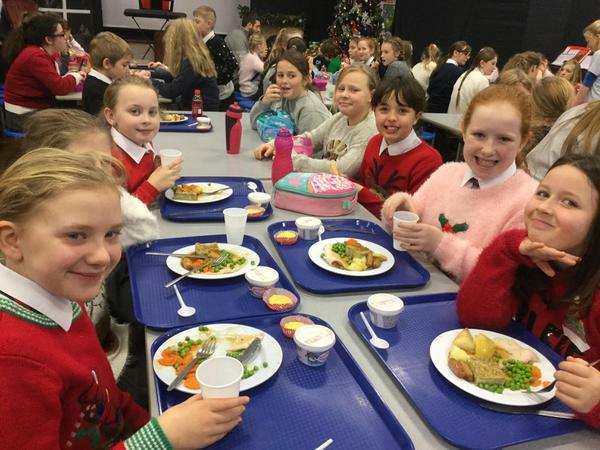 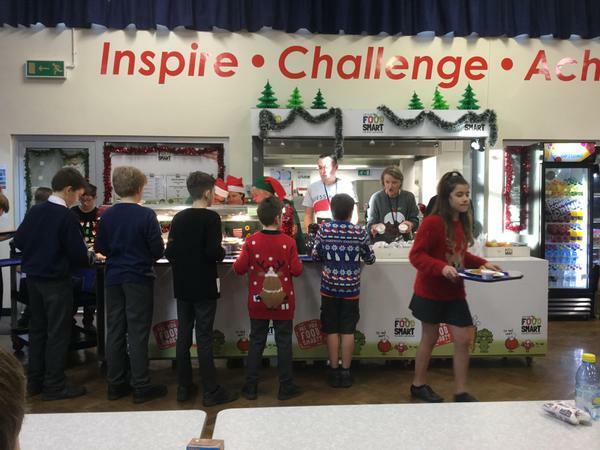 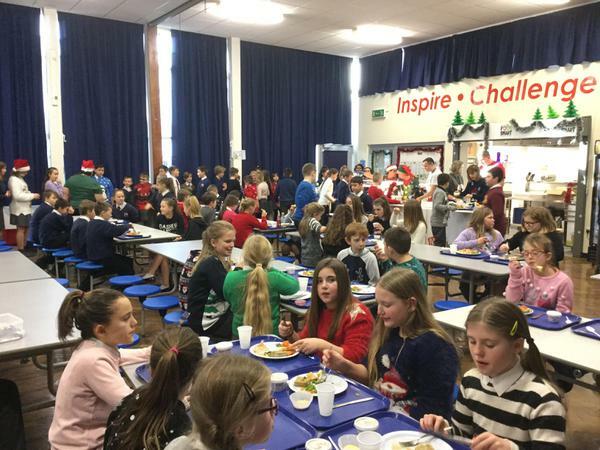 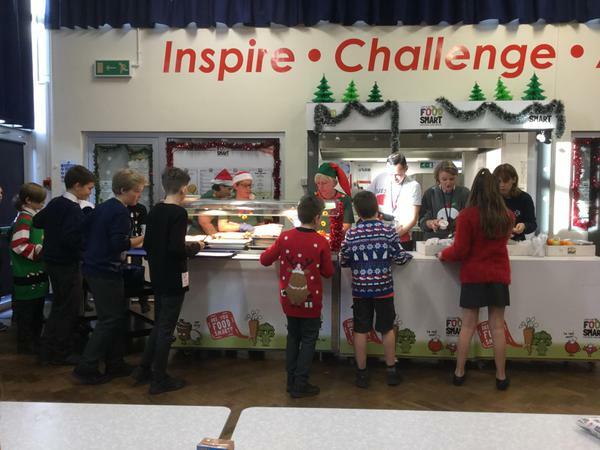 120 Westacre pupils from across the year groups were joined by invited students from Catshill Middle, Churchill Middle, Ipsley Academy, St Josephs and Witton Middle. 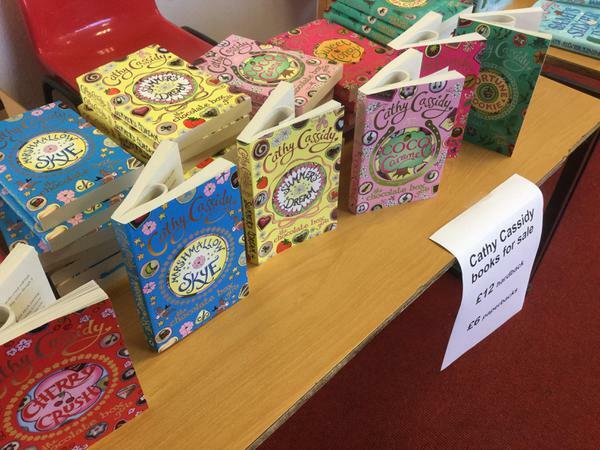 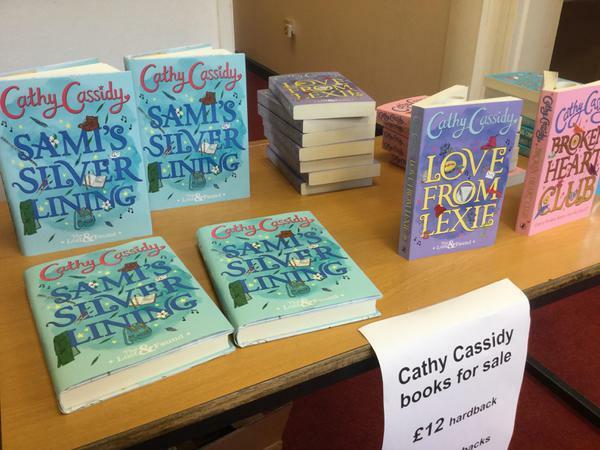 The children were treated to an inspiring presentation, Q & A and book signings from Cathy. 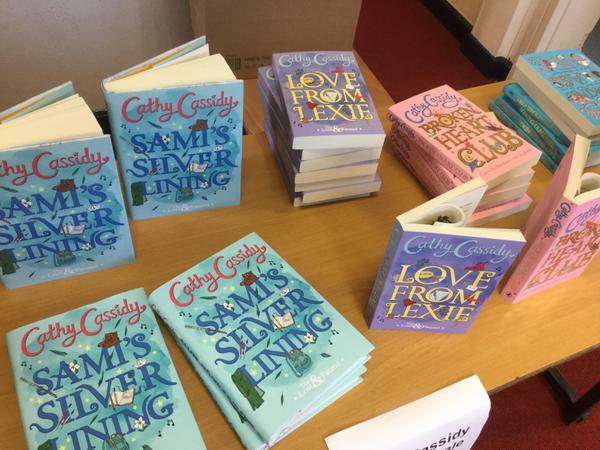 Cathy also read the first chapter of her new book, Sam’s Silver Lining, about a young Syrian refugee. 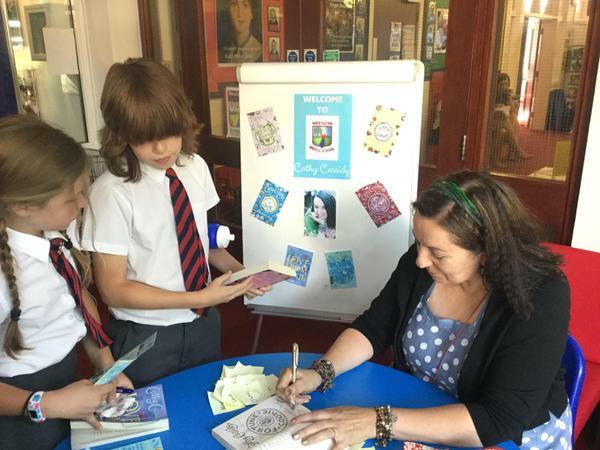 She described to the children the inspiration behind this latest novel. 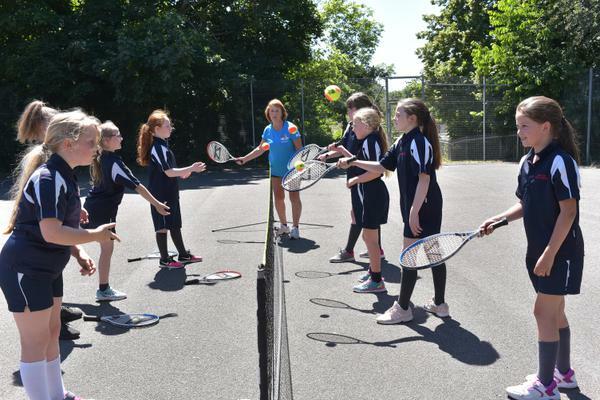 We hosted special tennis lessons for mums and daughters as part of a national initiative organsied by Judy Murray. 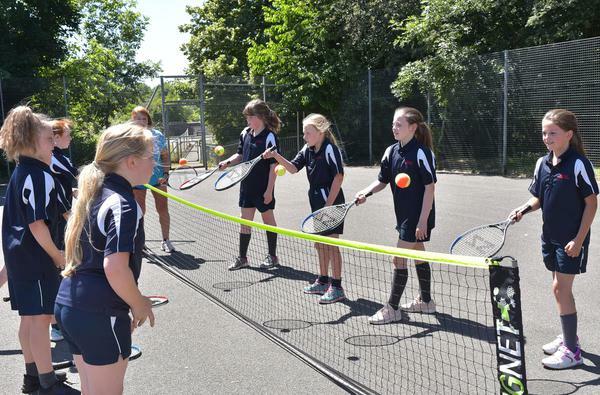 The goal of She Rallies is to empower and expand the number of girls and women coaching and playing tennis in the UK. 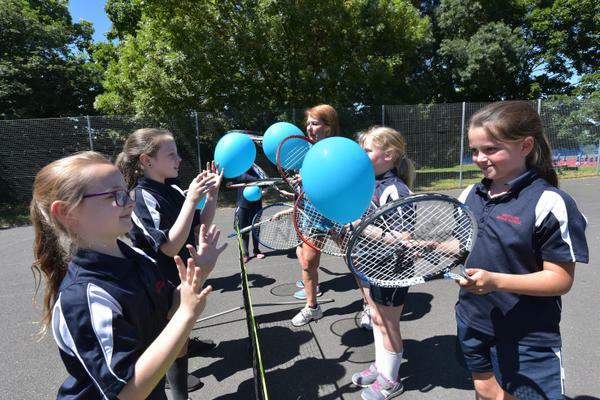 It an initiative spearheaded by Judy Murray and her passion for the game. 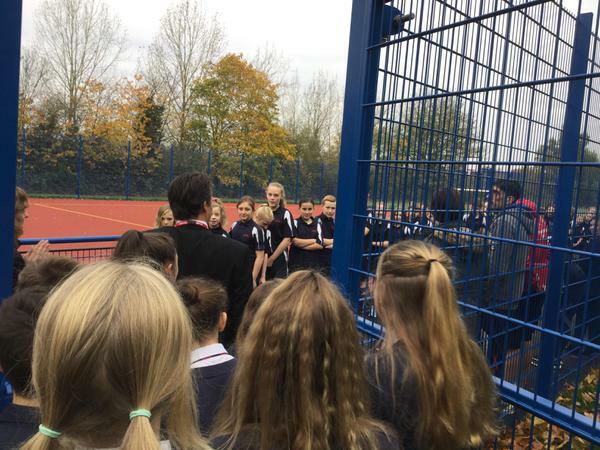 It is part of the LTA's commitment to growing tennis from the grassroots up by encouraging more girls to take up the sport. 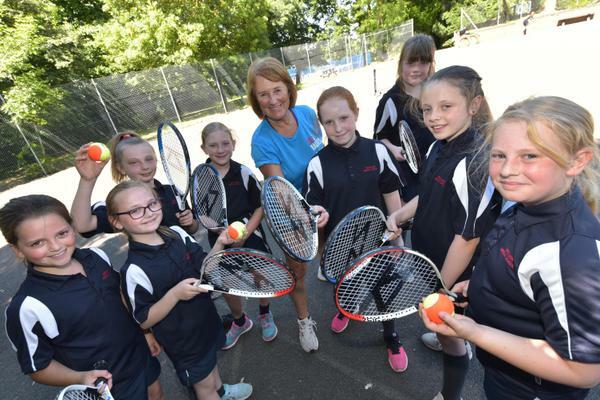 Friend of Westacre Margaret Hughes has led the sessions after being trained as an Activator with Judy Murray at Edgbaston and Tina Manning our local Ambassador at David Lloyd Worcester. 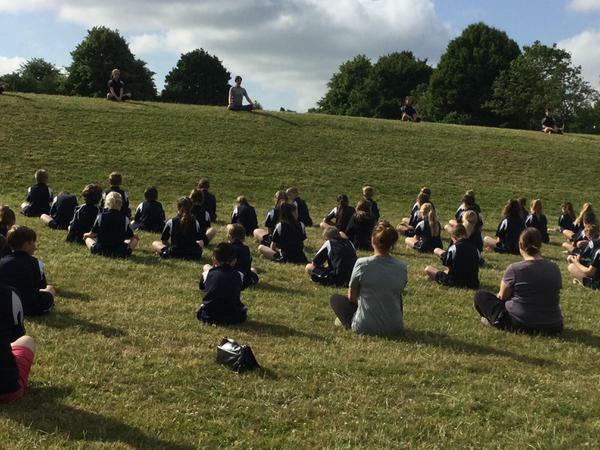 32 Year 5 girls have completed the Miss Hits programme in glorious sunshine on Tuesday afternoons, culminating in a session with some mums this week. 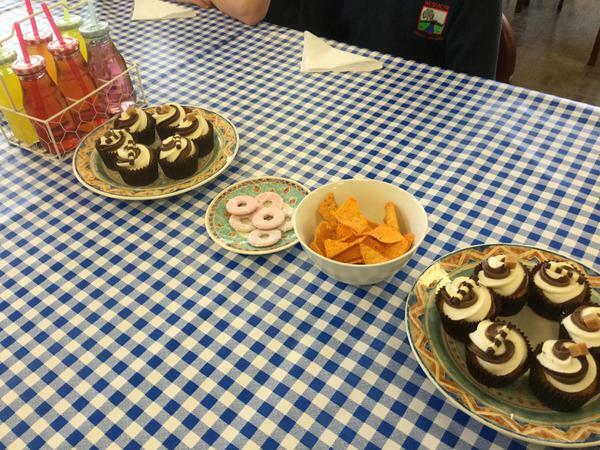 The session concluded by sharing strawberries and cream. The Great Get Together is inspired by MP Jo Cox, who was killed on 16 June 2016. 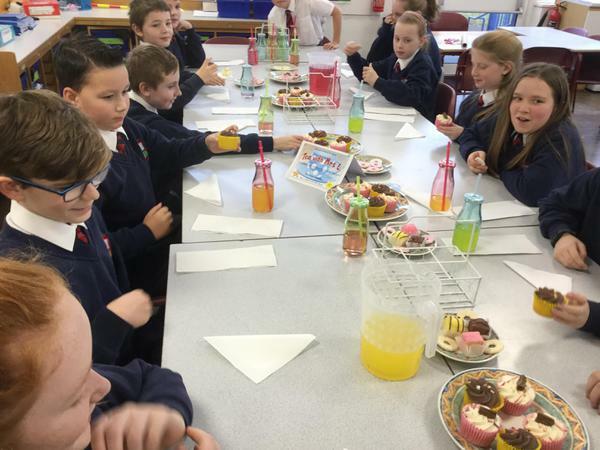 Jo was a big believer in the power of bringing communities together. 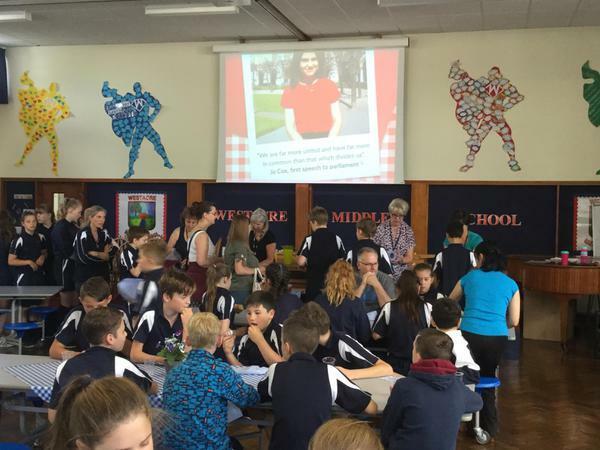 The initiative set up by Jo’s family and friends is an attempt to bring people together to celebrate the strength of working as a community. 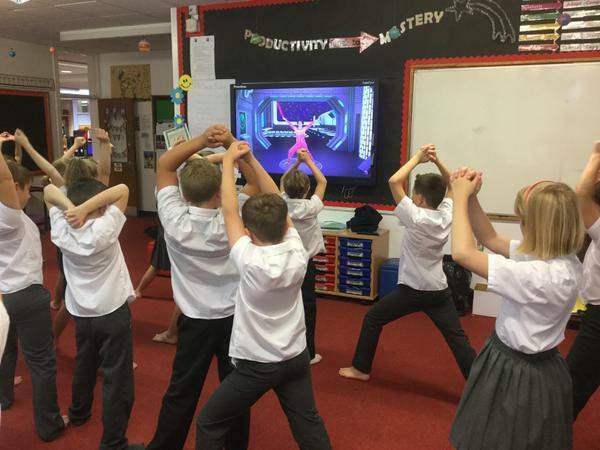 We combined our celebrations with World Yoga Day. 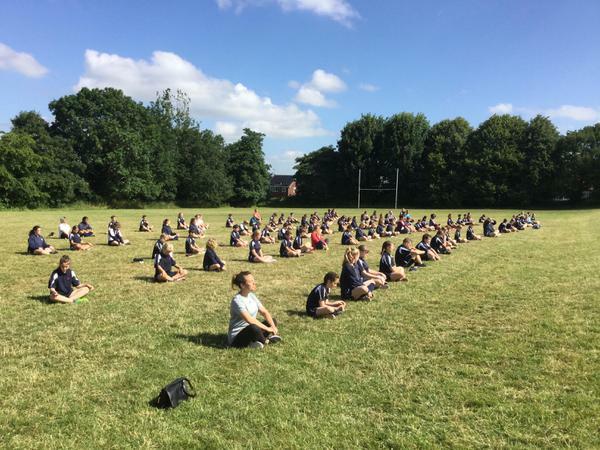 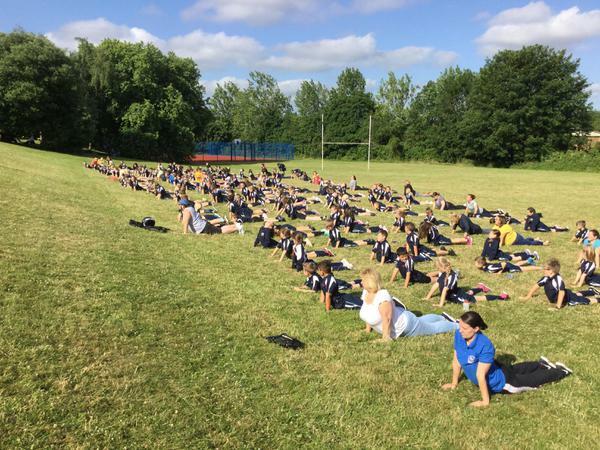 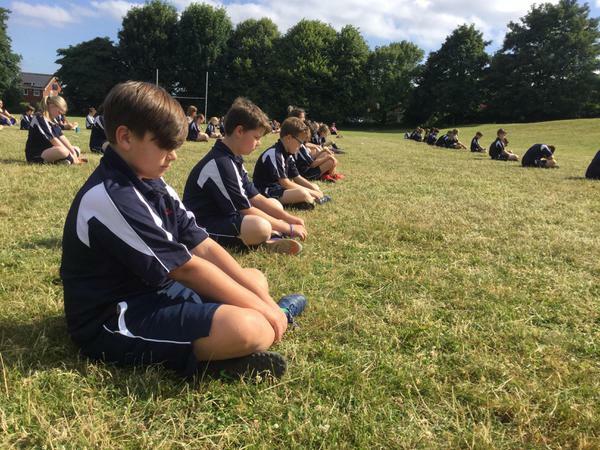 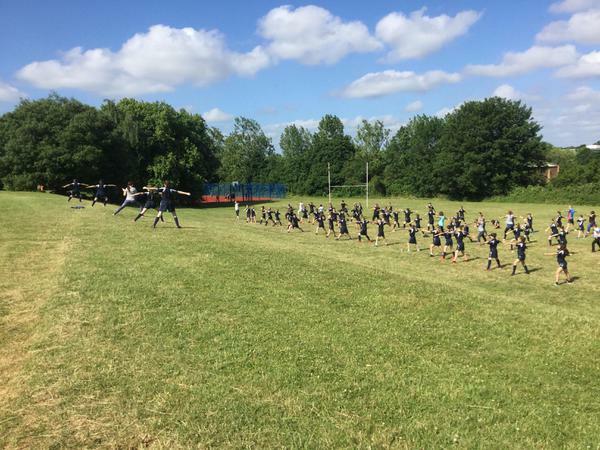 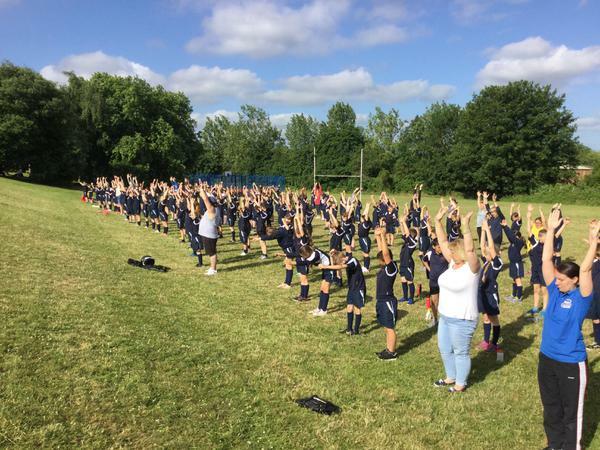 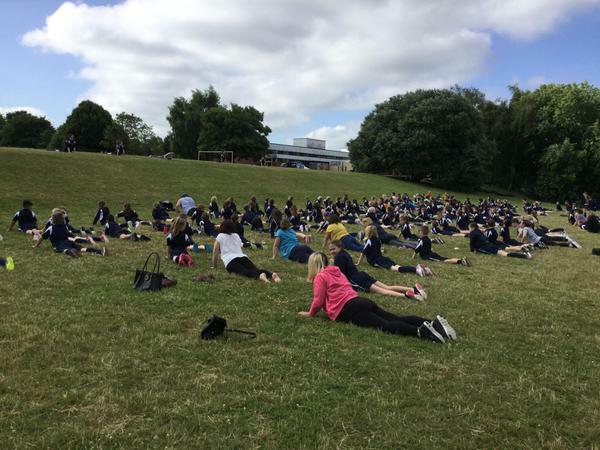 Parents and children took part in a yoga class out in the sunshine on the school field followed by cake, squash and time spent together as pupils, staff and parents. 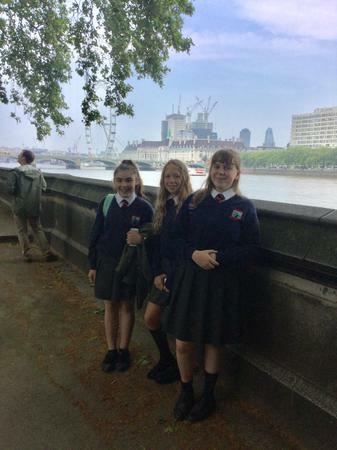 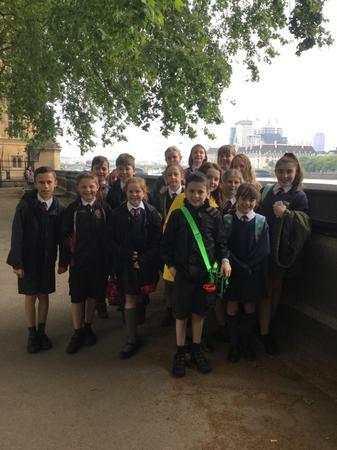 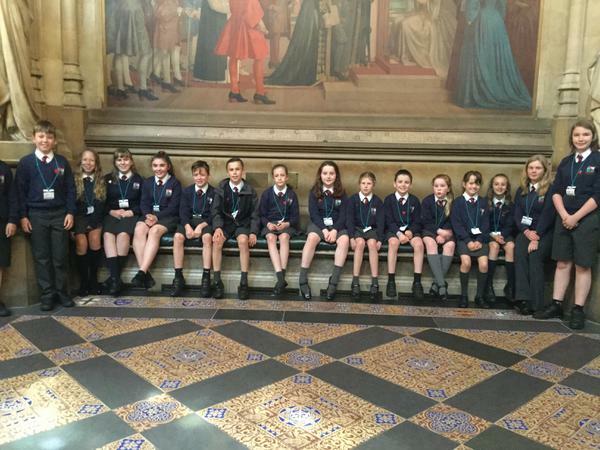 Our school parliament were lucky enough to visit the Houses of Parliament yesterday. 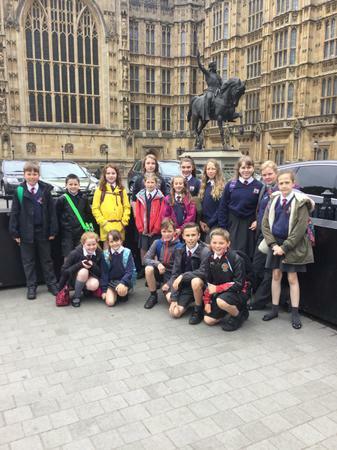 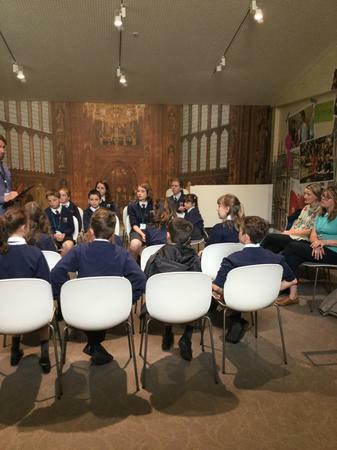 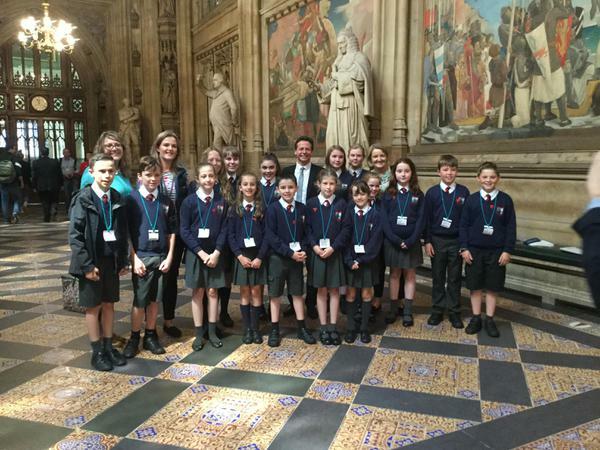 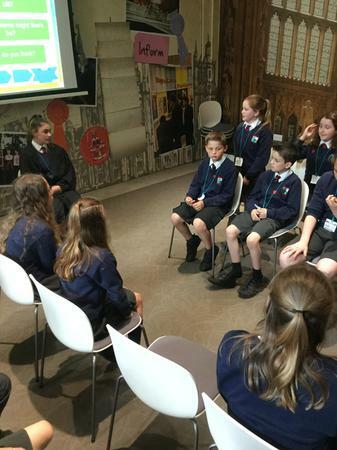 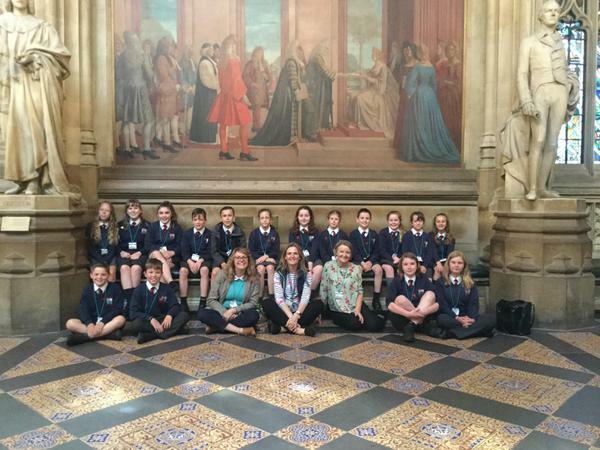 The 16 children were able to view both the House of Commons and Lords in session. 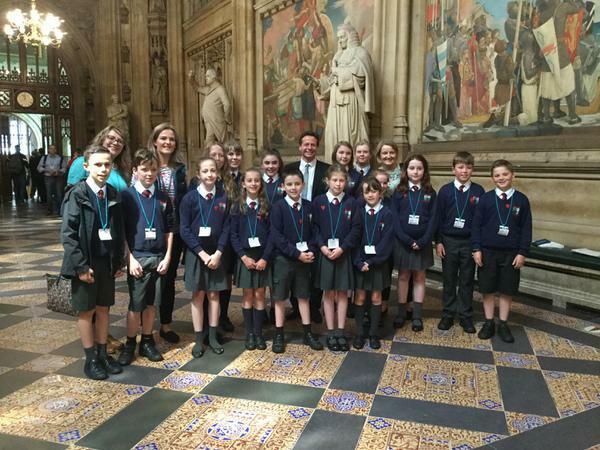 They were also greeted by Worcestershire MP Nigel Huddleston who made time to answer the children’s questions and share some of his stories about life as an MP. 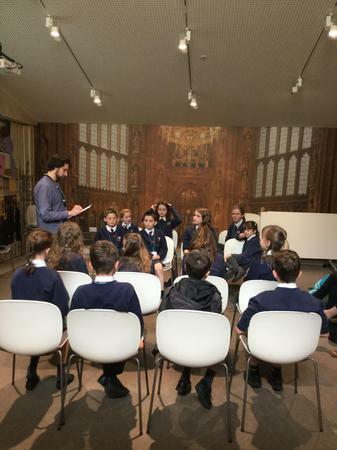 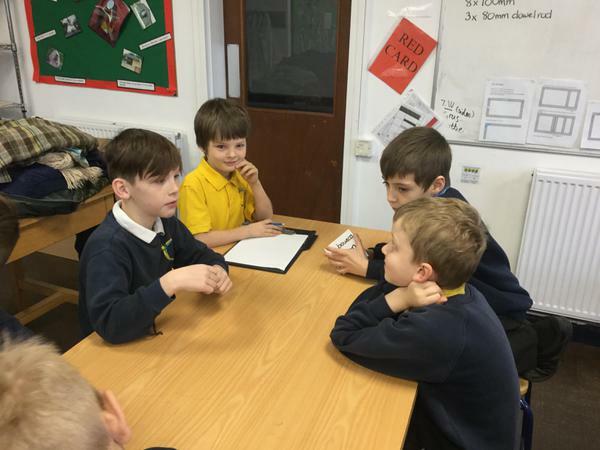 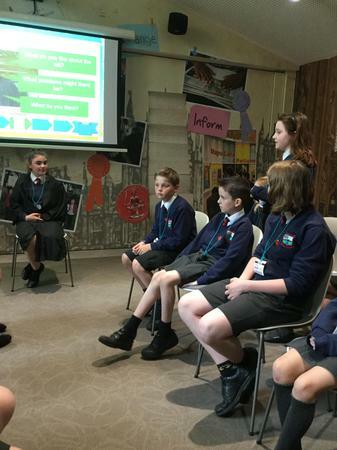 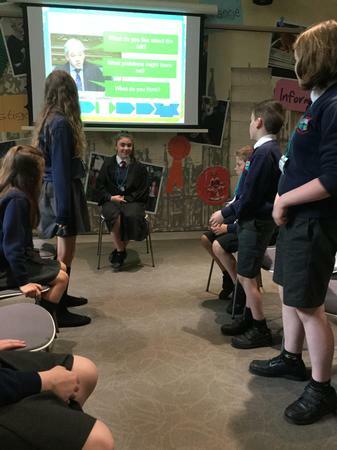 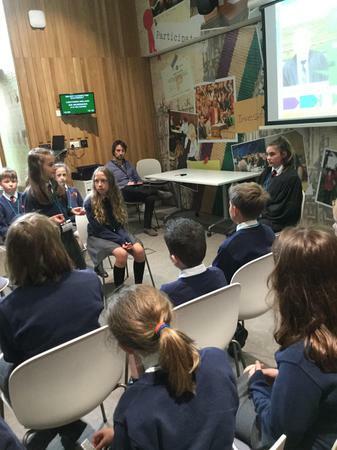 The pupils also took part in a workshop in Law making and democracy where they were asked to come up with issues that they would like to debate and make new laws about.The children were clearly inspired by their surroundings and held a series of debates – we were delighted by the level of discussion and the passion the children displayed about world issues. 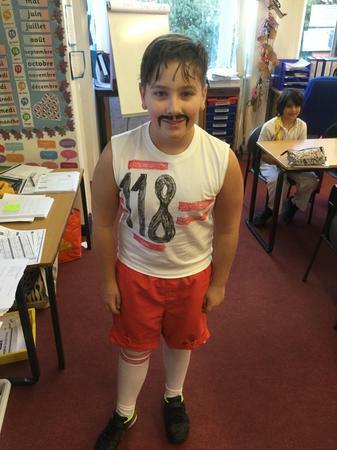 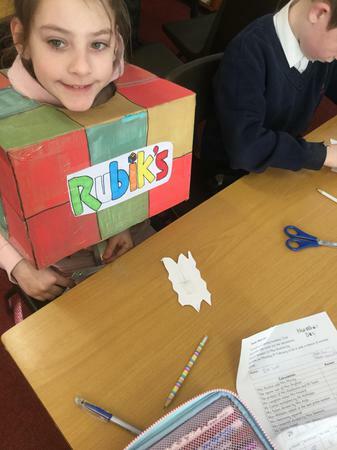 To help celebrate the wedding of Prince Harry and Ms Meghan Markle, our annual Dabble Day had a royal twist! 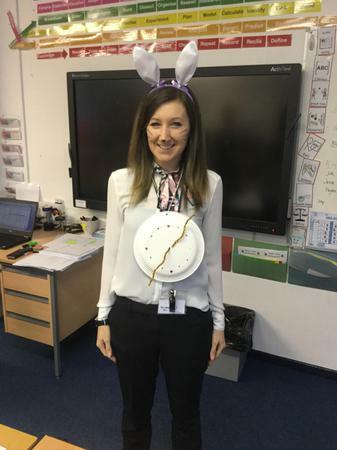 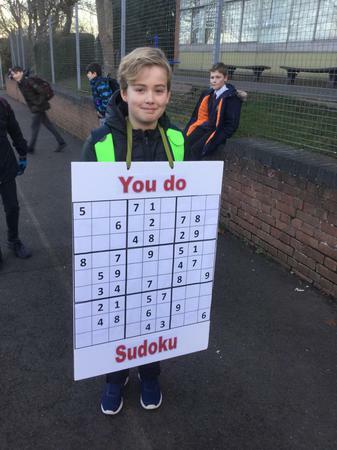 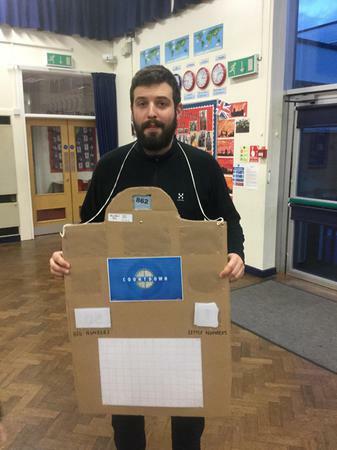 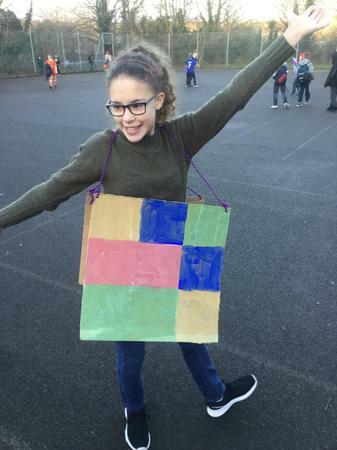 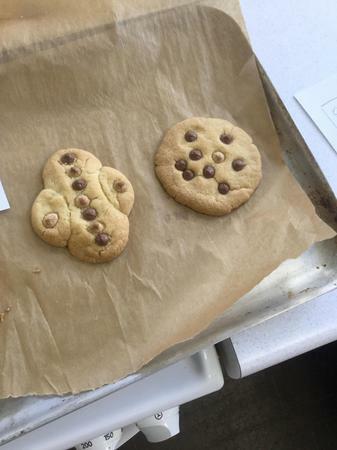 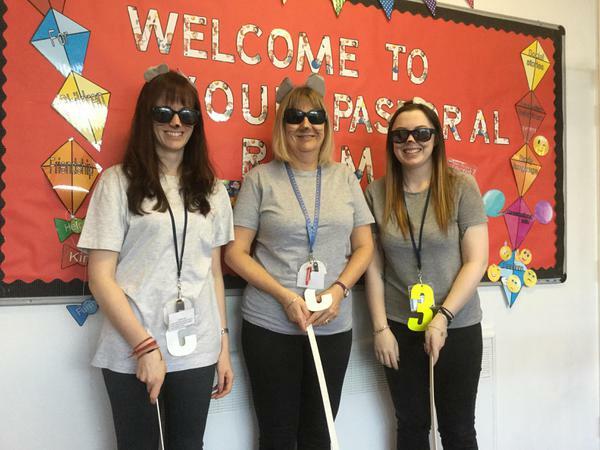 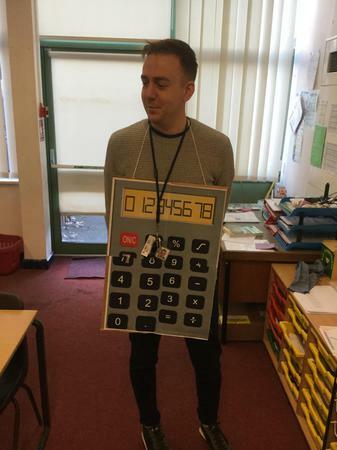 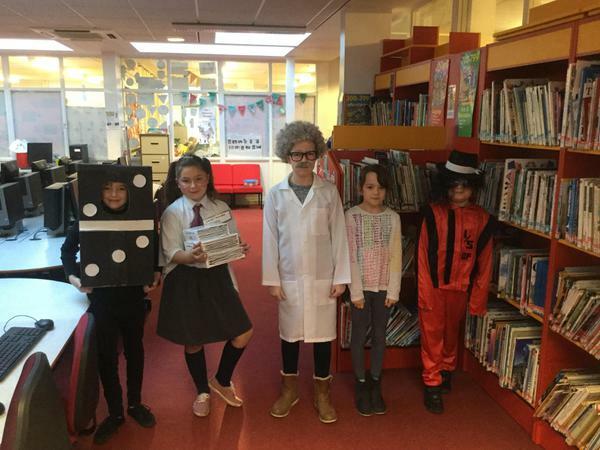 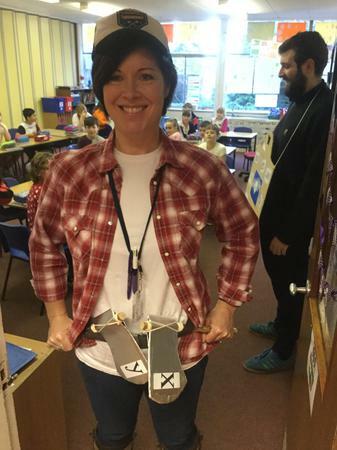 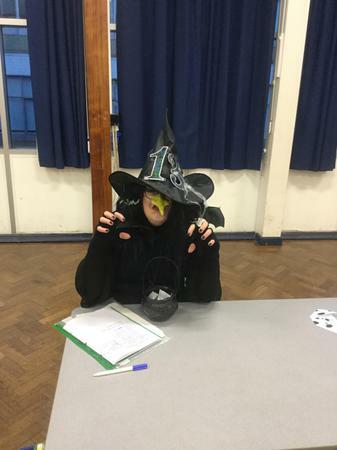 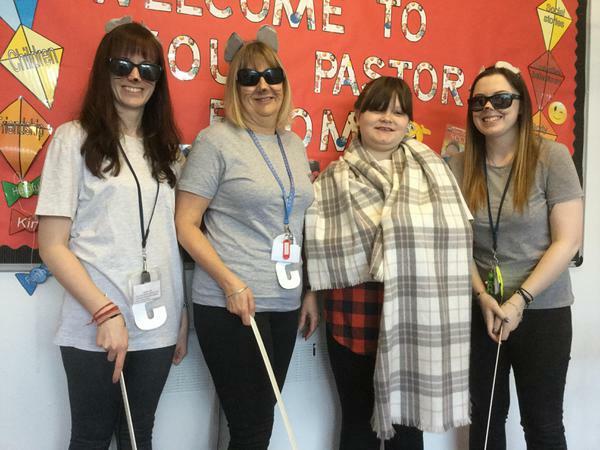 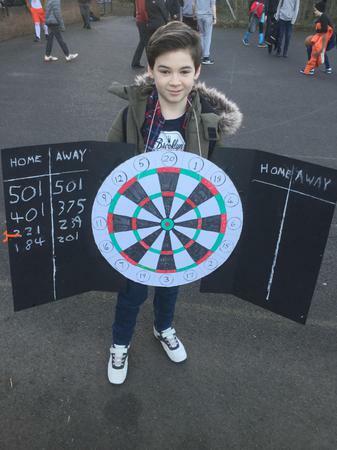 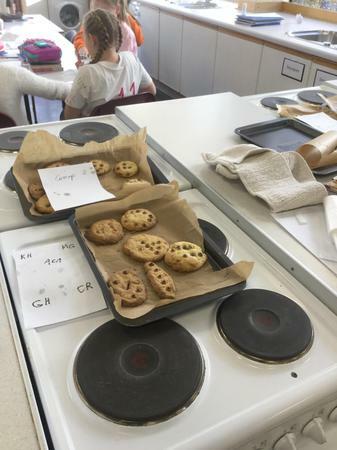 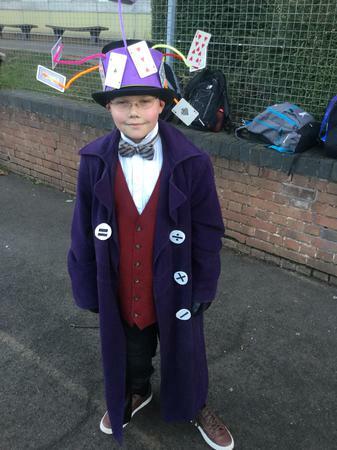 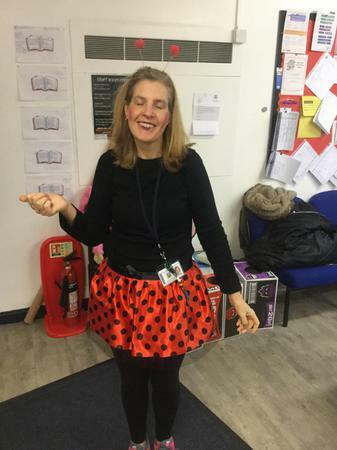 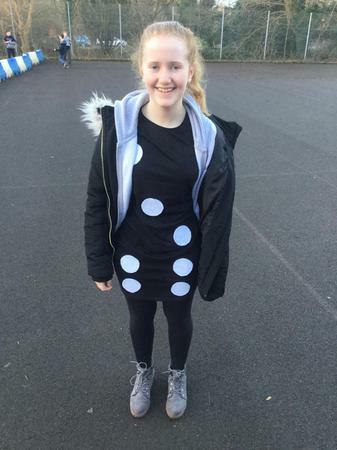 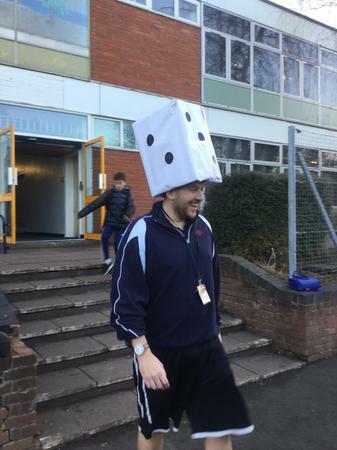 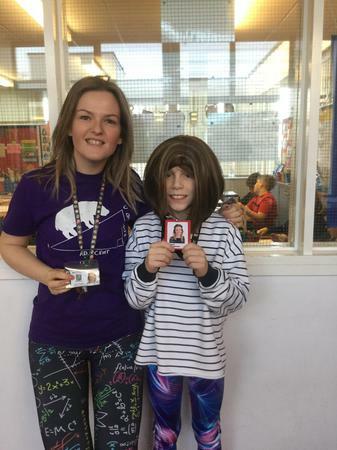 Staff put on a range of creative activities for the children to try something new that gave pupils the chance to get in the spirit of the big day. 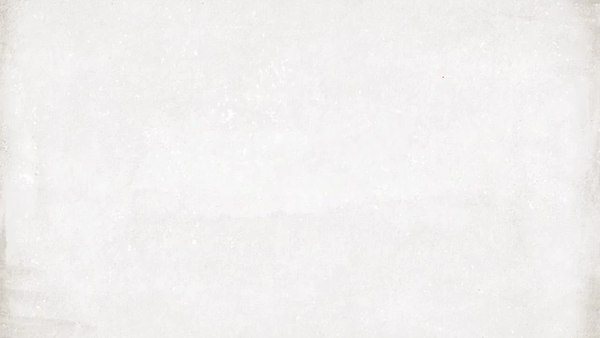 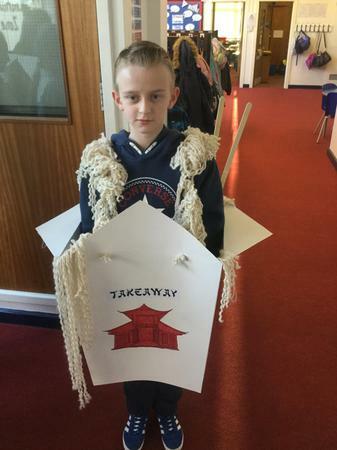 Watch the video below for a flavour of the day! 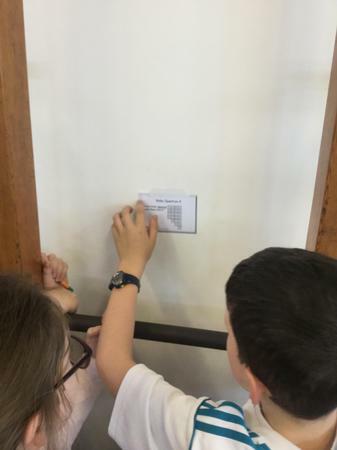 As we approach the end of Spring term, it is time for the special reward to all of the children in the house that earned the most house points. 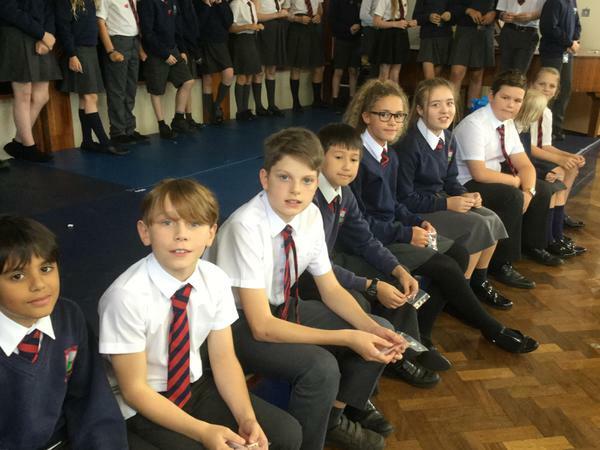 All pupils can earn house points for their particular house by earning bronze, silver, gold and platinum certificates linked to our 6Rs Learning Behaviours, as well as through participation in our various house competitions. 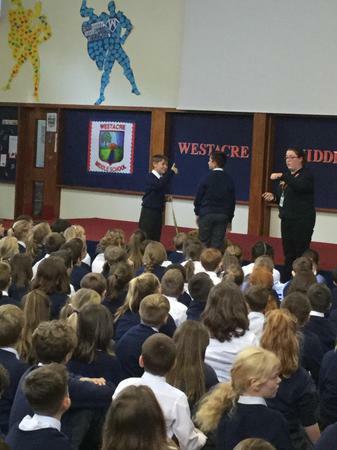 This term’s winning house is Attenborough. 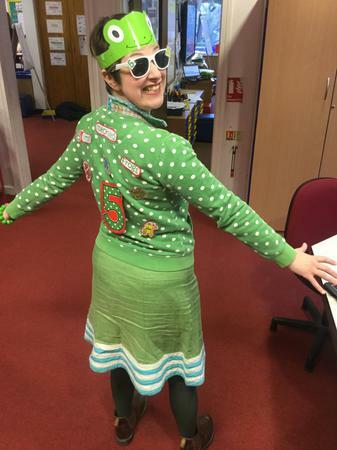 The children and staff in this house showed much effort in incorporating much green into their clothes as part of a special non-uniform day! 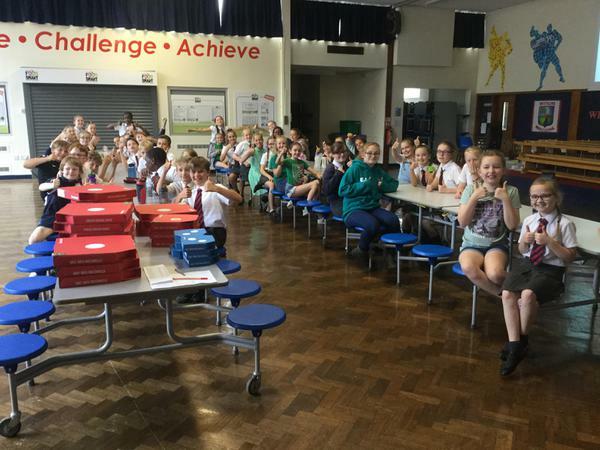 Well done to all of Attenbrough house for the achievement this term, as well as all of the pupils in the other houses who offered their congratulations on this day of celebration! 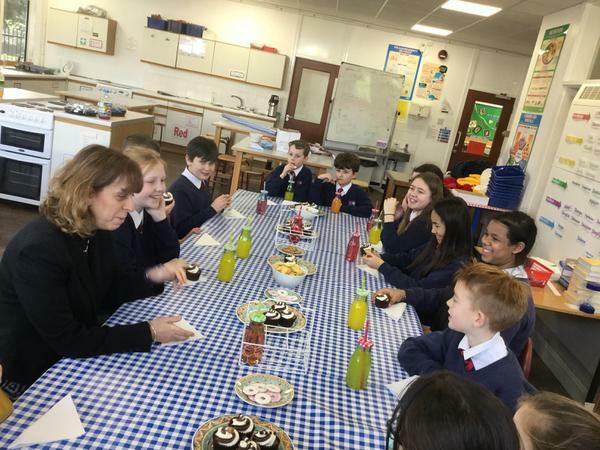 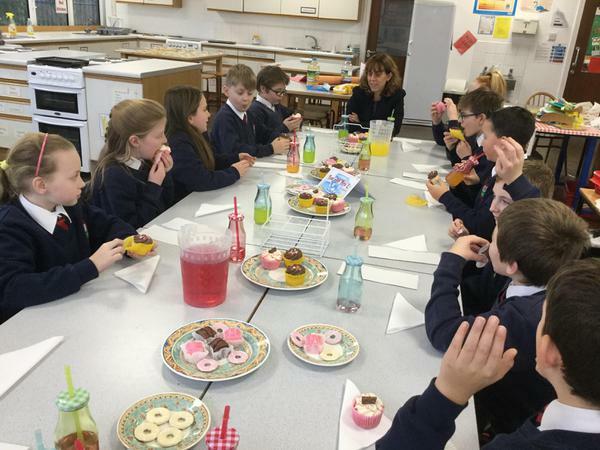 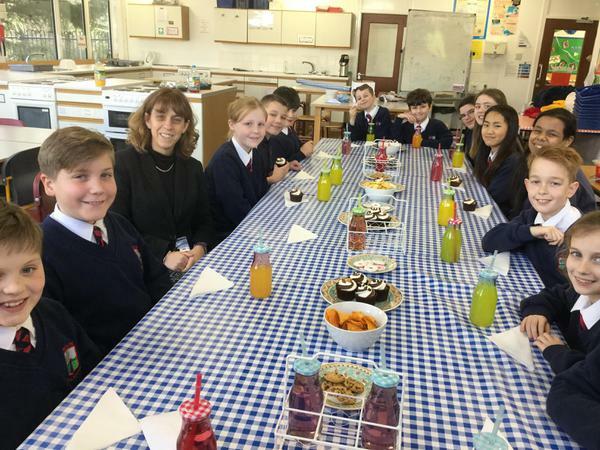 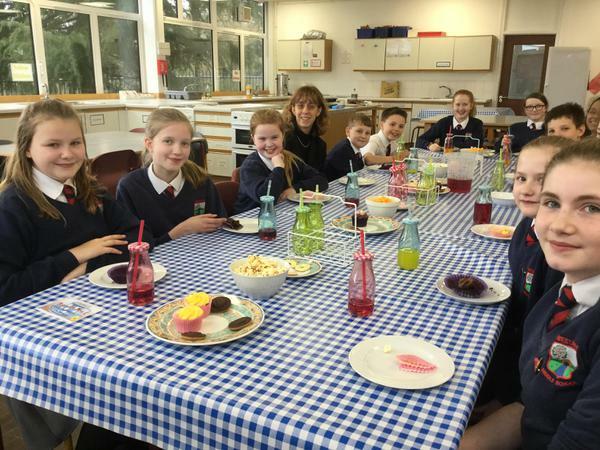 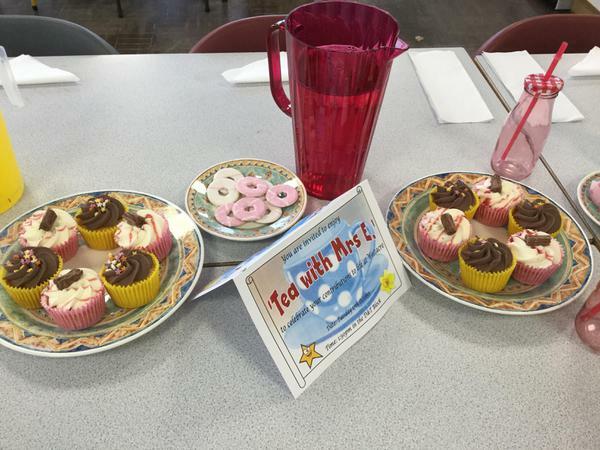 Congratulations to all the children who were invited to Tea with Mrs E this afternoon. 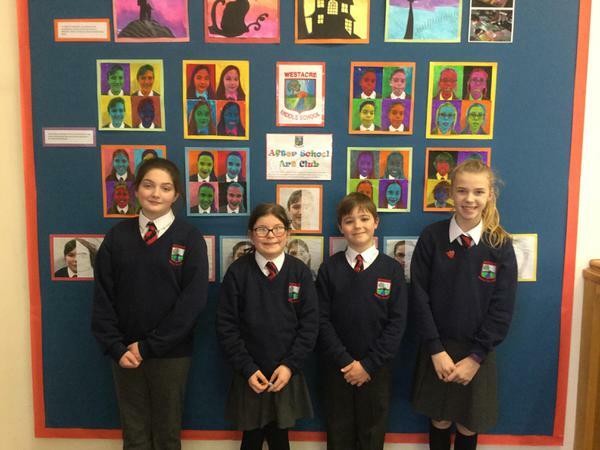 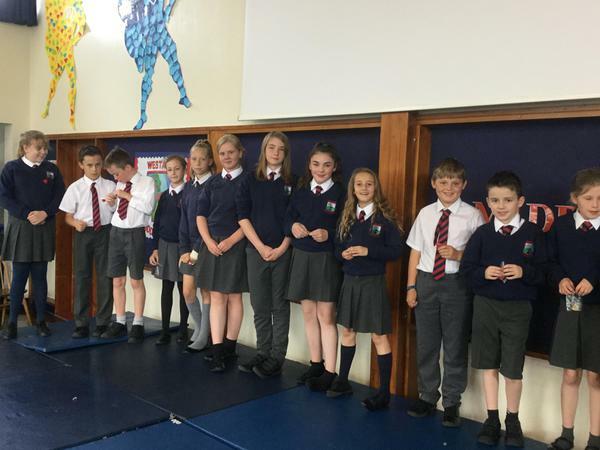 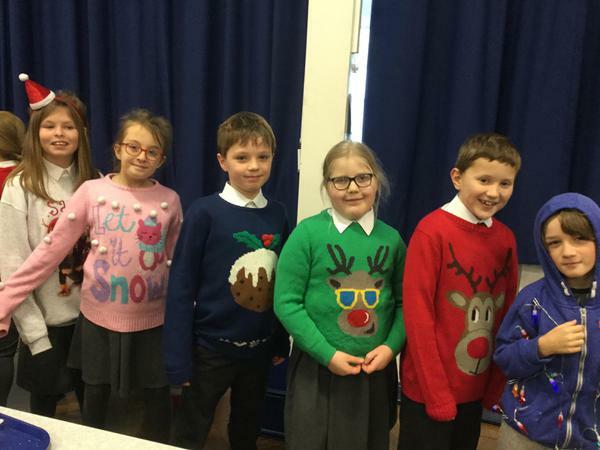 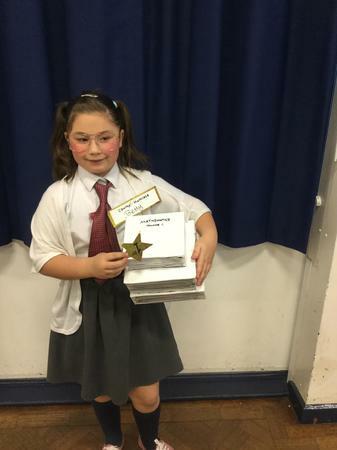 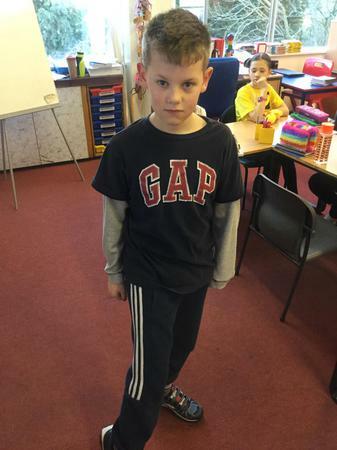 The children were selected by their class teachers for consistently working hard – well done! 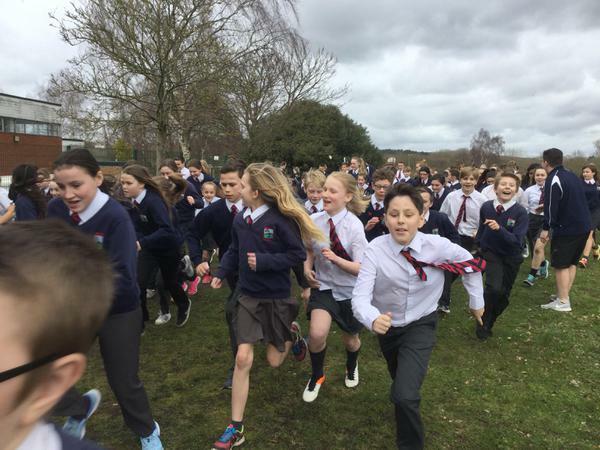 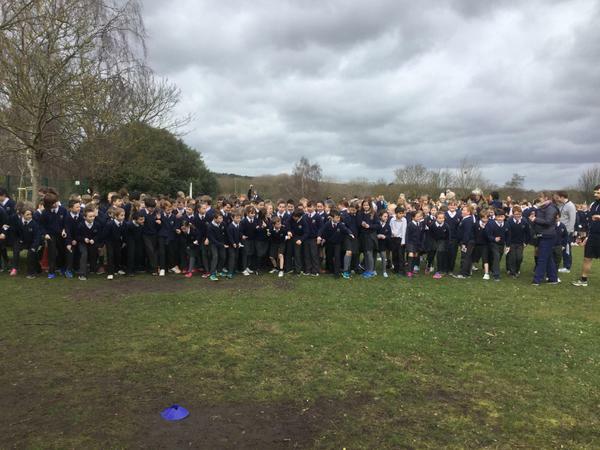 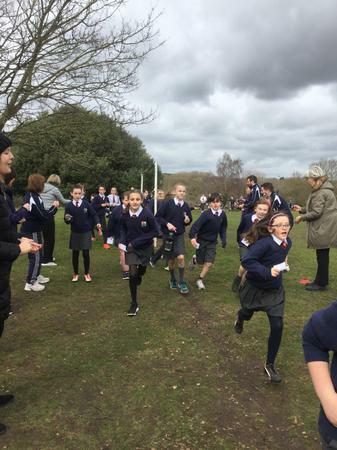 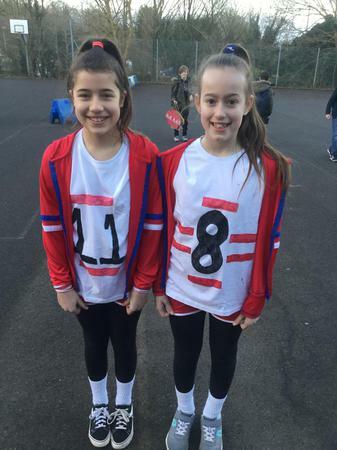 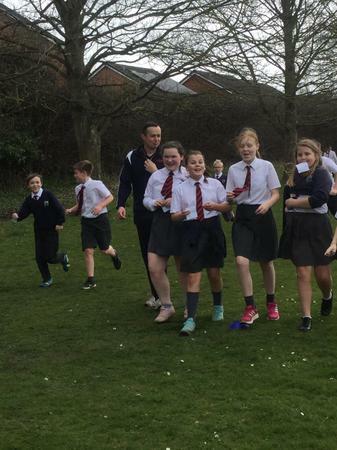 Staff and pupils thoroughly enjoyed the challenge of running the Sport Relief Mile this year! 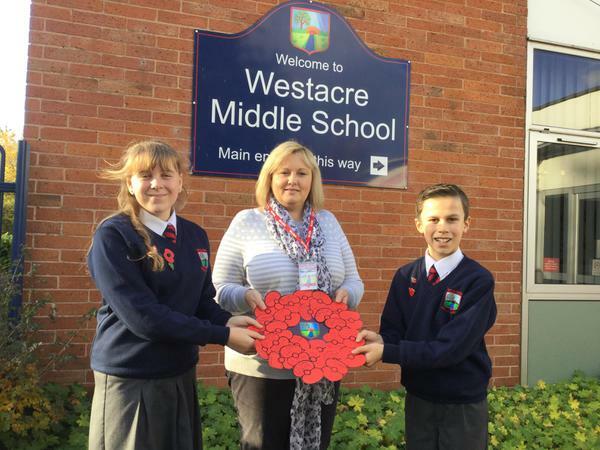 With all of the sponsorship money added up, we are very pleased to announce that Westacre families raised over £750 for this very worthy cause this year. 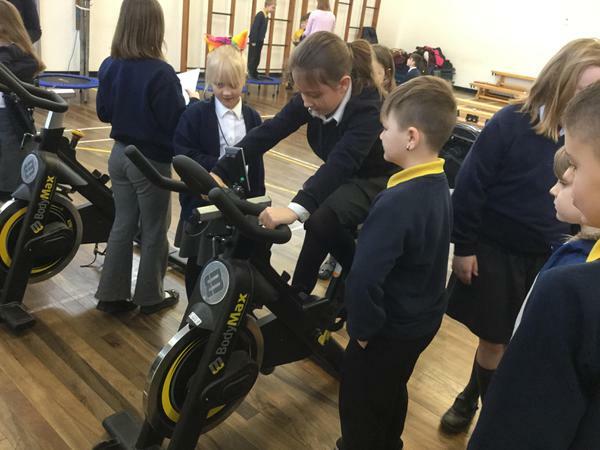 We have spent this week promoting our physical and mental wellbeing. 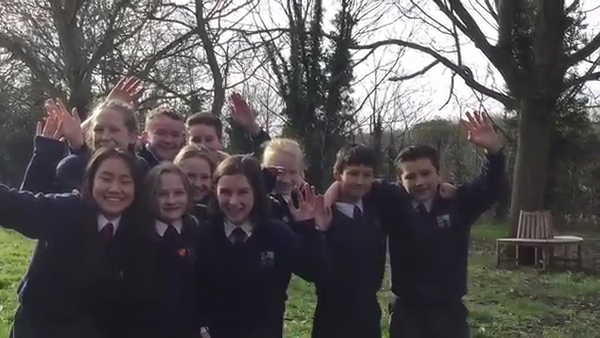 Have a look at our video showing just a few of the many highlights of the week. 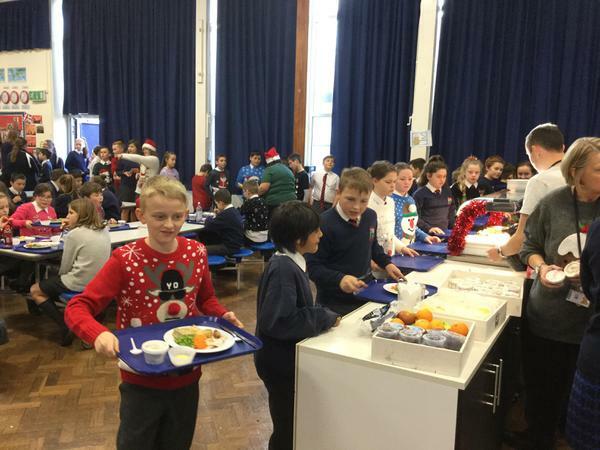 As a school we always acknowledge and reward good behaviour and hard work. 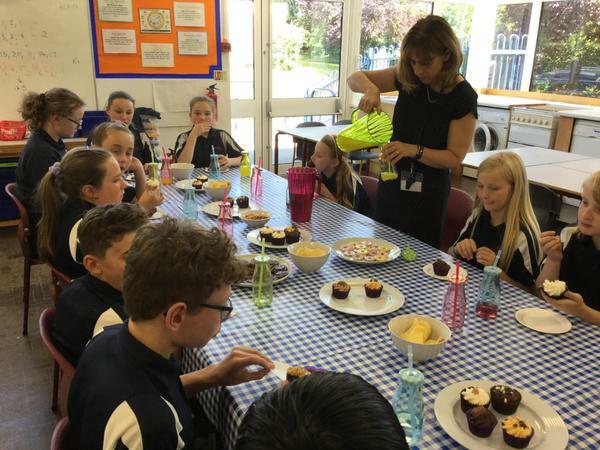 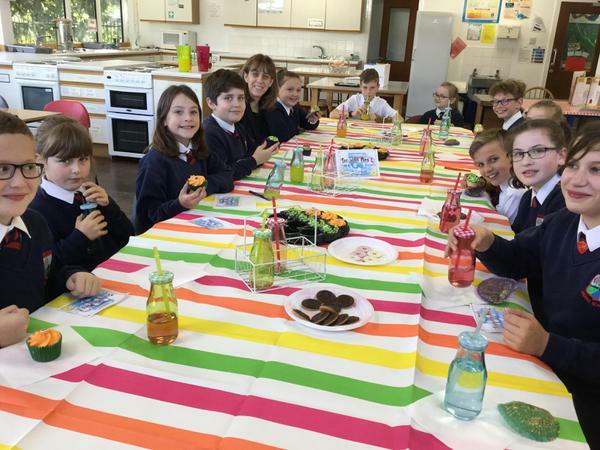 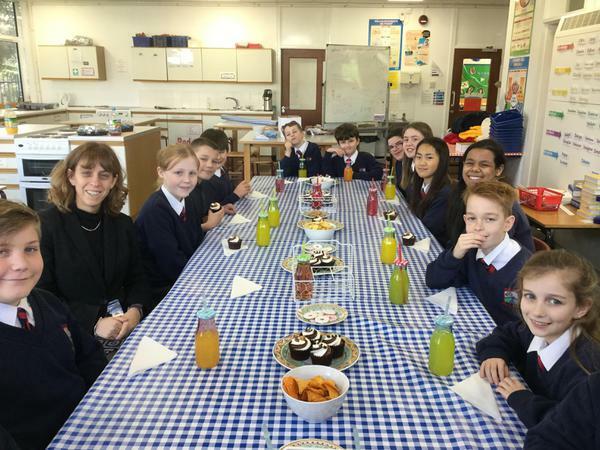 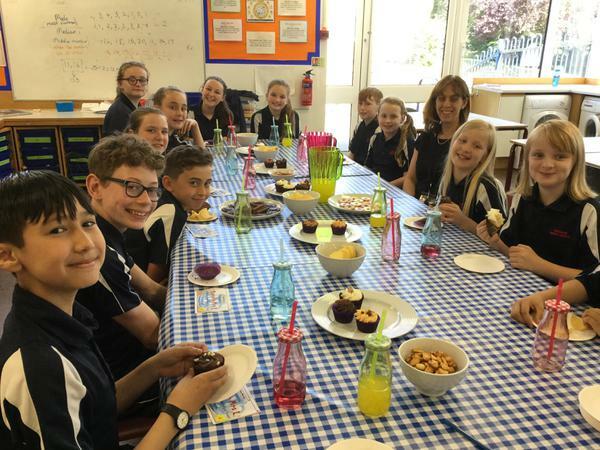 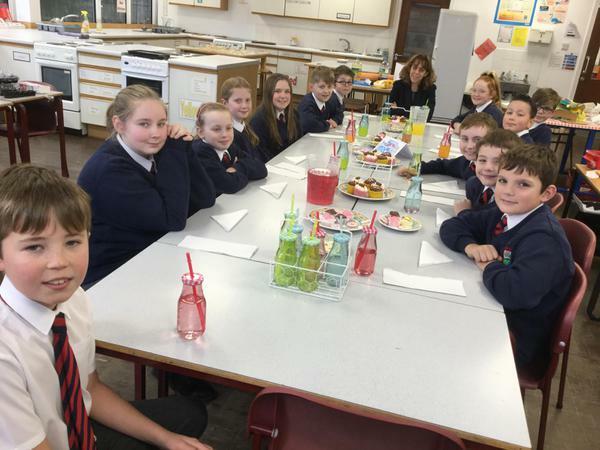 This year we have introduced, “Tea with Mrs E.” Each half term one child from each class will be invited to afternoon tea with Mrs Evans as a reward for working hard and consistently making good choices in school. 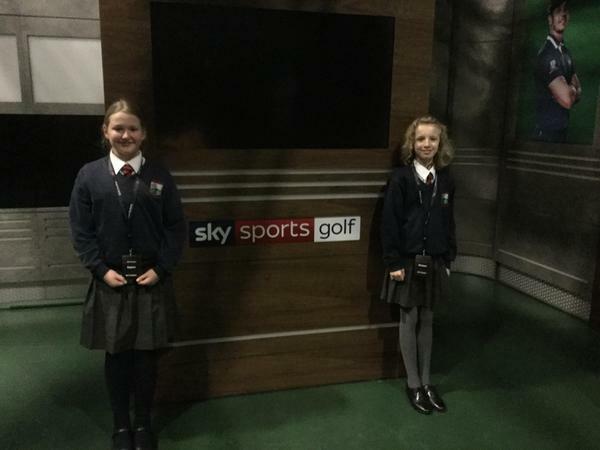 Well done to our latest guests! 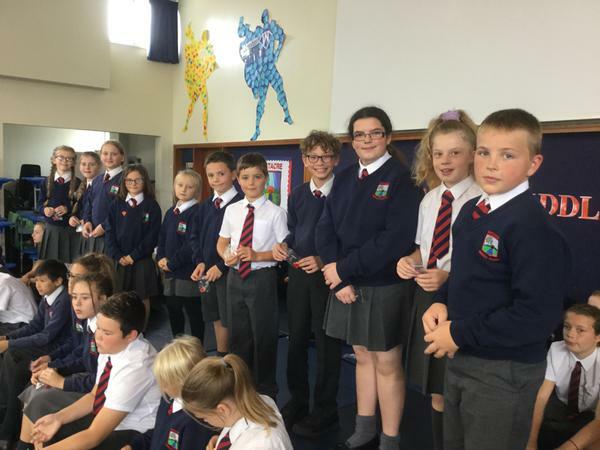 Isabelle Gilbey, Joseph Connor, Miller Smith, Ellee Garside, Archie Chesson Willets, Maggie Collins, Oliver Barker, Laurie Holder, Tom Allen, Abi Davis, Phoebe Davies, Aya Misawa, Jamie Reeve & Rochelle Harris! 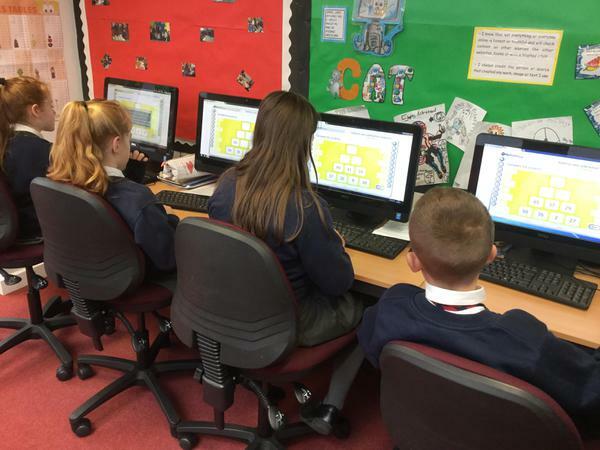 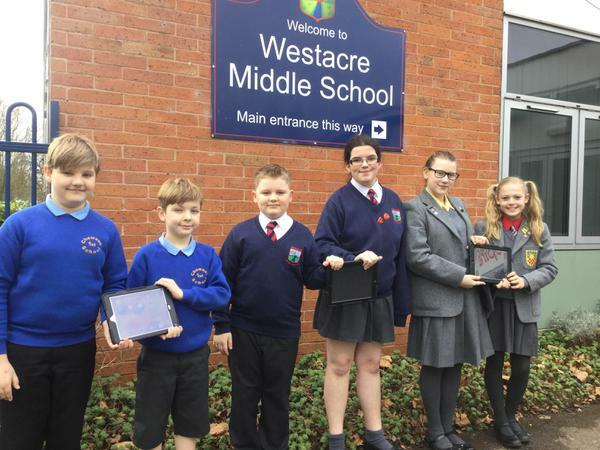 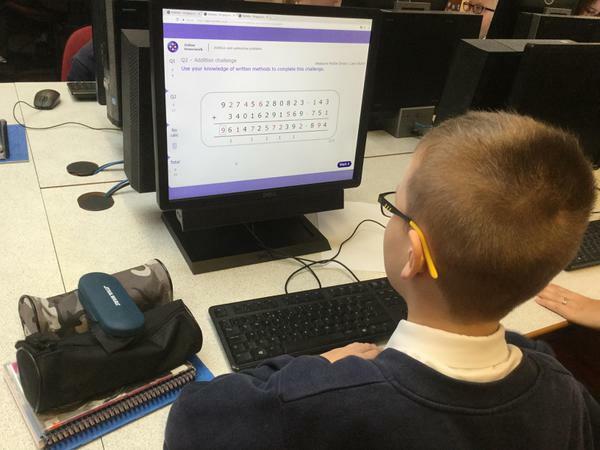 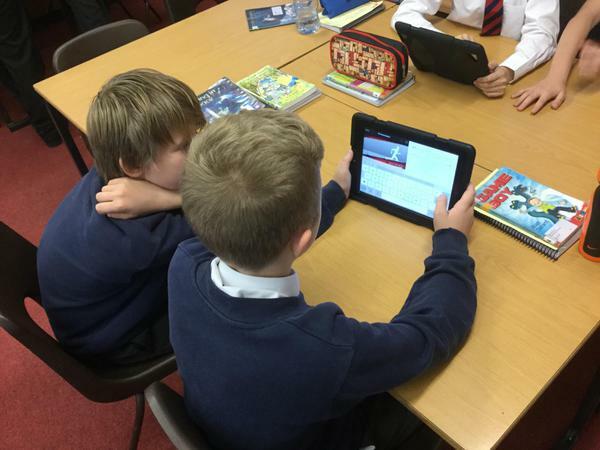 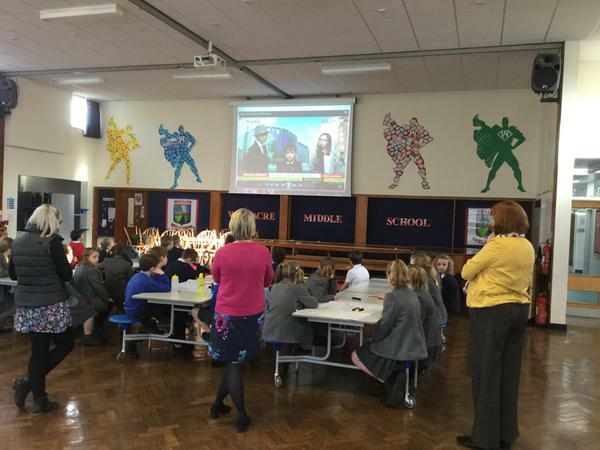 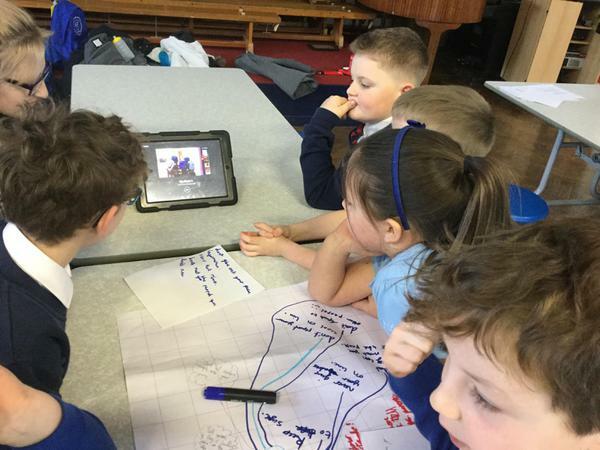 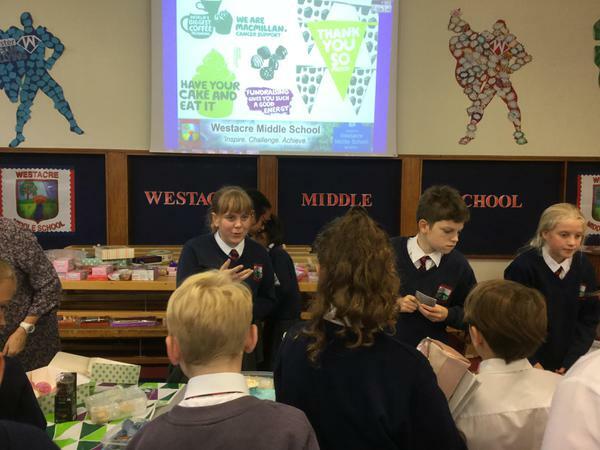 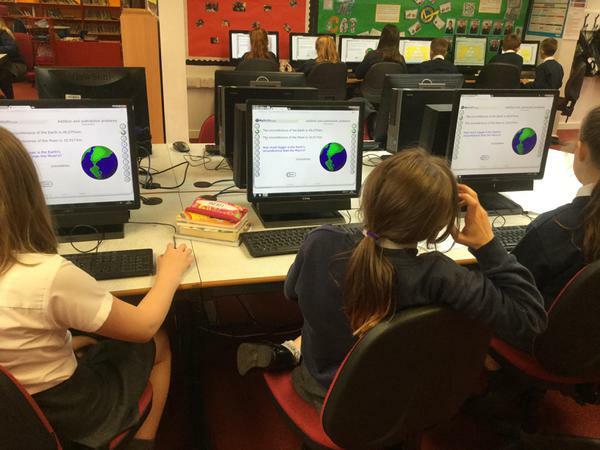 As part of a range of events linked to Safer Internet Day, we welcomed digital leaders from Chawson, Dodderhill and Ombersley schools to Westacre. 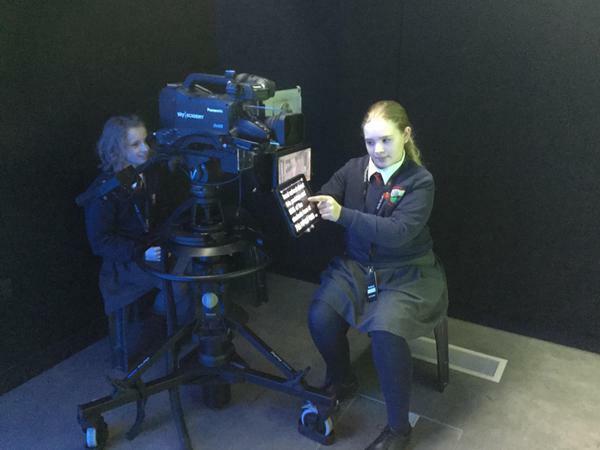 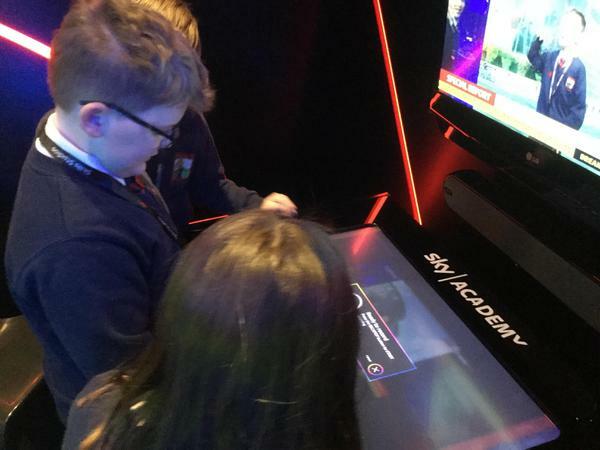 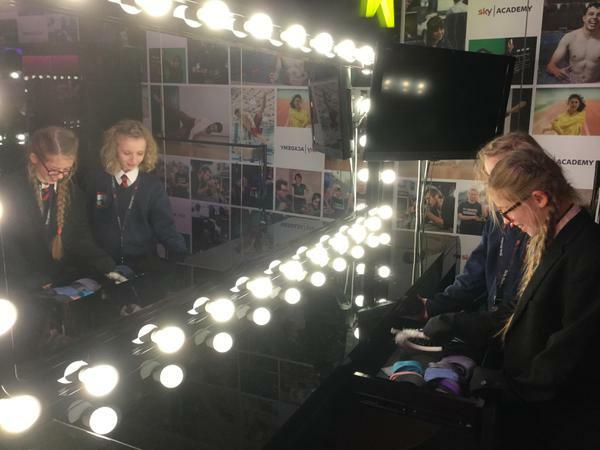 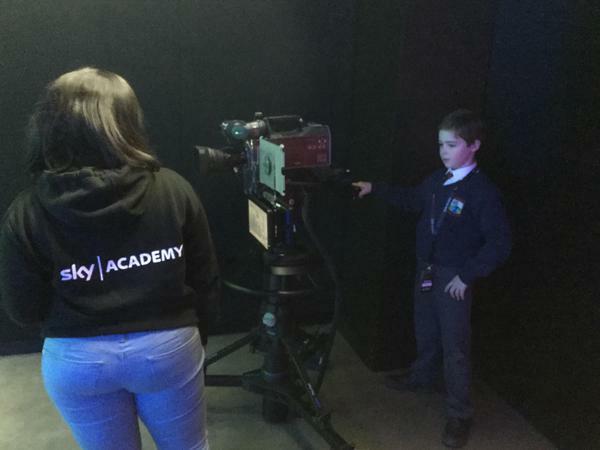 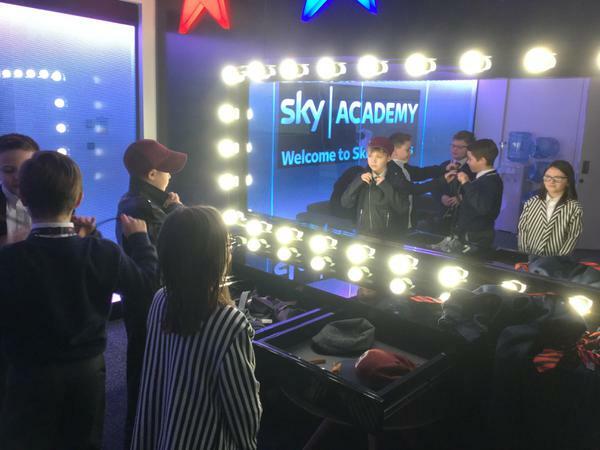 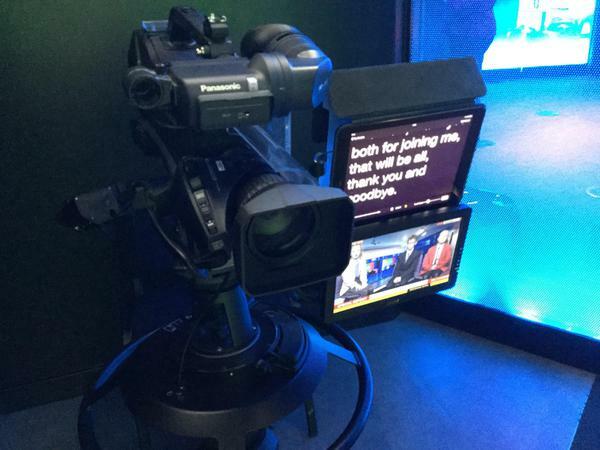 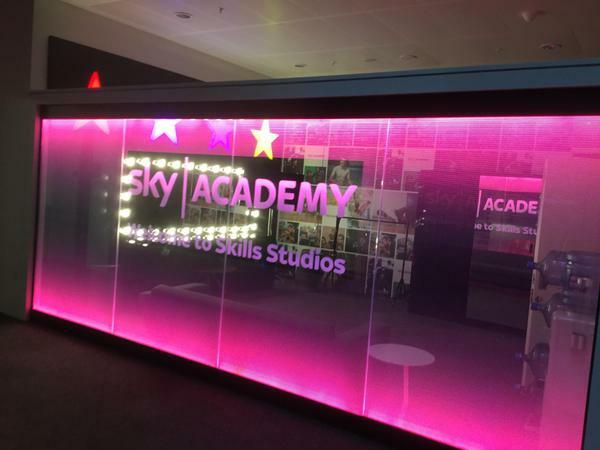 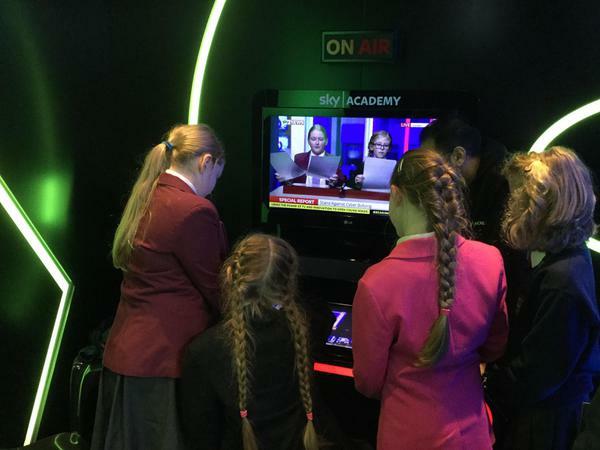 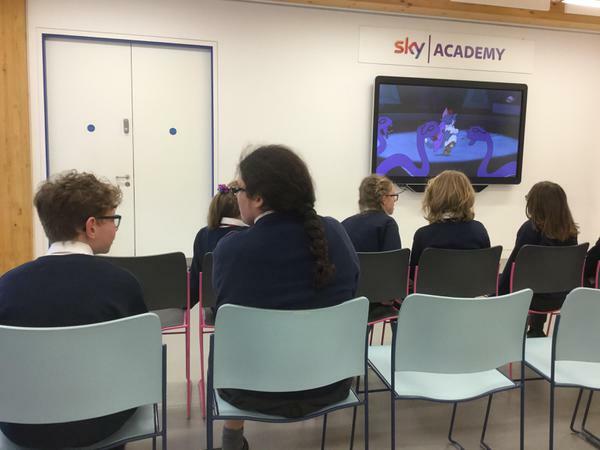 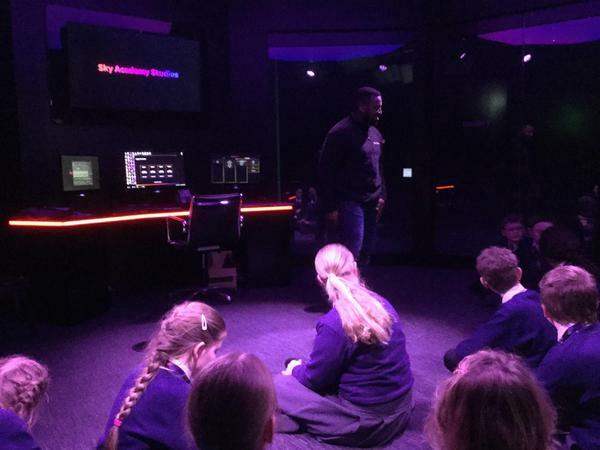 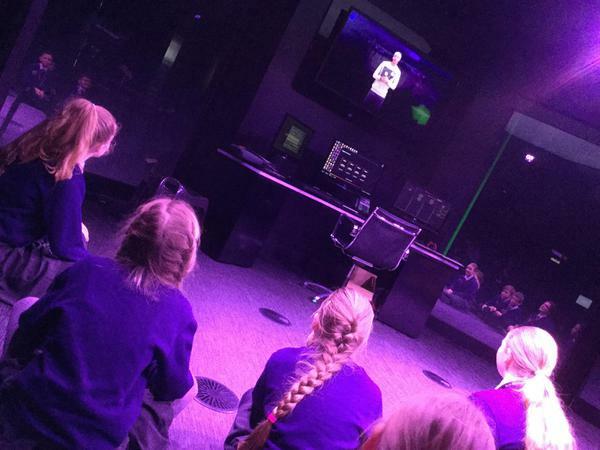 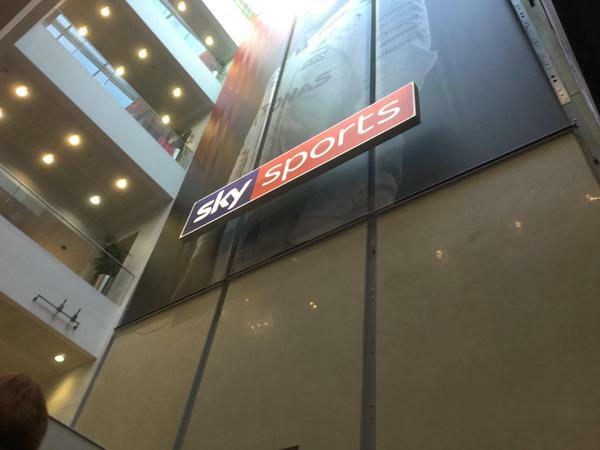 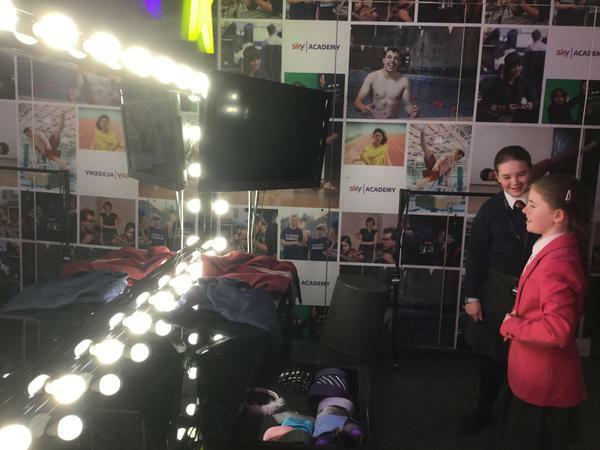 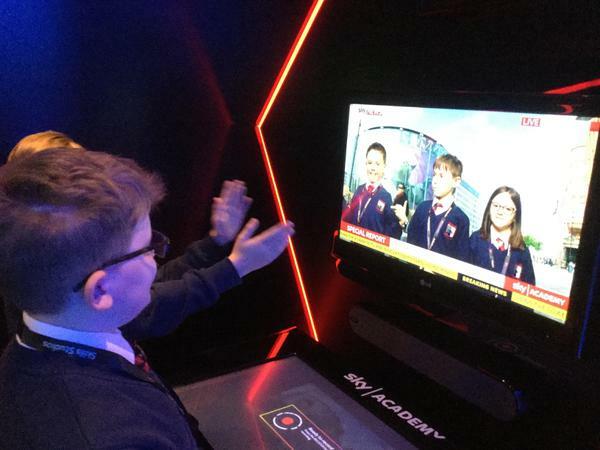 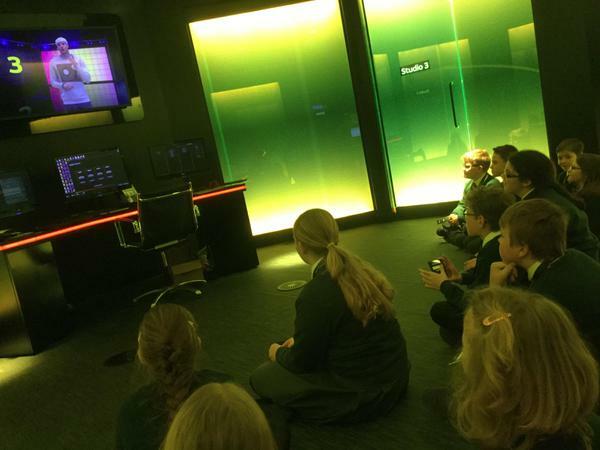 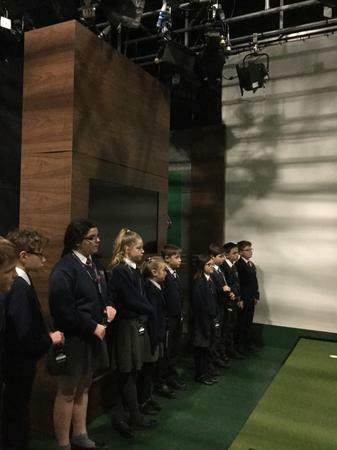 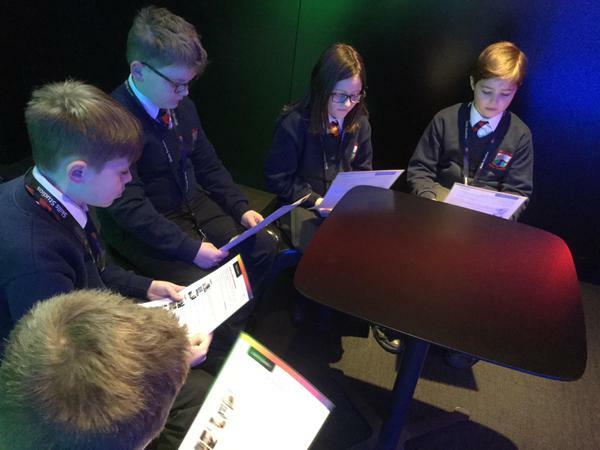 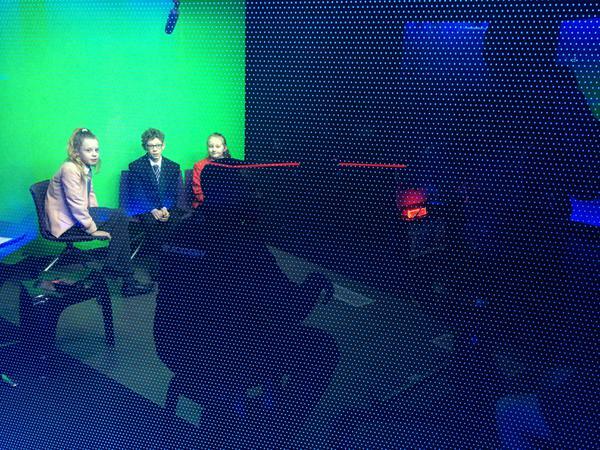 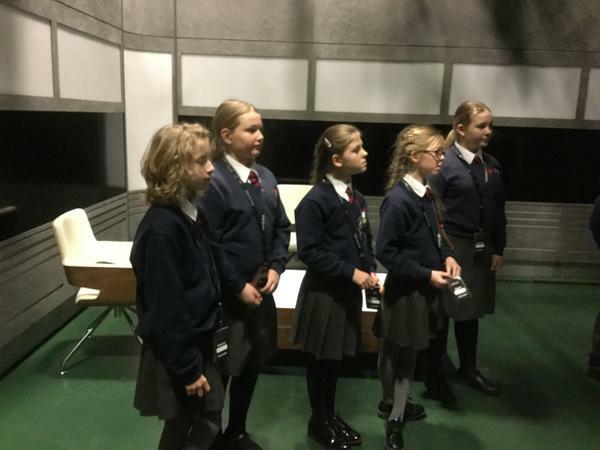 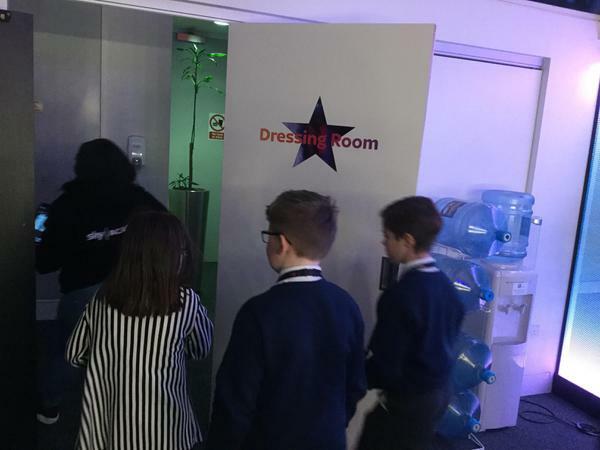 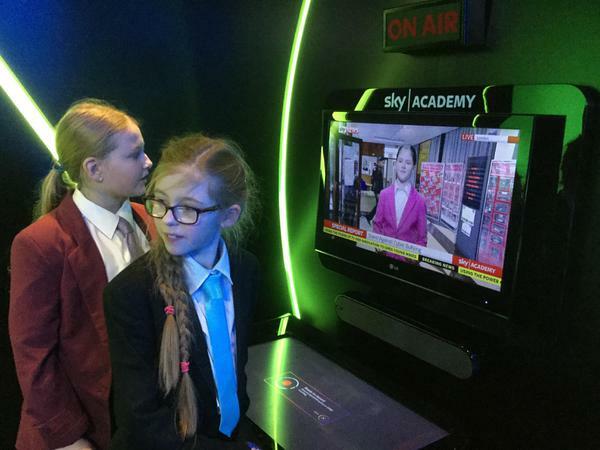 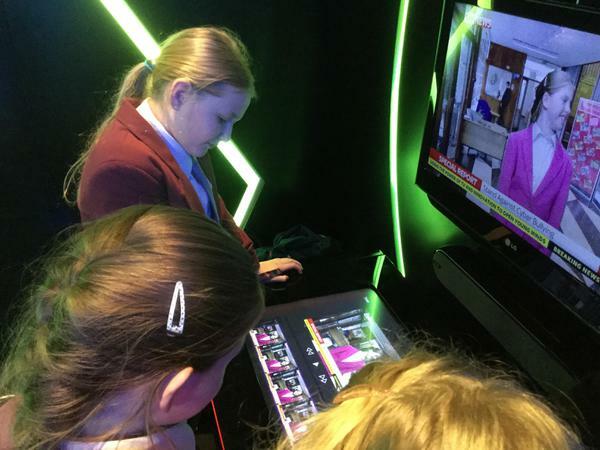 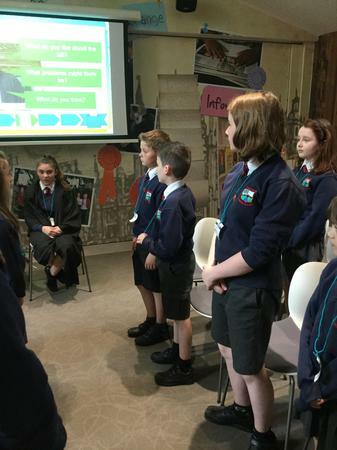 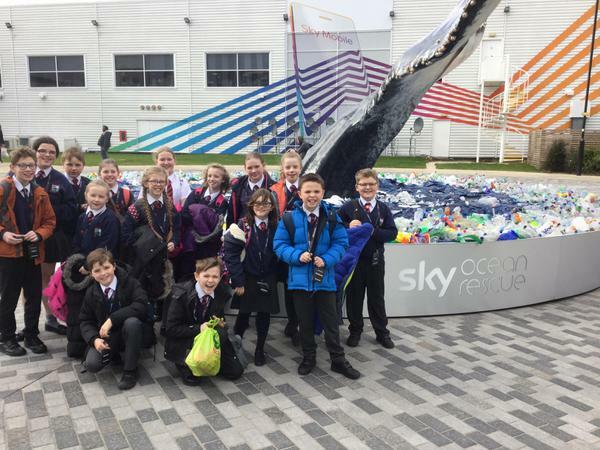 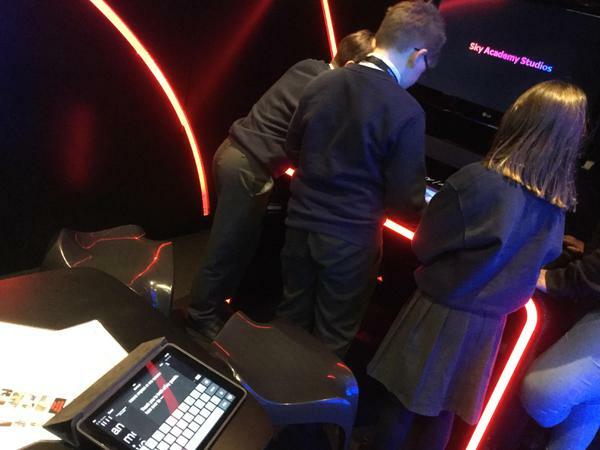 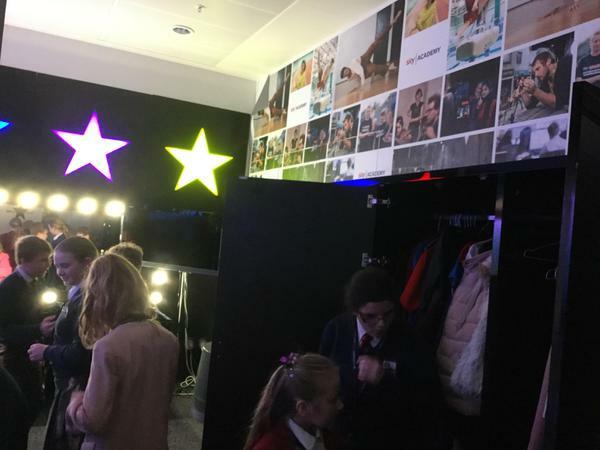 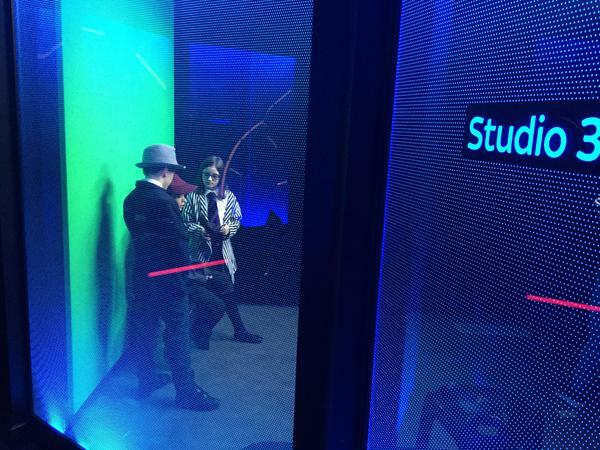 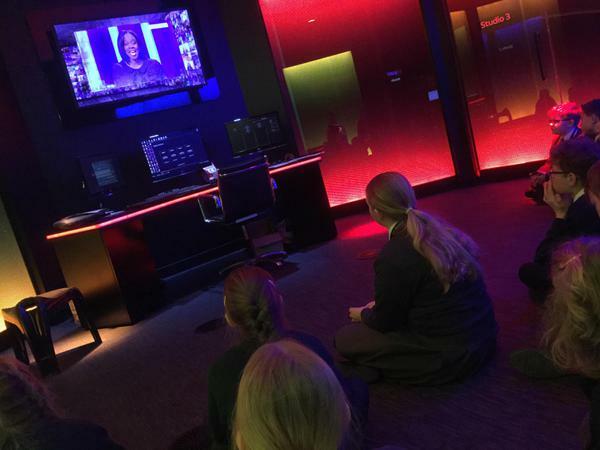 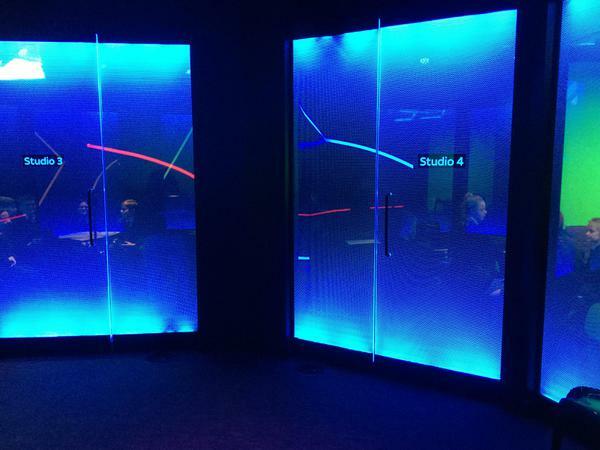 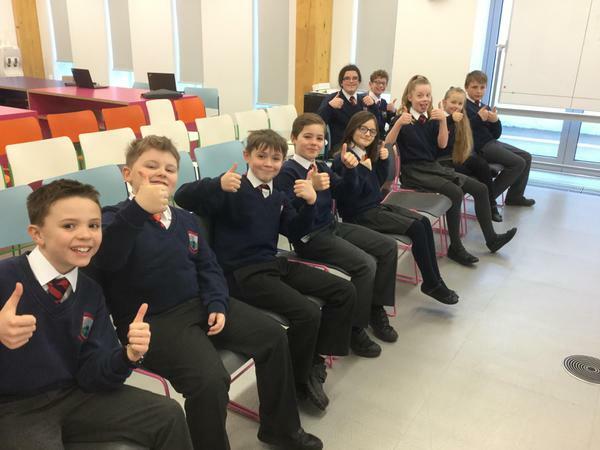 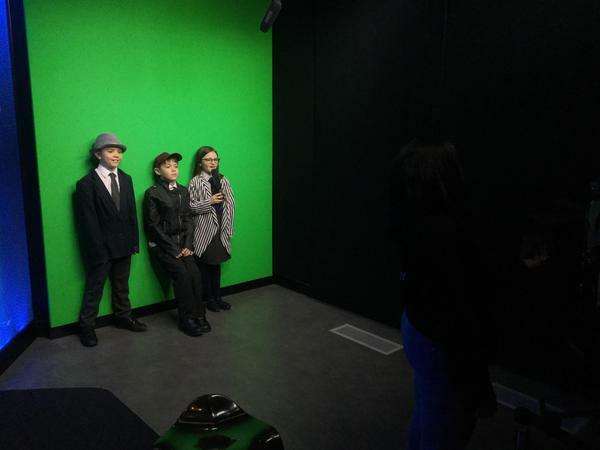 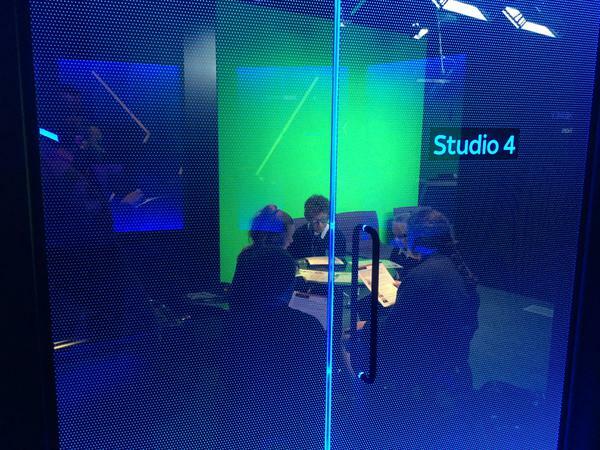 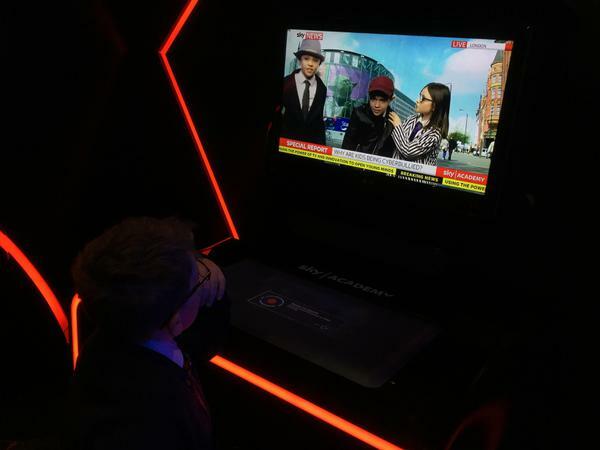 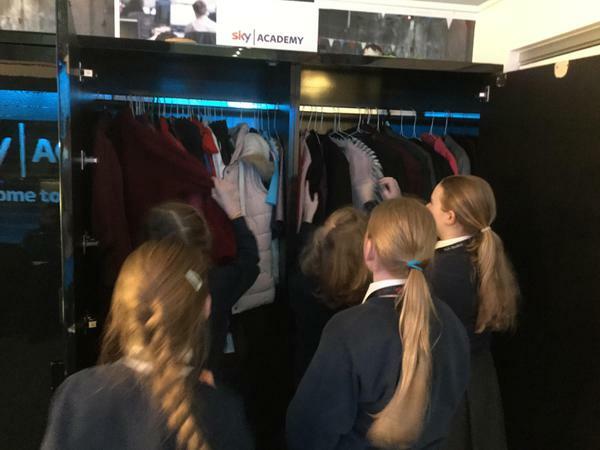 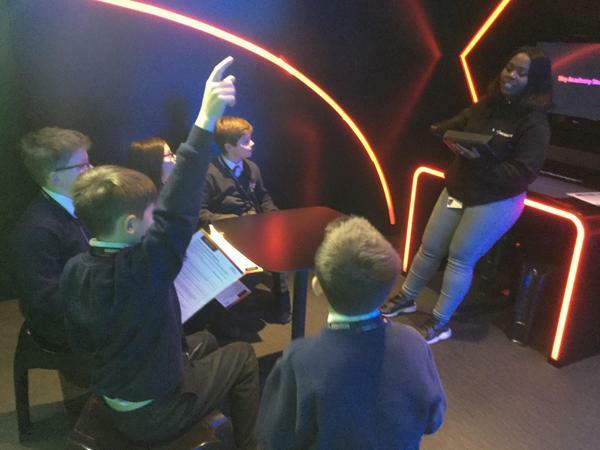 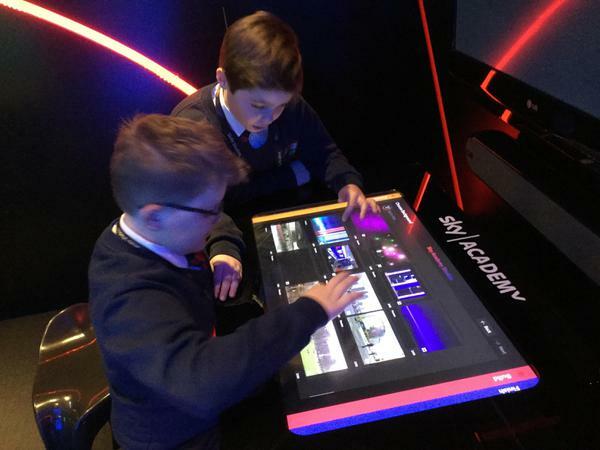 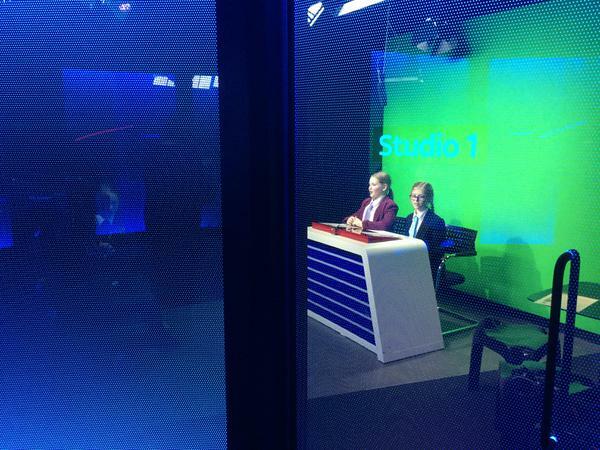 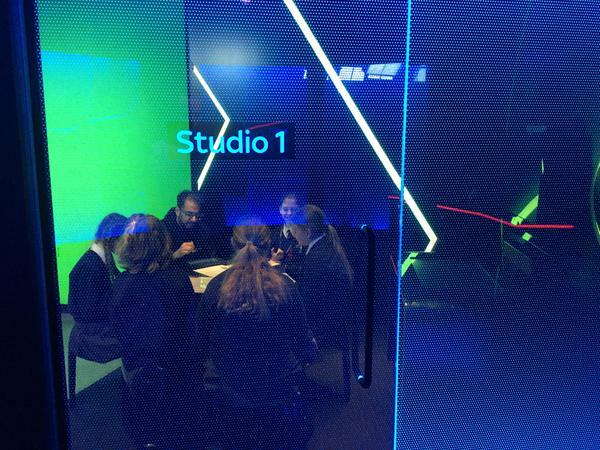 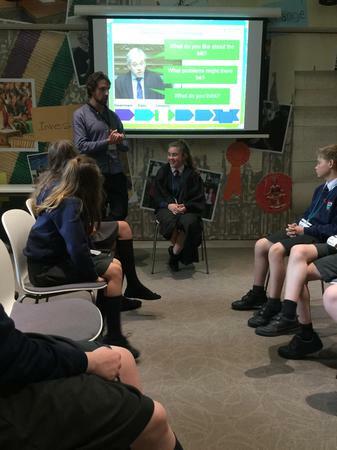 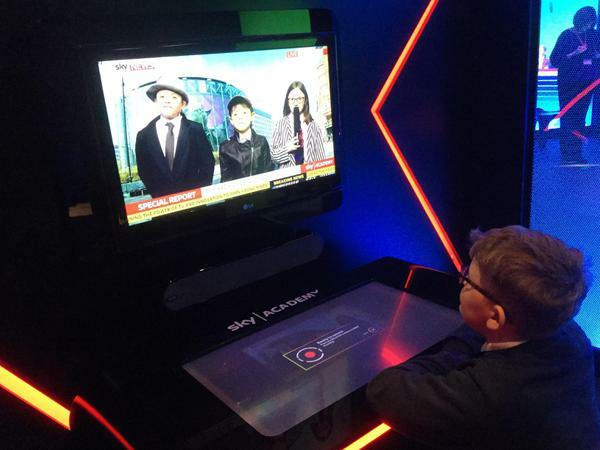 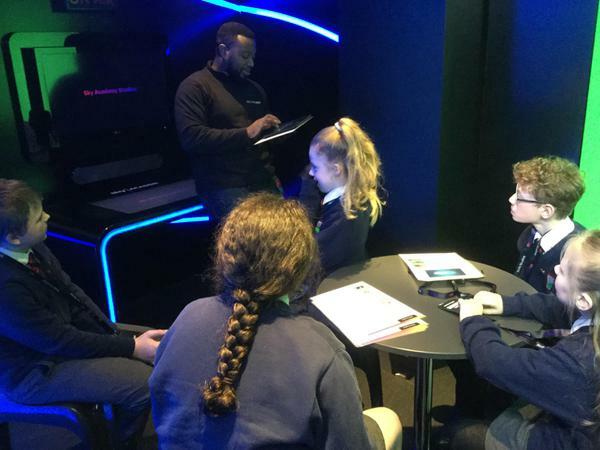 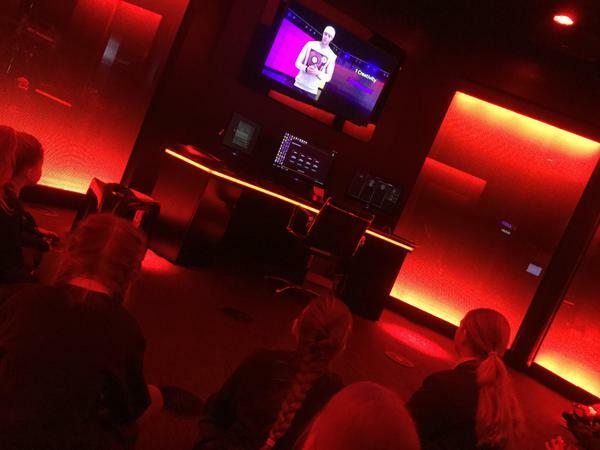 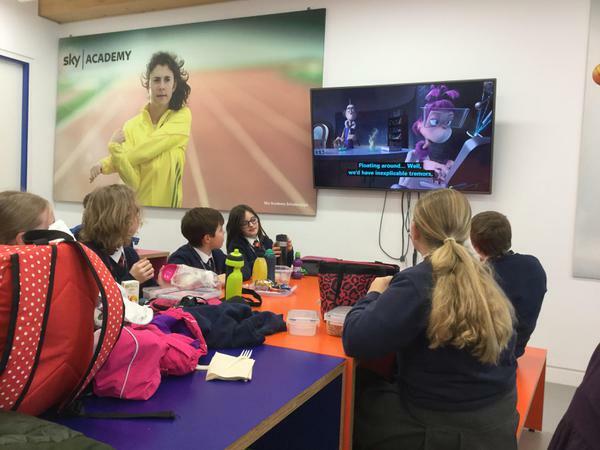 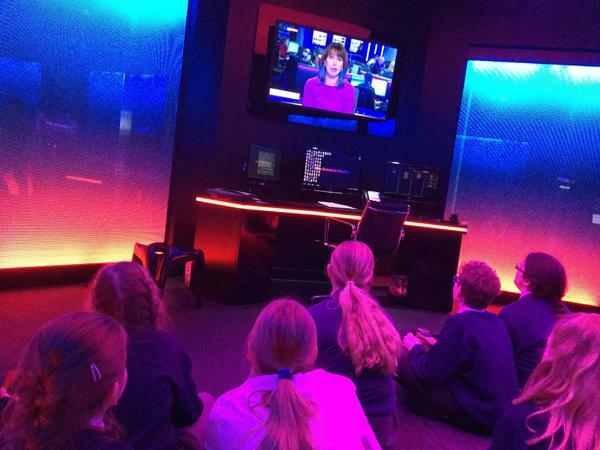 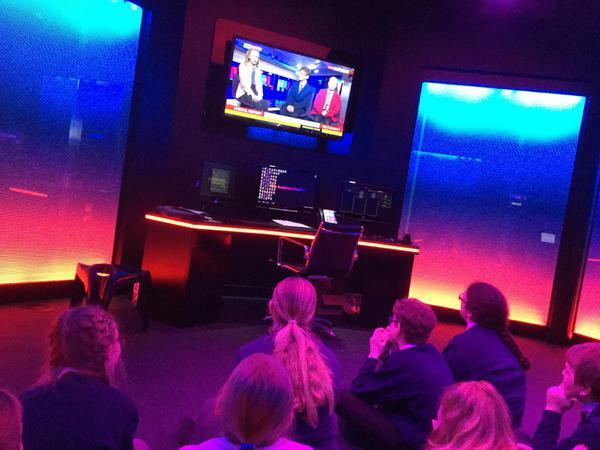 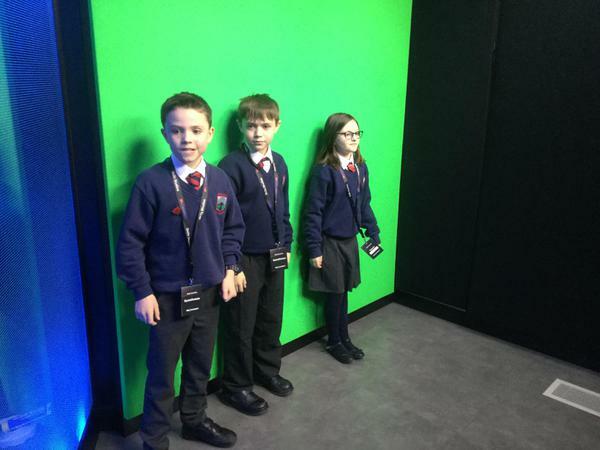 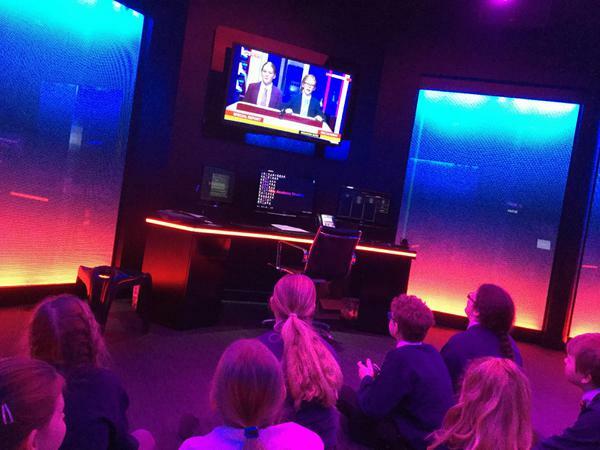 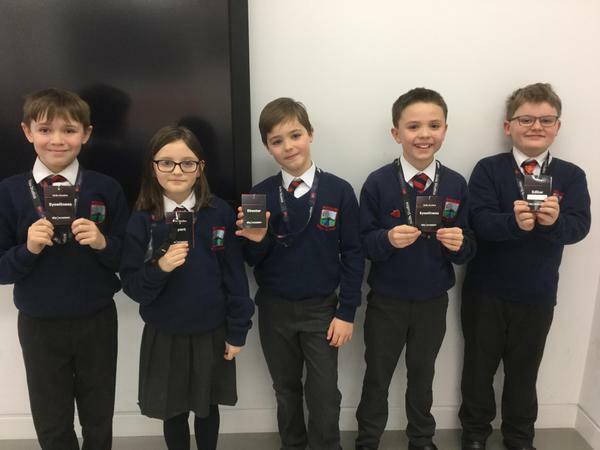 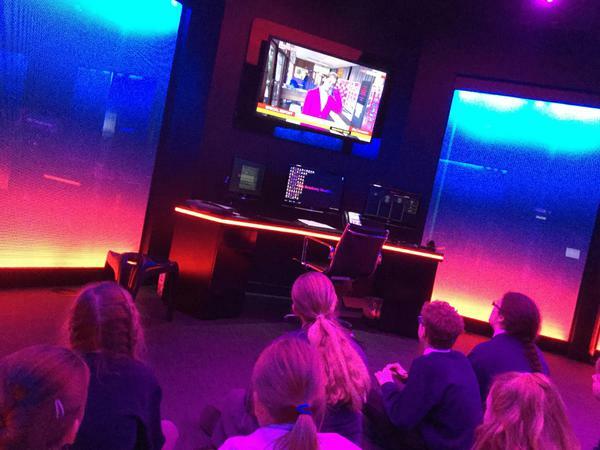 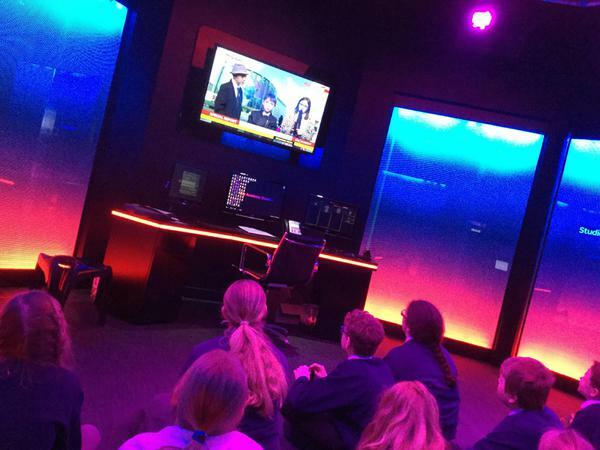 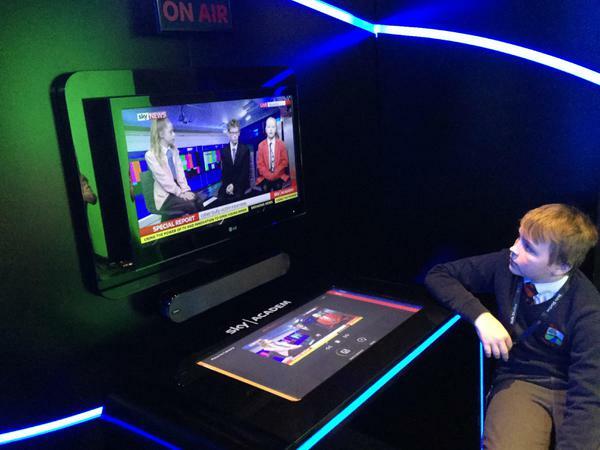 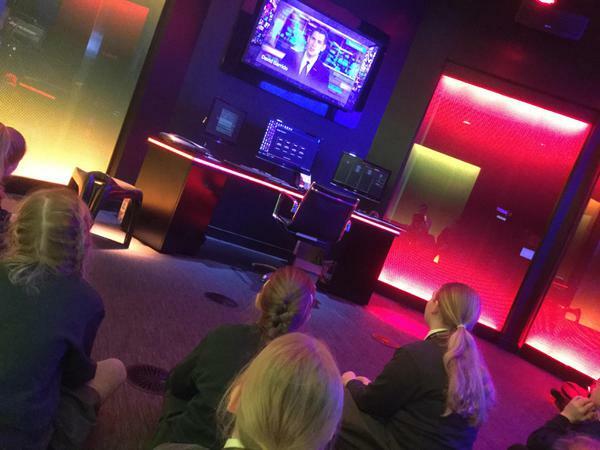 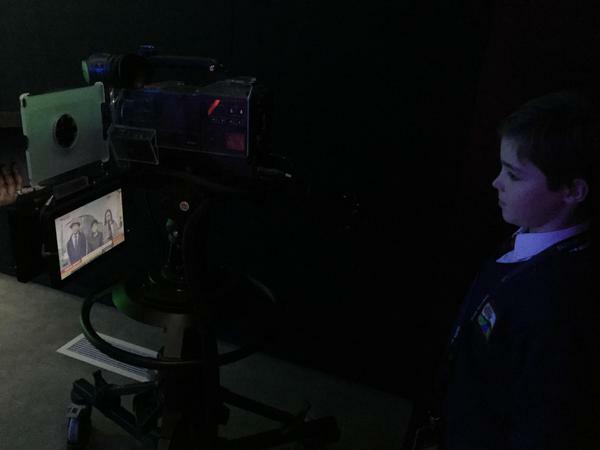 Our Cyber Council members showed them the news report they created at the Sky TV Studios before helping them create their own e-safety films to take back to their own schools. 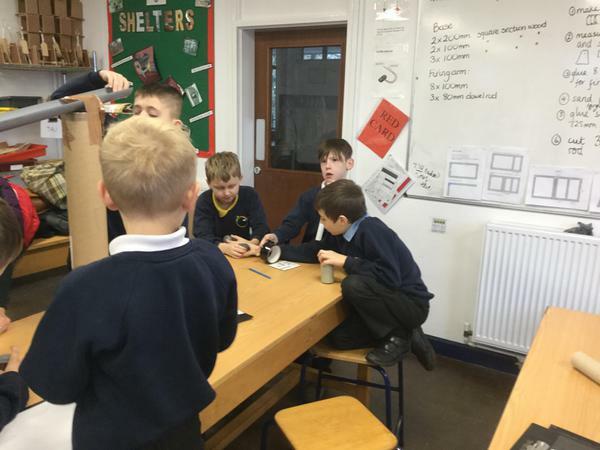 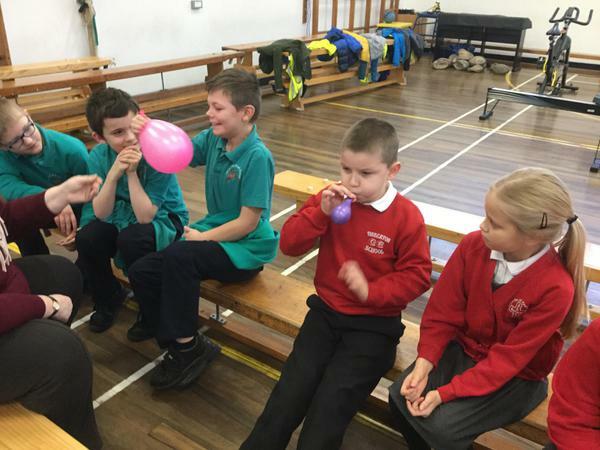 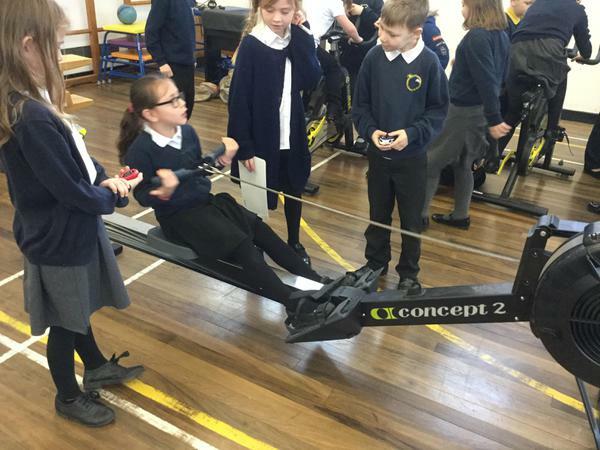 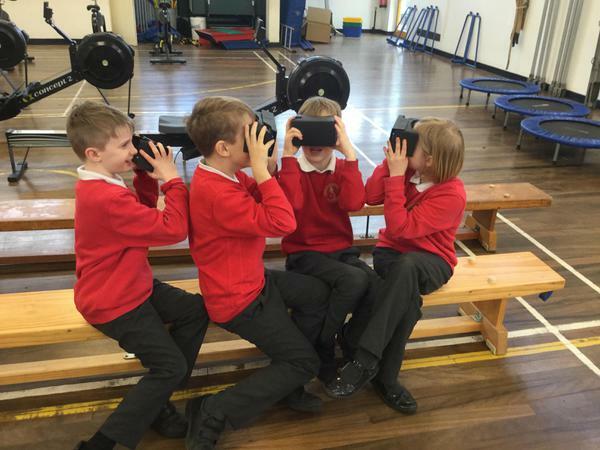 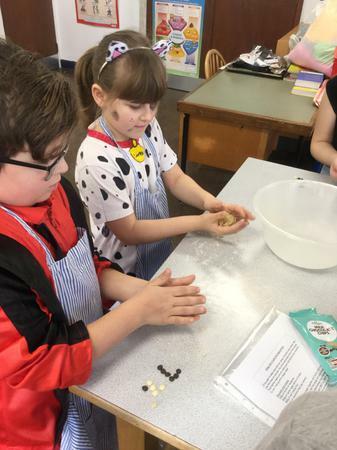 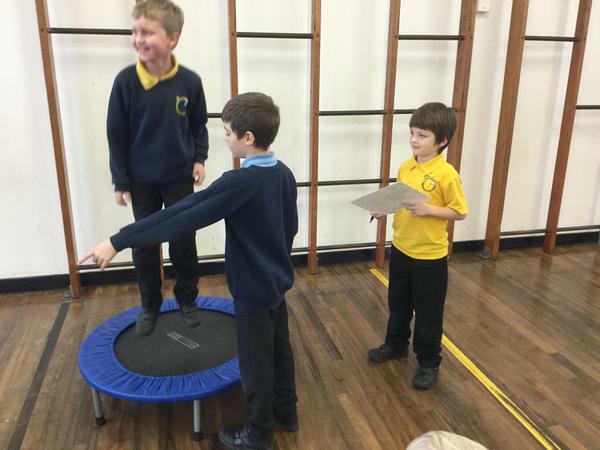 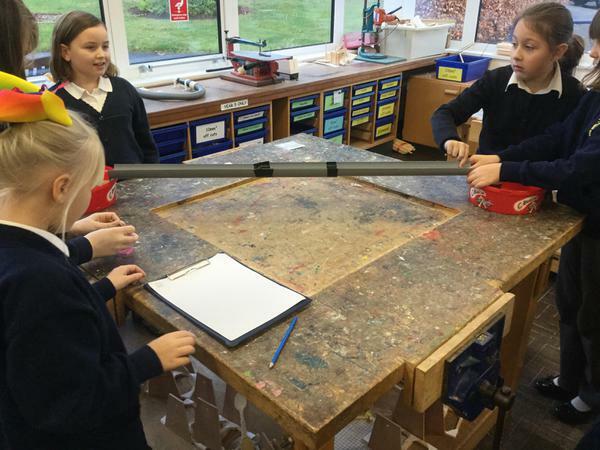 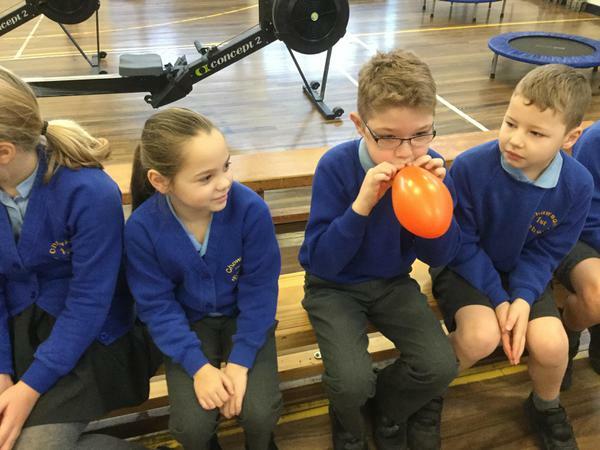 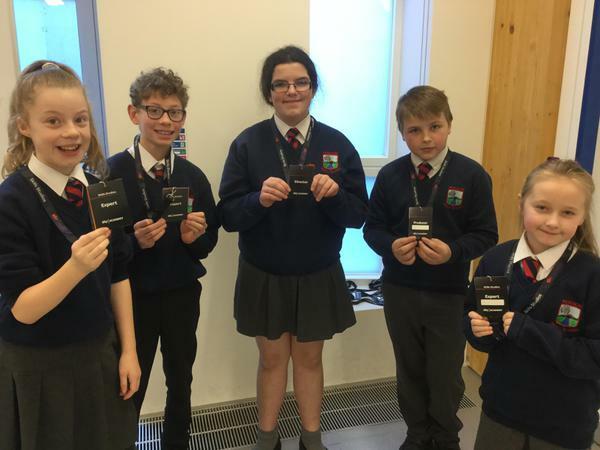 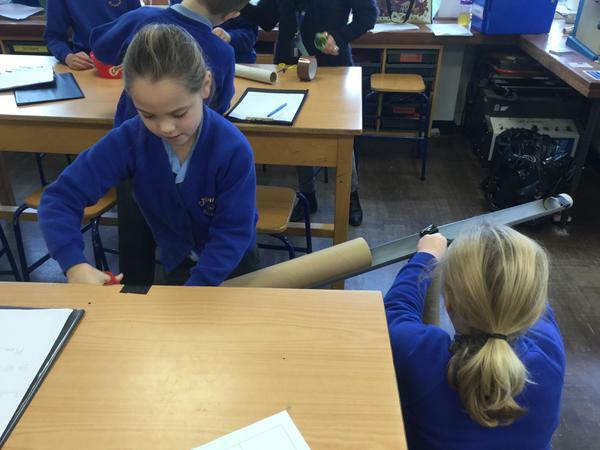 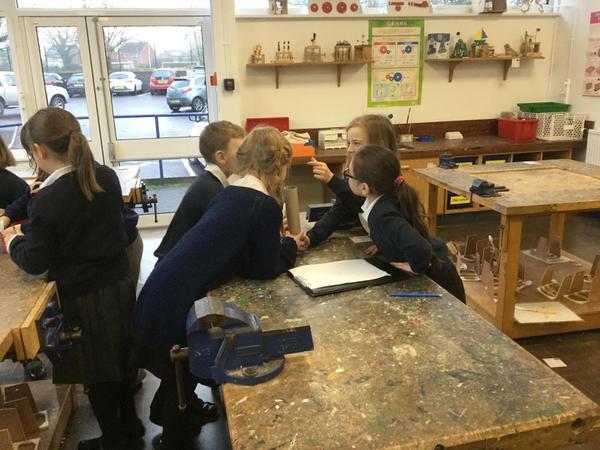 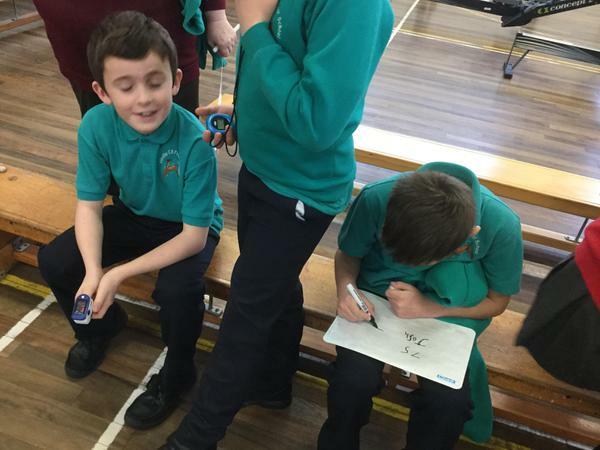 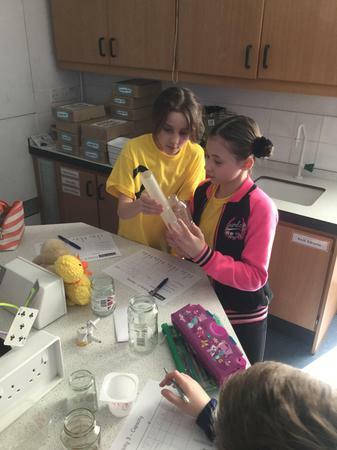 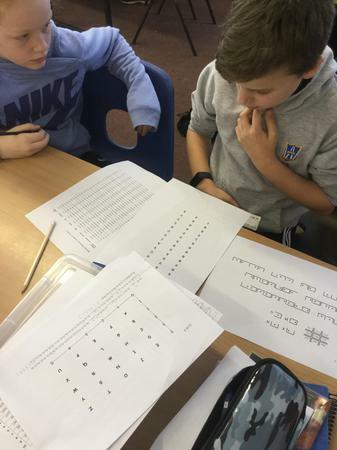 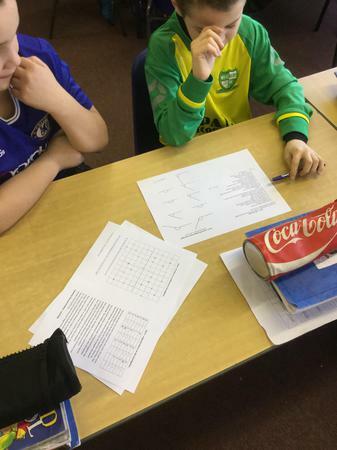 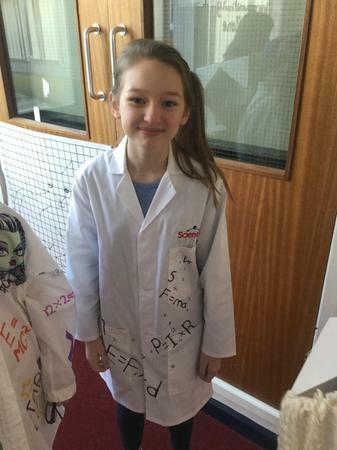 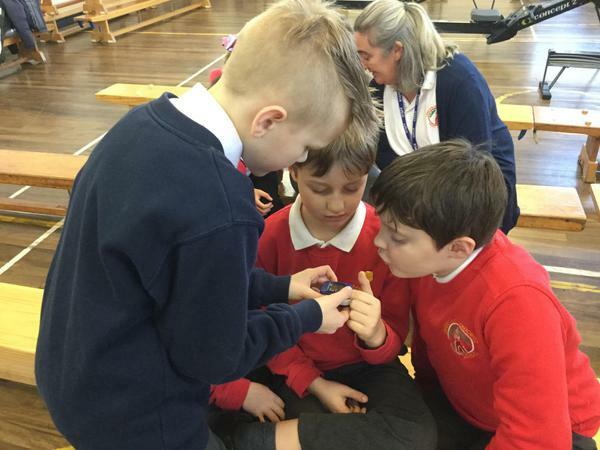 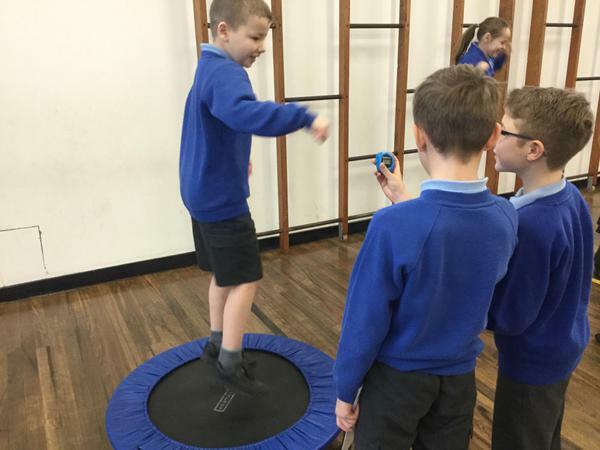 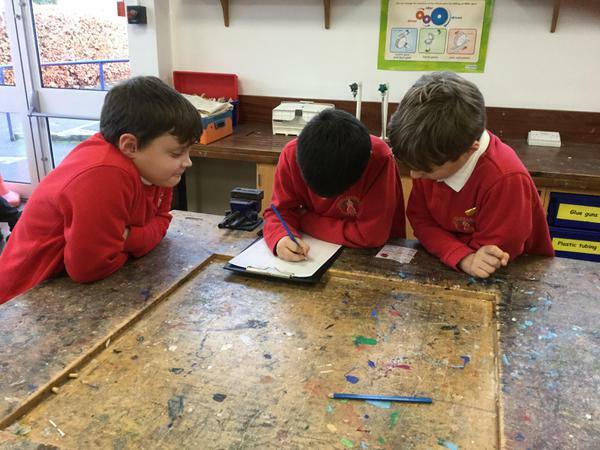 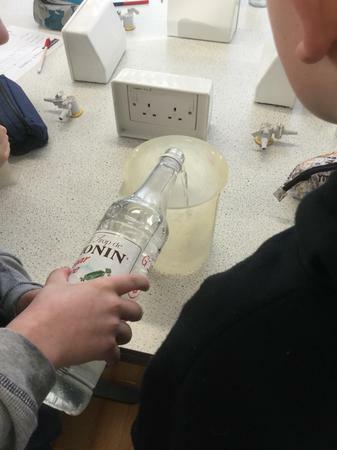 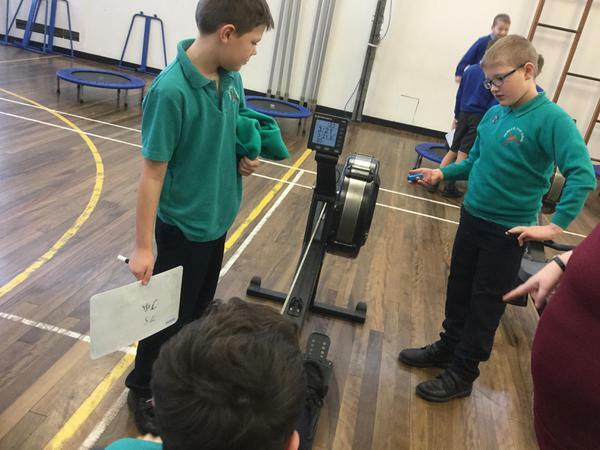 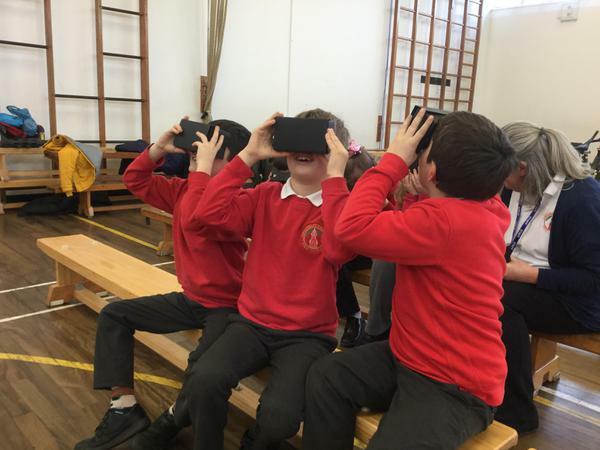 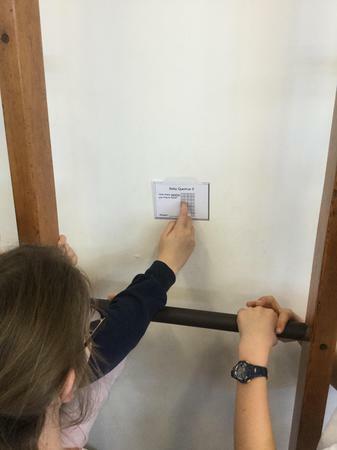 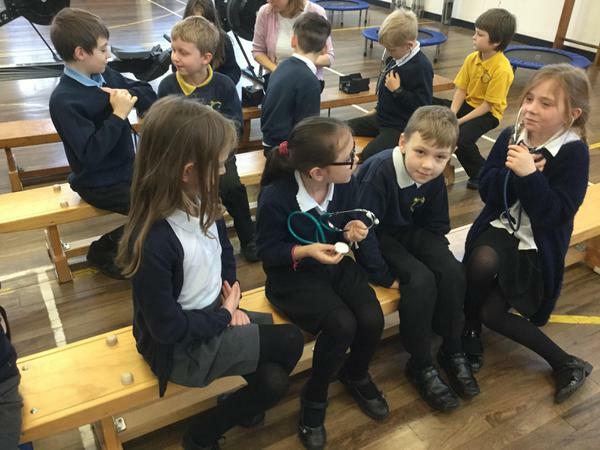 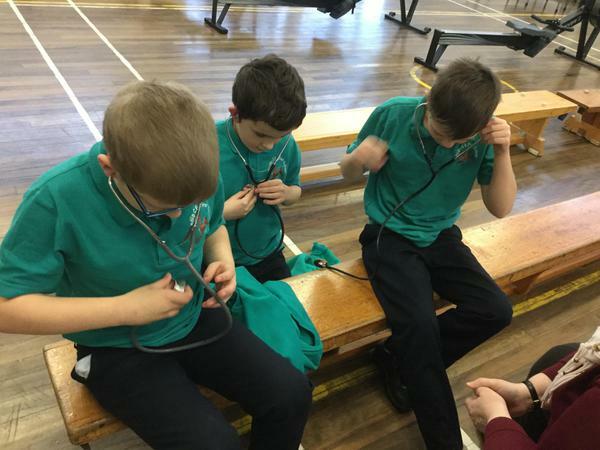 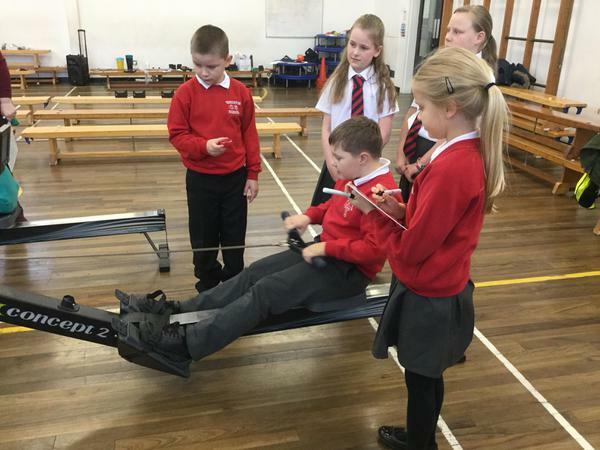 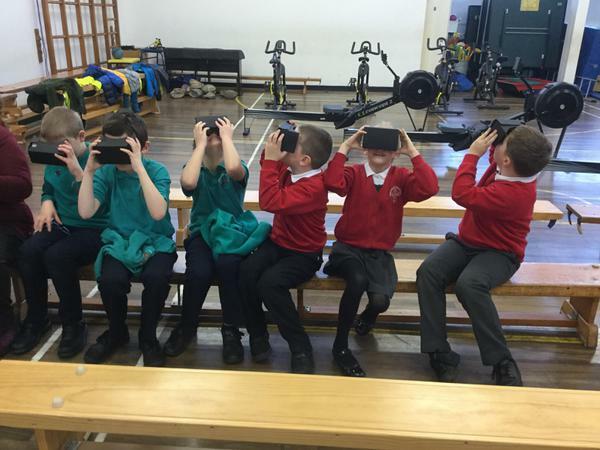 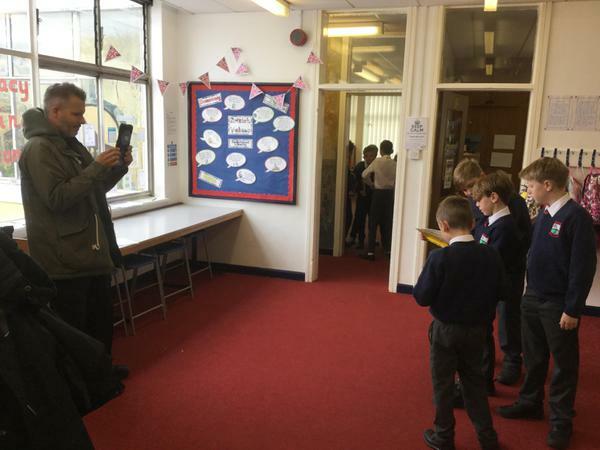 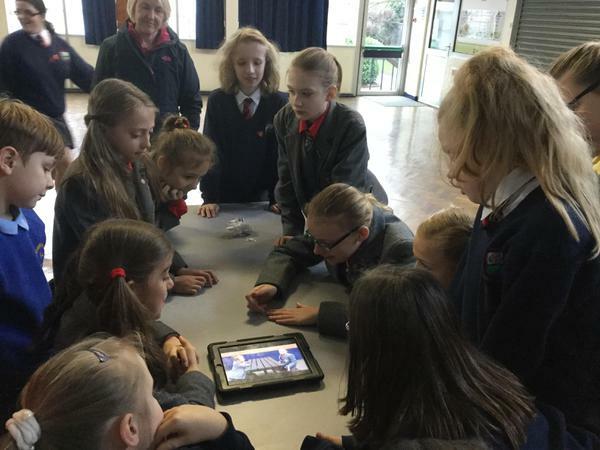 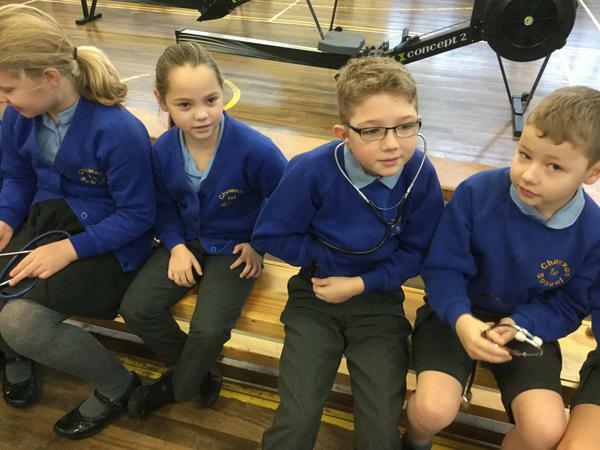 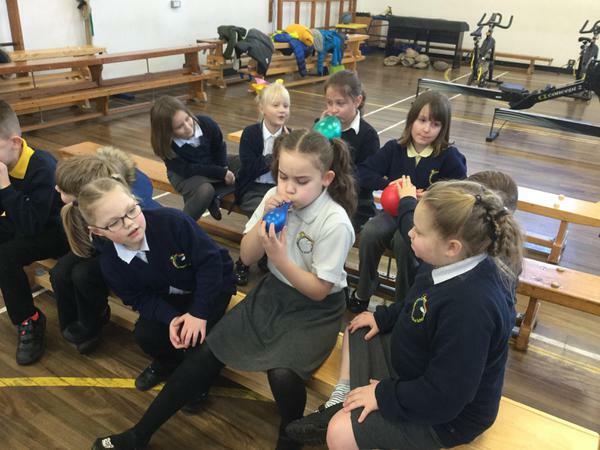 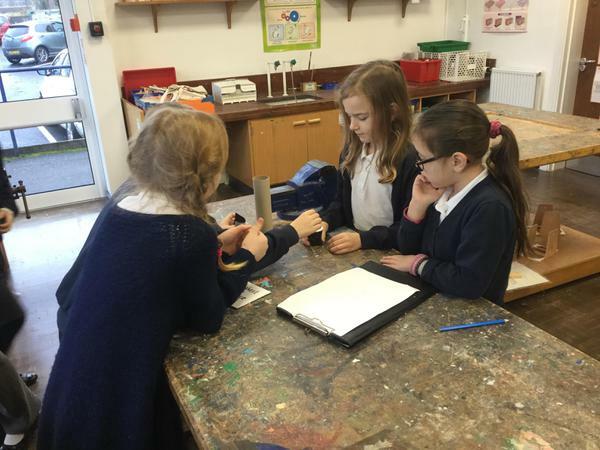 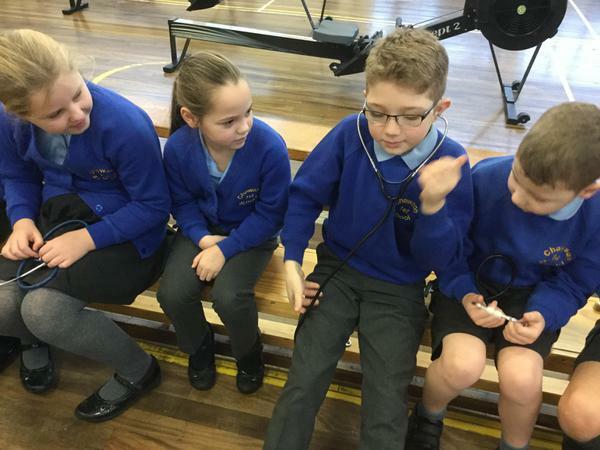 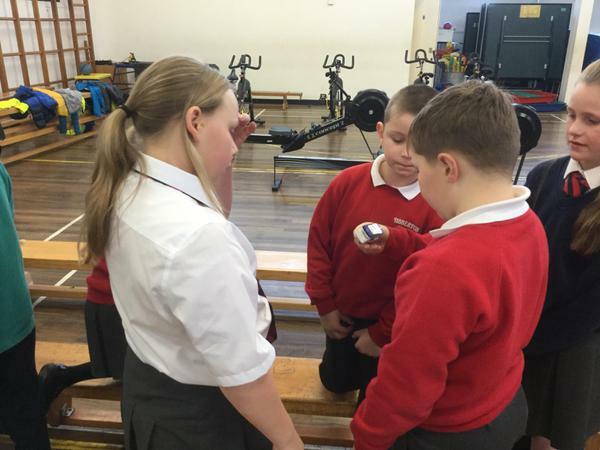 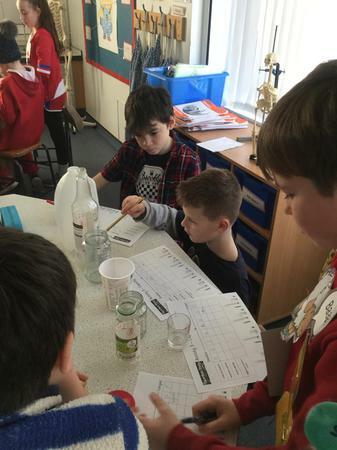 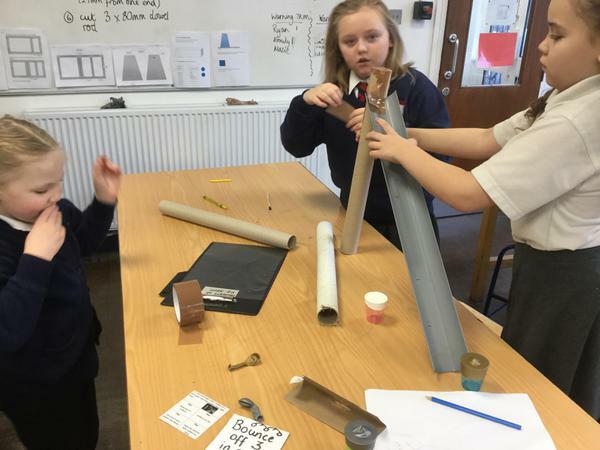 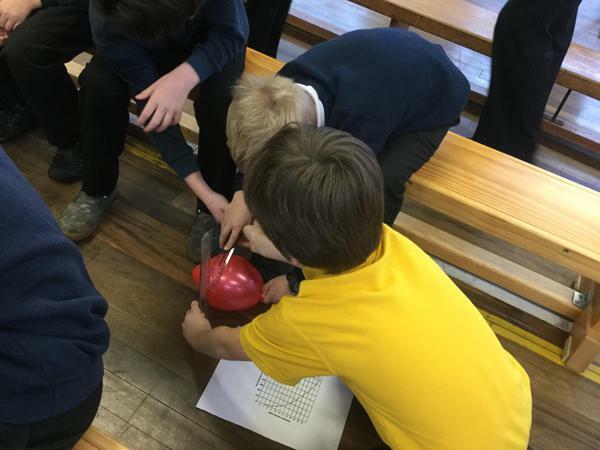 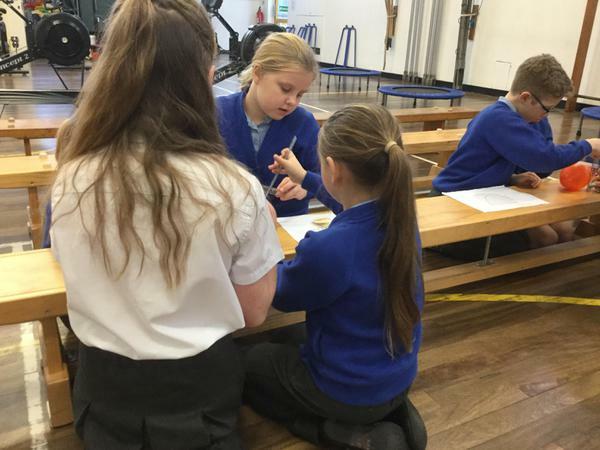 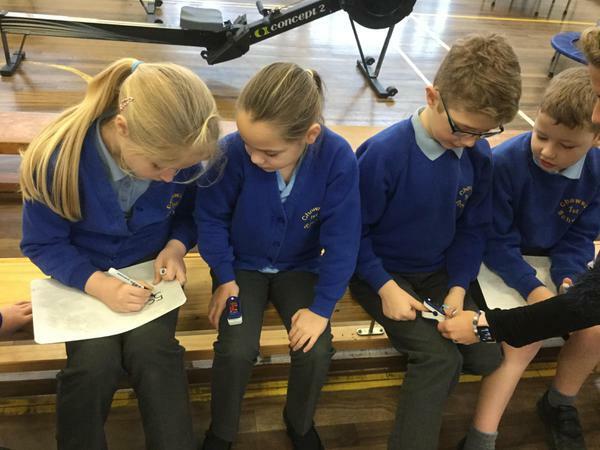 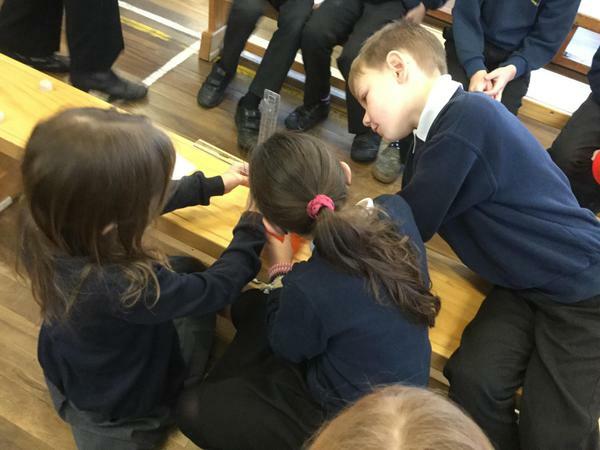 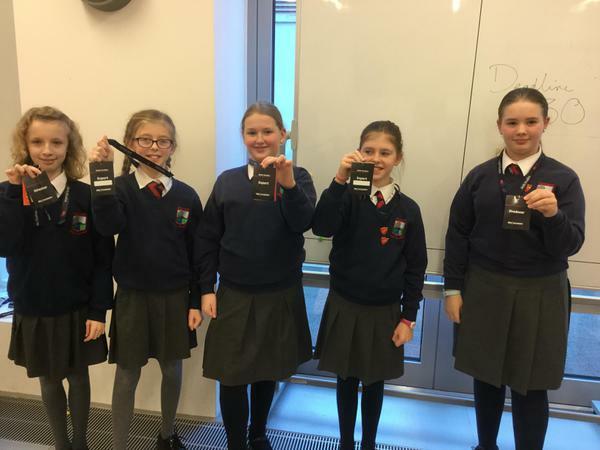 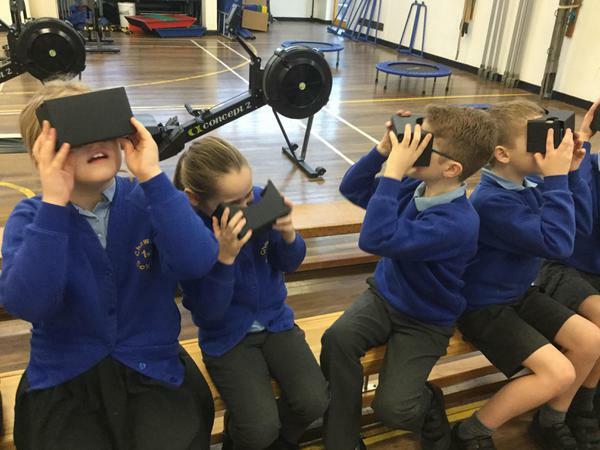 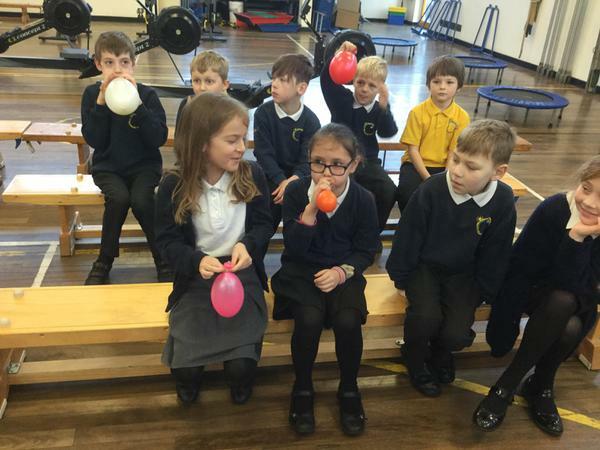 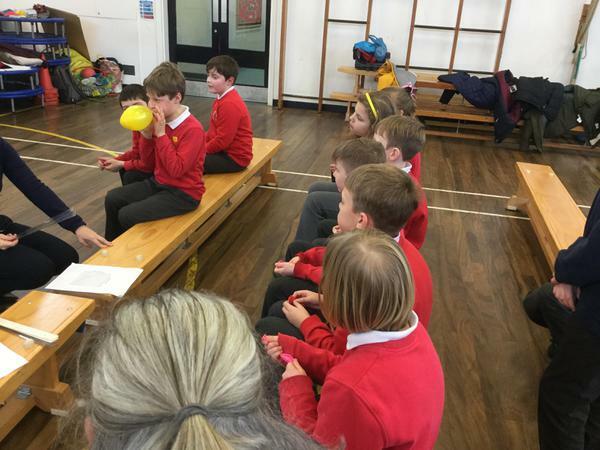 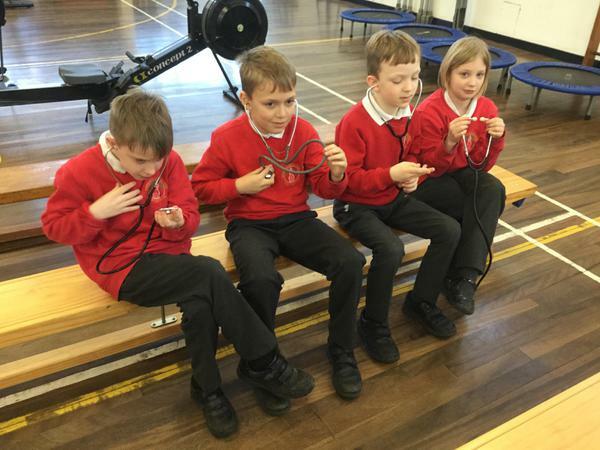 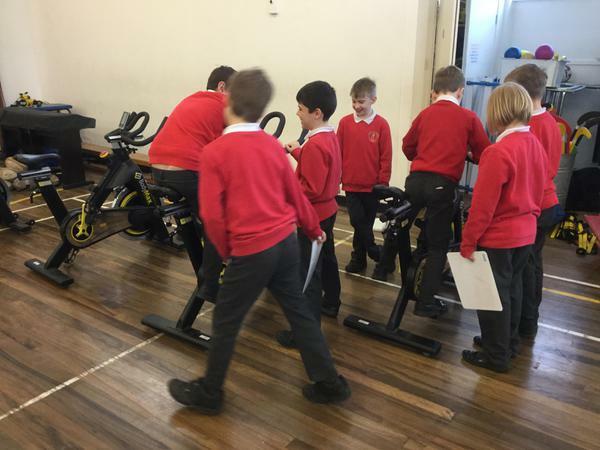 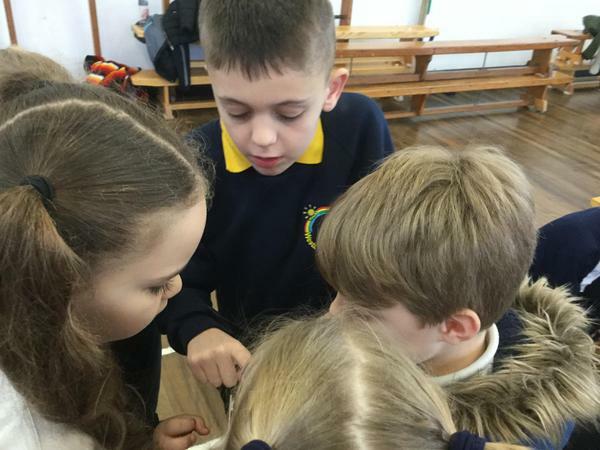 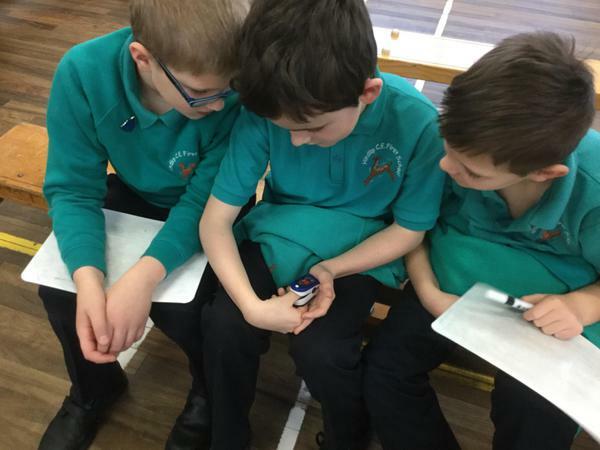 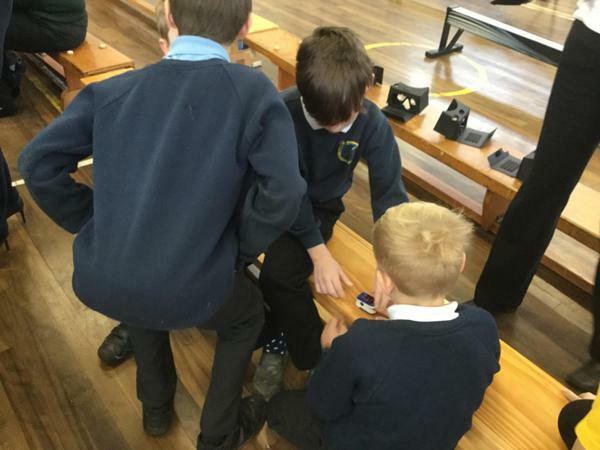 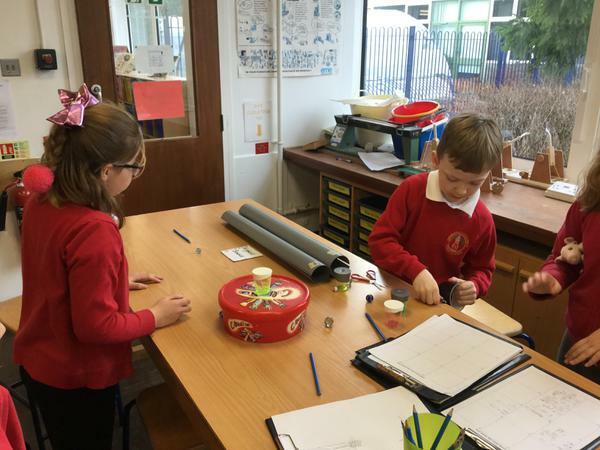 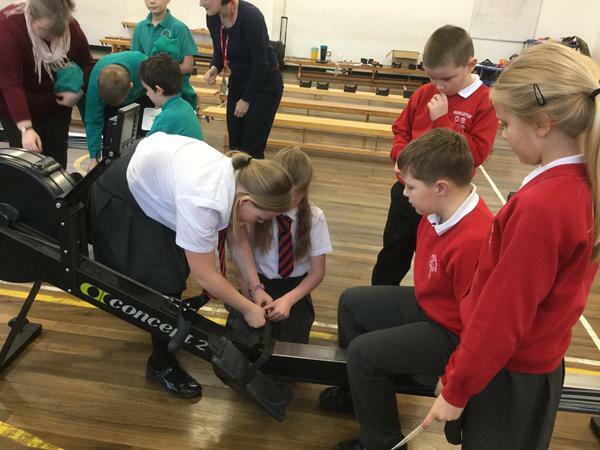 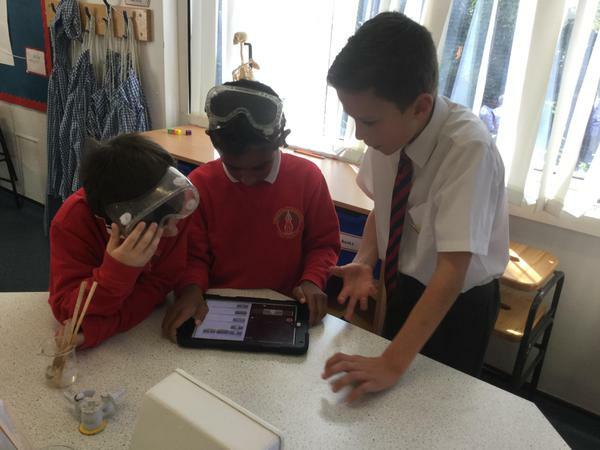 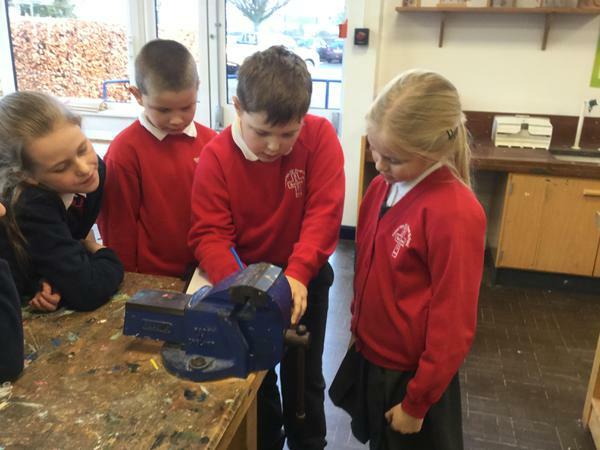 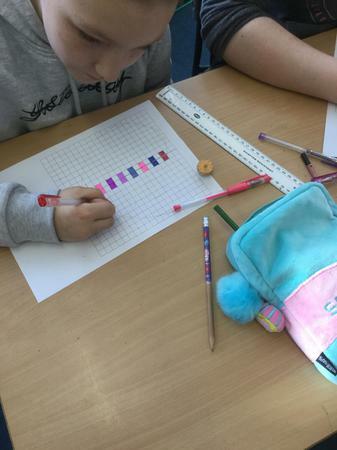 Following the success of previous STEM days over the last fewof years, we organised yet another STEM day at the start of the Spring term for local Year 4 pupils. 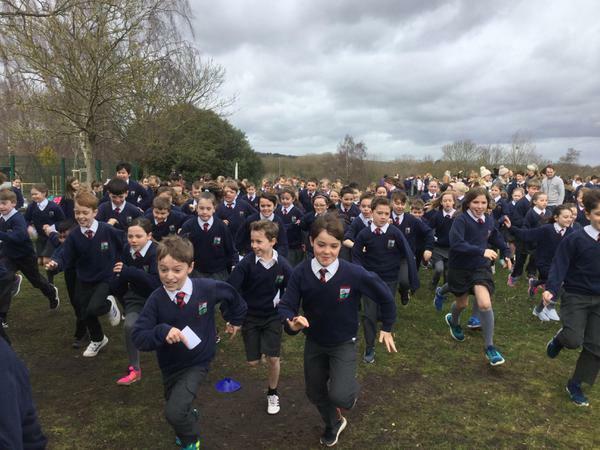 This time the theme was 'Exercise' and we welcomed pupils from Westlands, Chawson, Ombersley, Tibberton, Hindlip and Wychbold. 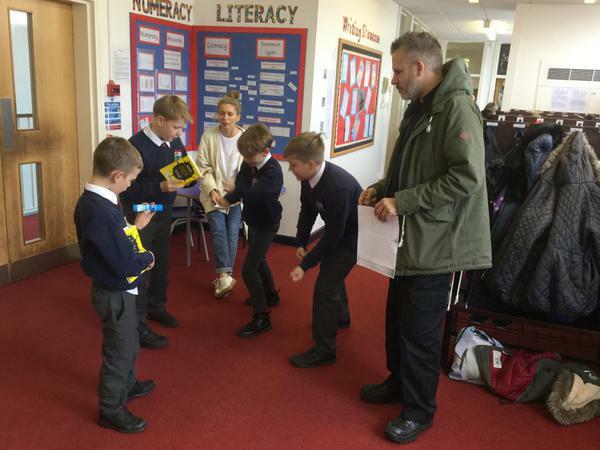 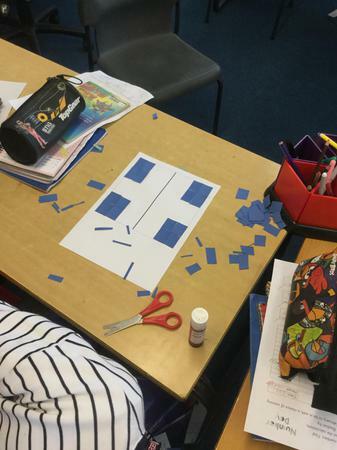 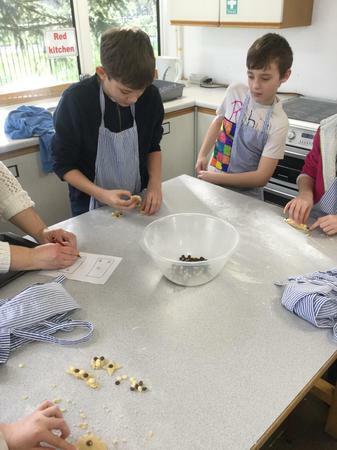 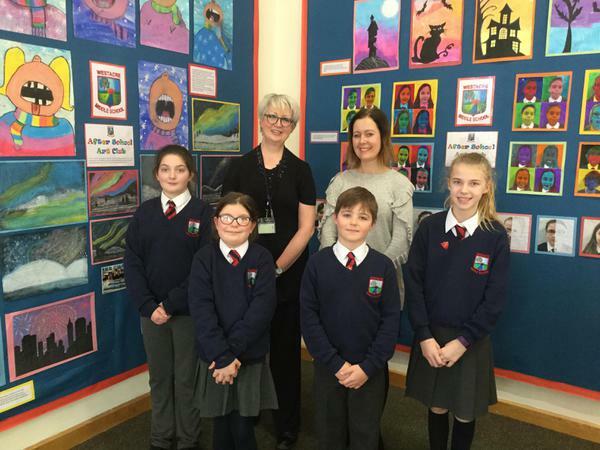 Once more, Westacre teachers Mr Barber and Miss Steenson were joined by Mrs Fisher and Mrs Park from the Prince Henry's High School in Evesham in organising different workshops for the children. 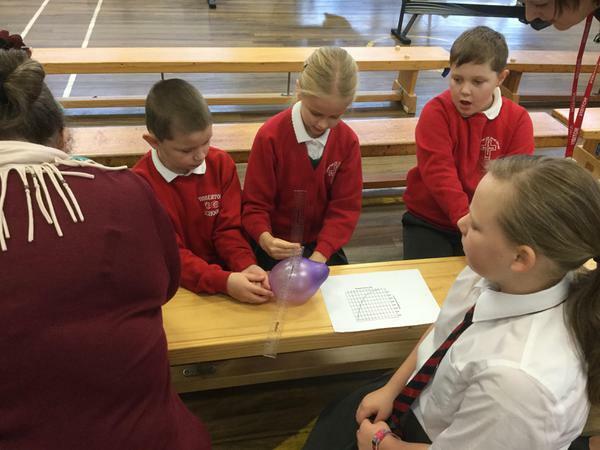 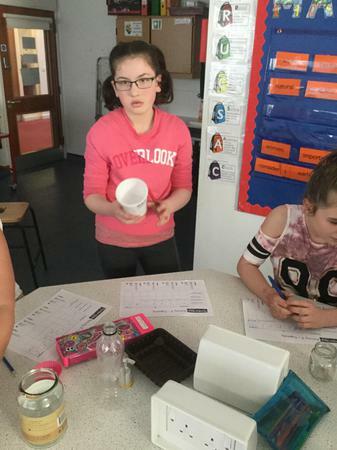 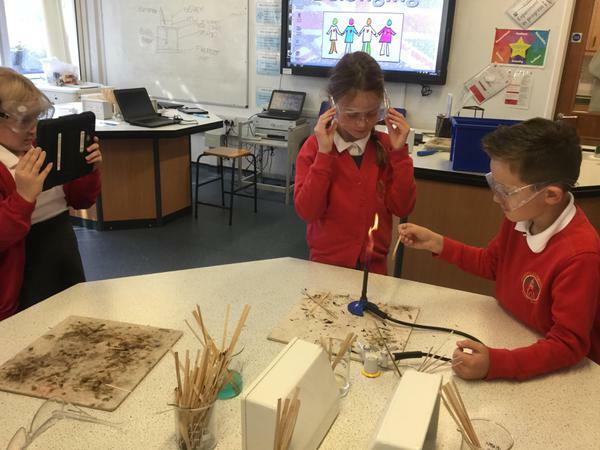 Well done to all of the pupils for their enthusiasm and skill throughout this STEM day! 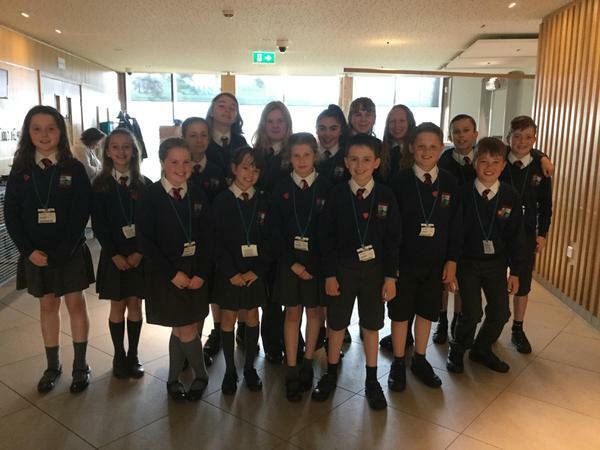 Well done also to the Year 5 pupils who helped with the organisation of the day and supported the children who joined us for the day. 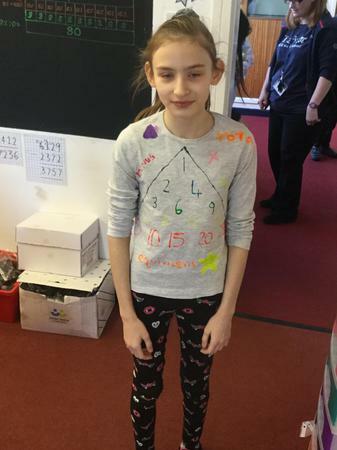 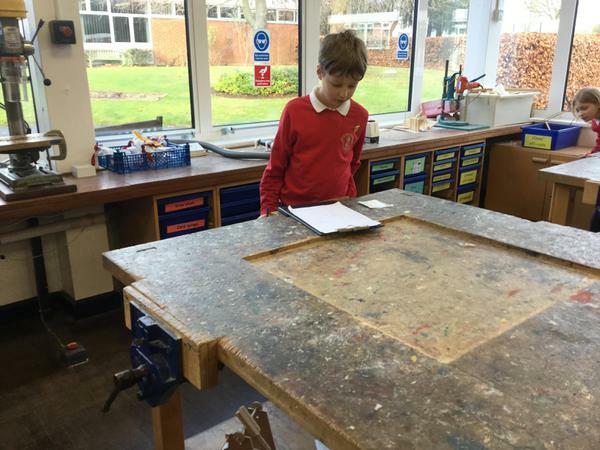 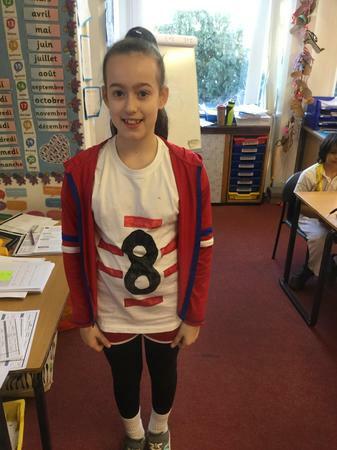 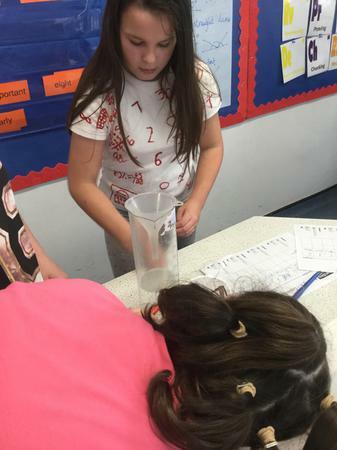 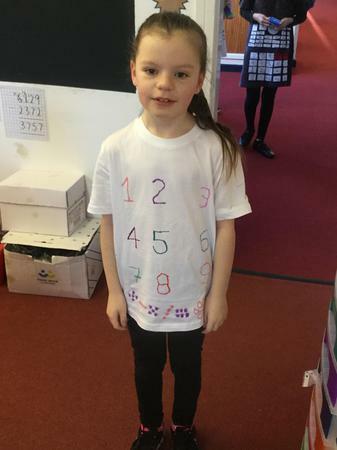 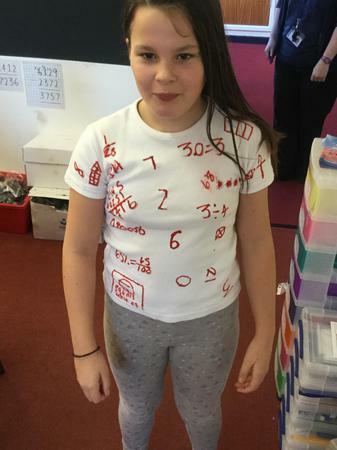 Here is Emmie in Year 6 who has just been announced as winner of the Maths in the World house photography competition with her entry about how she measured and calculated the volume of sand needed for her rabbits. 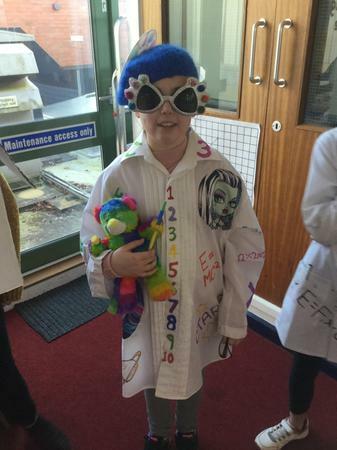 Ten extra house points go to Turing! 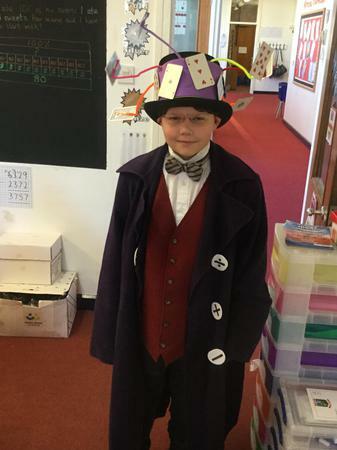 As we approach the end of Autumn term, it is time for the special reward to all of the children in the house that earned the most house points. 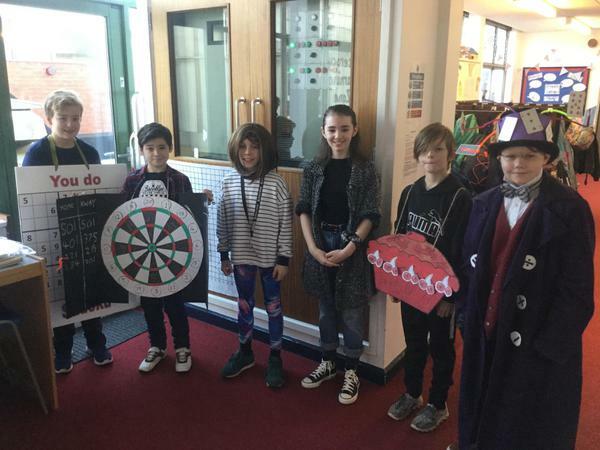 All pupils can earn house points for their particular house by earning bronze, silver and gold certificates linked to our 6Rs Learning Behaviours, as well as through participation in our various house competitions. 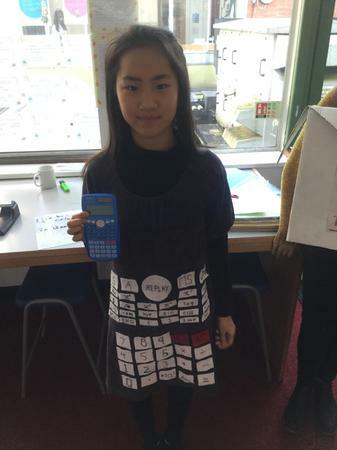 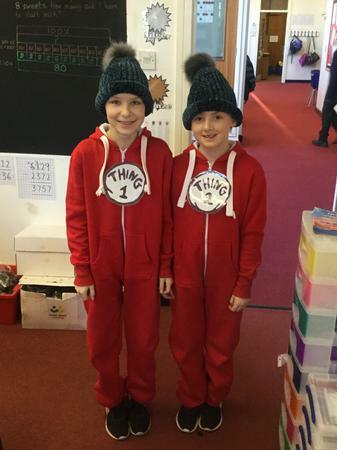 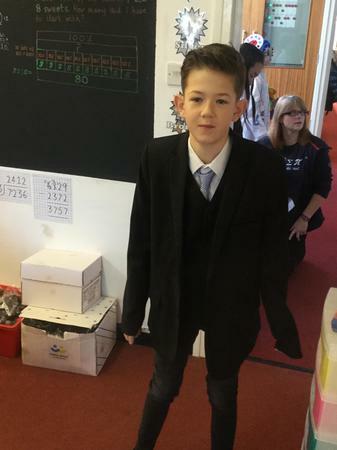 This term’s winning house is Turing. 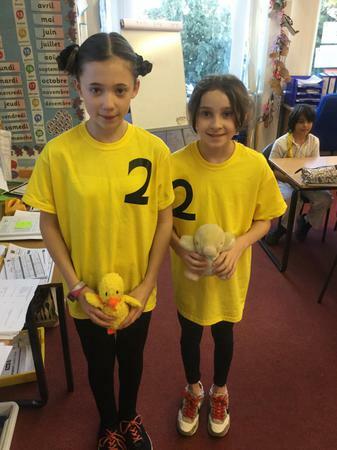 The children and staff in this house showed much effort in incorporating much yellow into their clothes as part of a special non-uniform day! 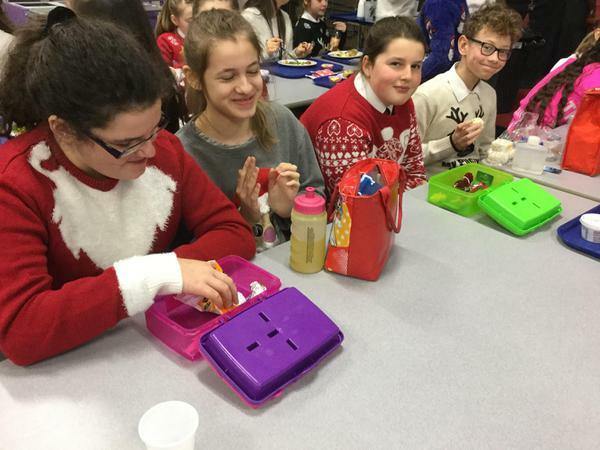 Well done to all of Turing house for the achievement this term, as well as all of the pupils in the other houses who offered their congratulations on this day of celebration! 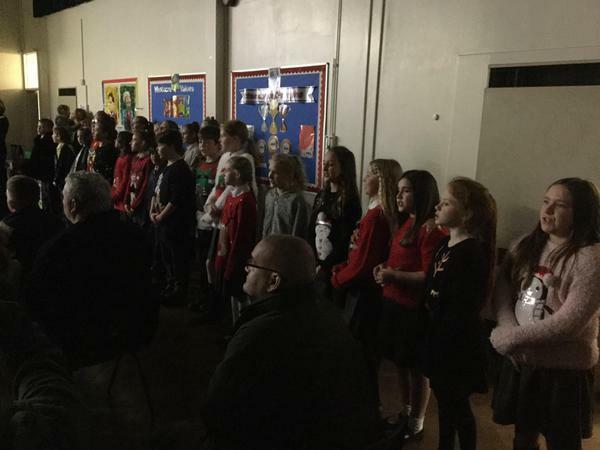 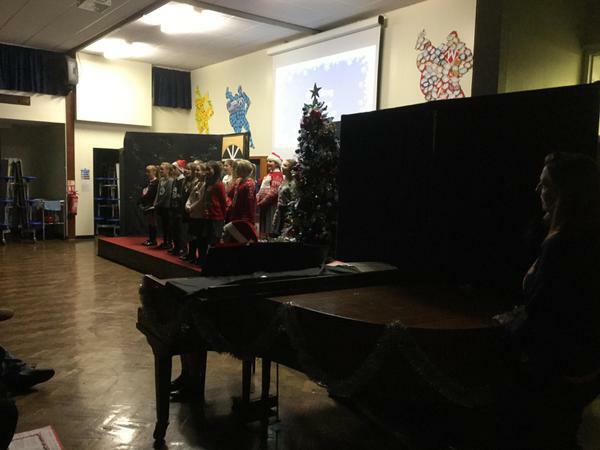 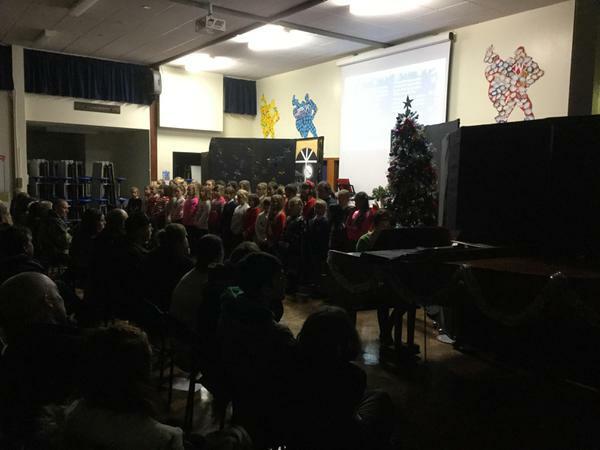 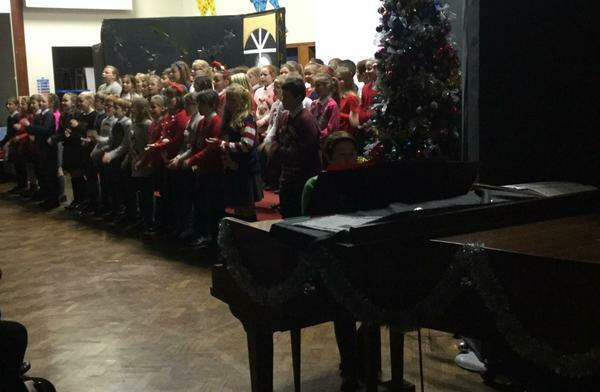 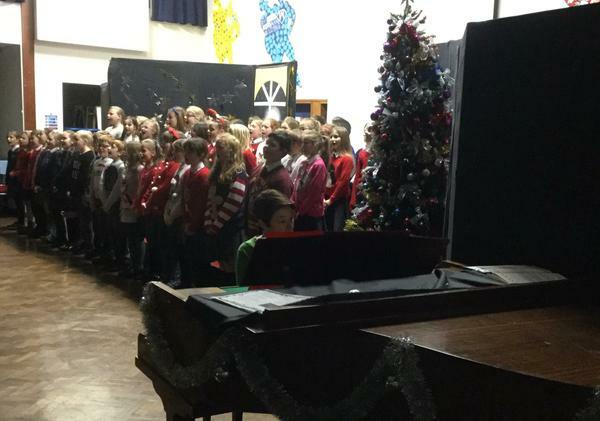 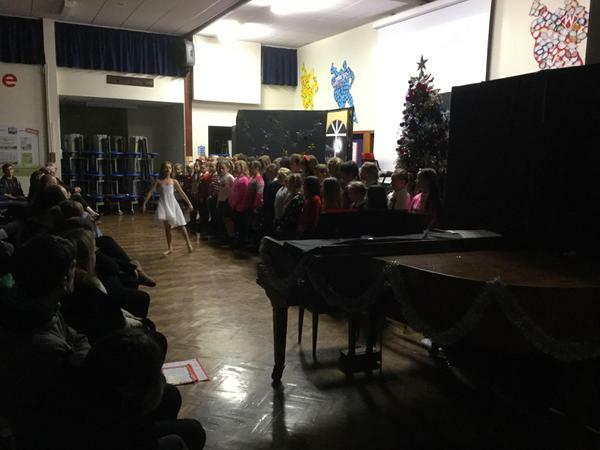 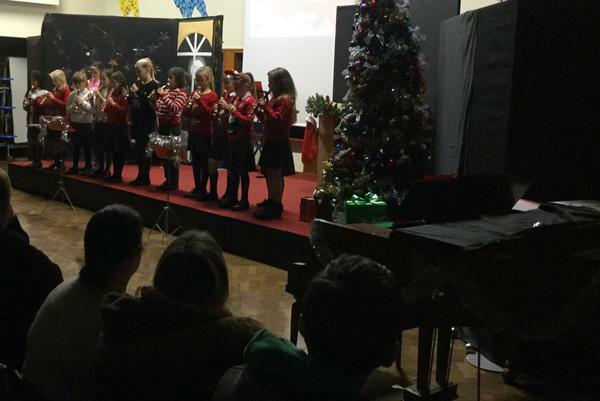 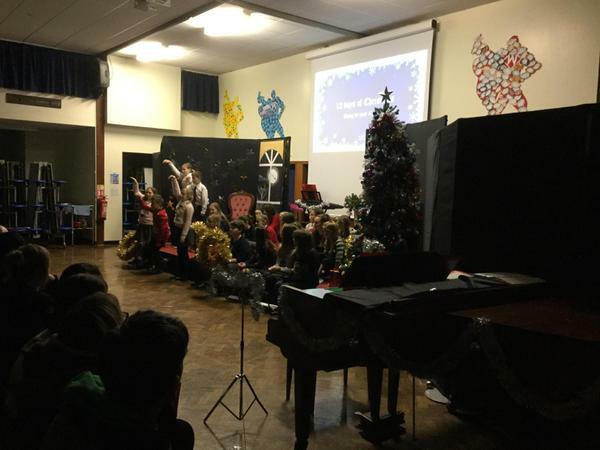 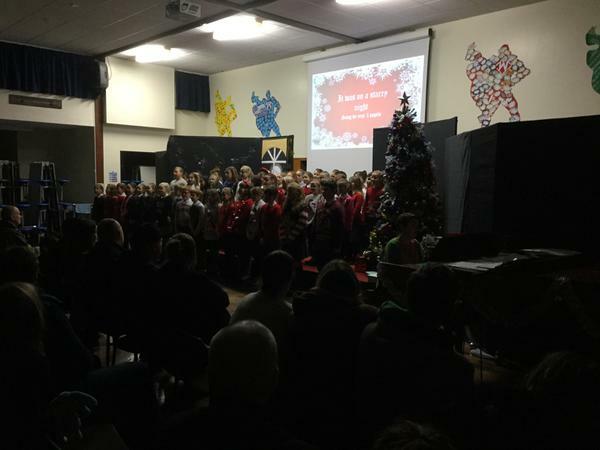 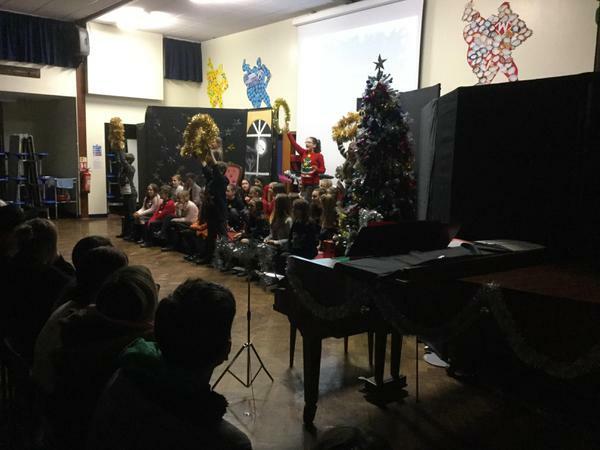 For this year's Christmas Production, all year groups worked together to entertain the audience with a medley of traditional and more modern Christmas songs. 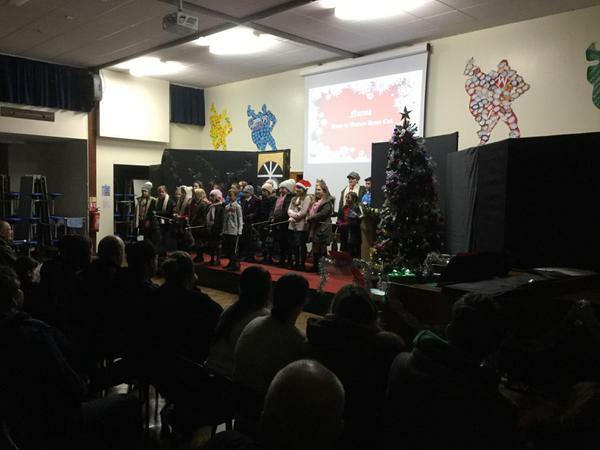 Children also performed scenes from 'Twas the Night Before Christmas' while Drama Club acted out their version of Narnia. 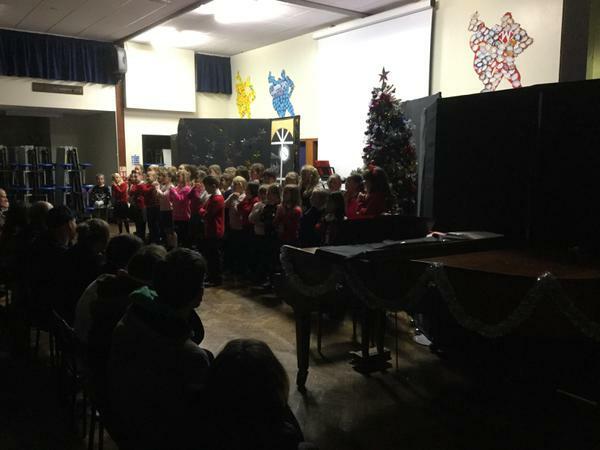 Our school choir sang beautifully as always and a number of children showed off their musical skills playing different instruments. 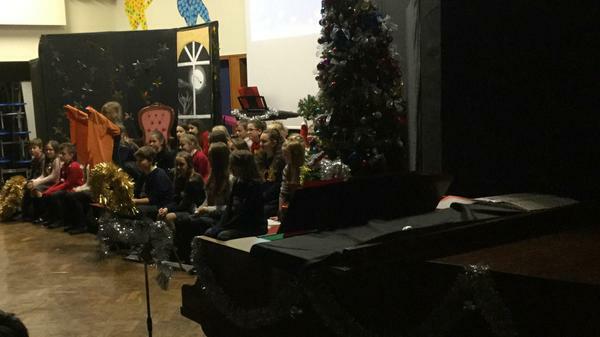 Well done all for an amazing show! 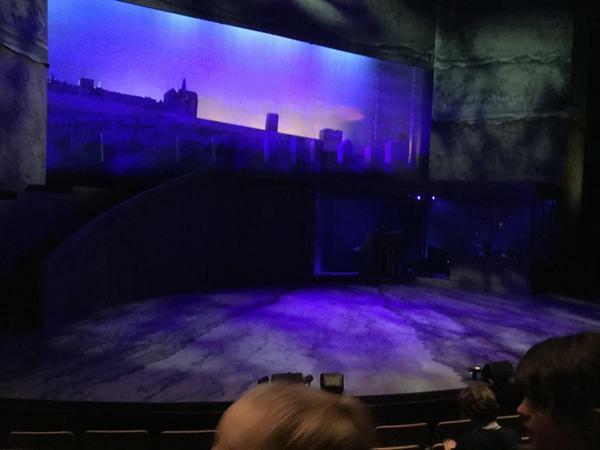 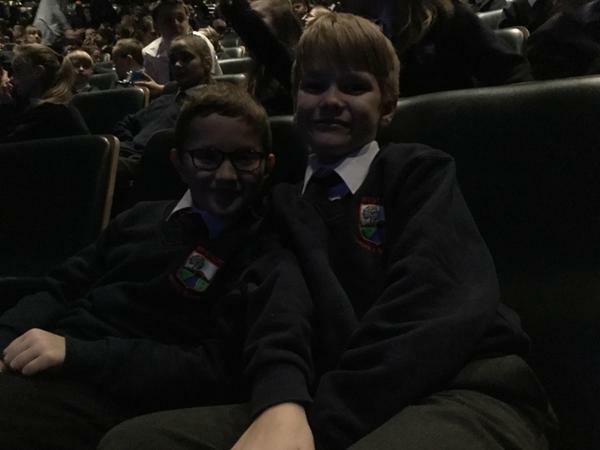 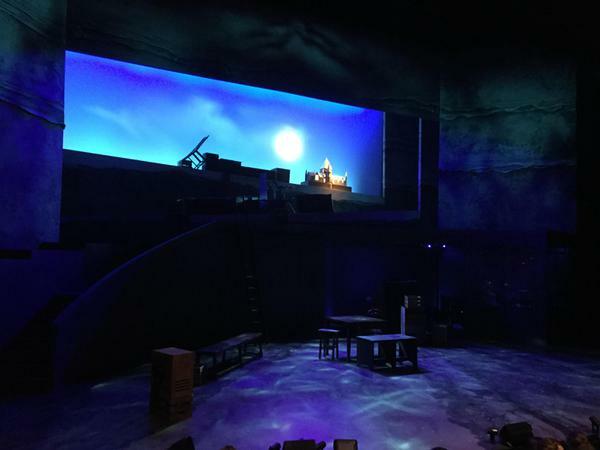 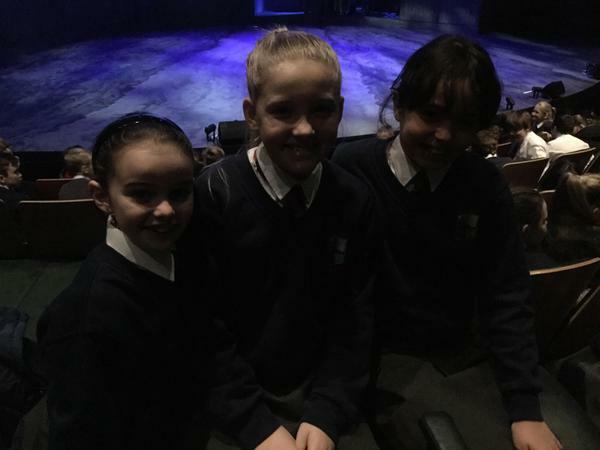 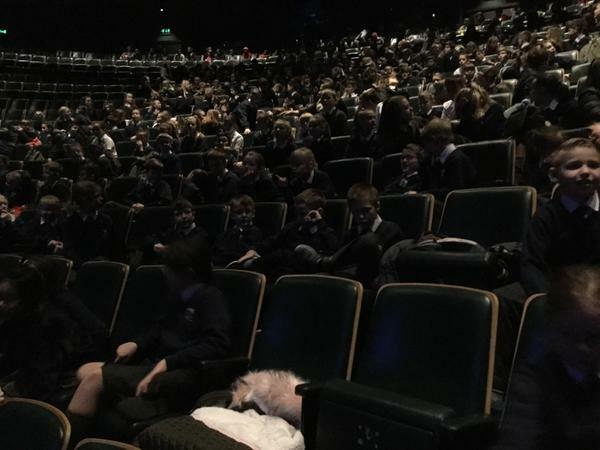 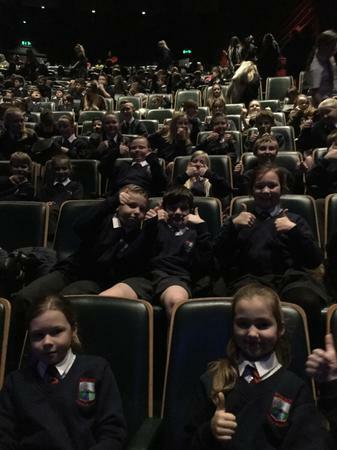 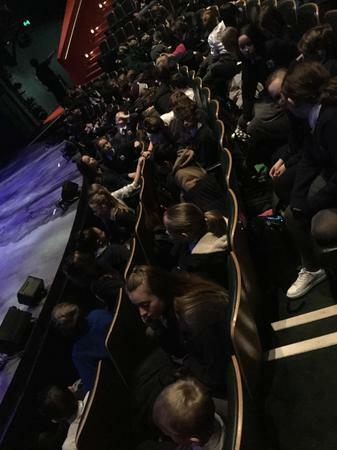 For this year's annual whole school theatre trip, staff and pupils from all year groups made the journey to The Birmingham Repertory Theatre to watch a production of 101 Dalmations. 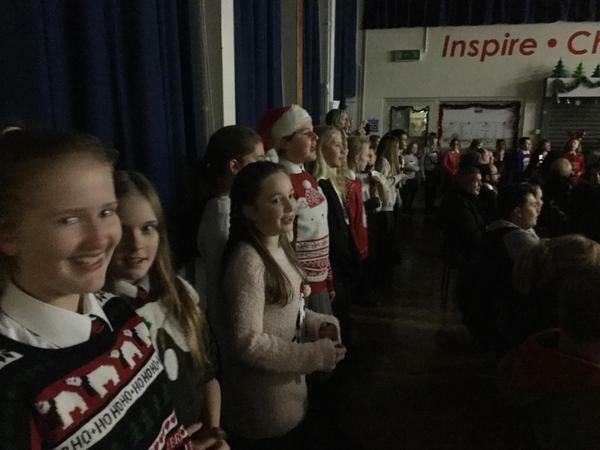 Everyone had a wonderful time and we now look forward to next year's visit! 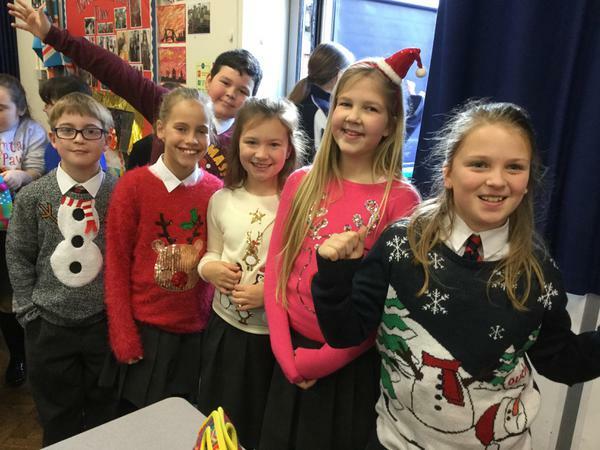 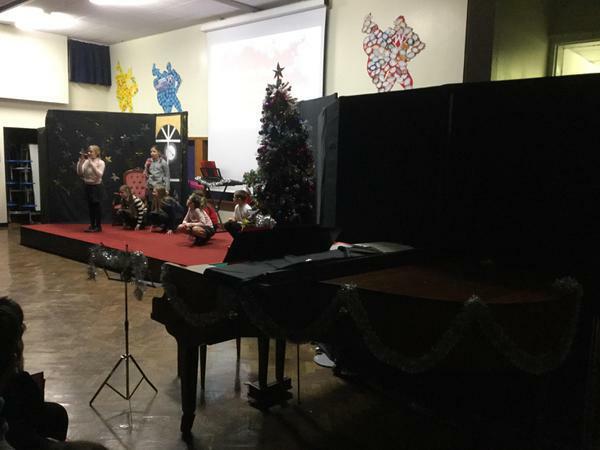 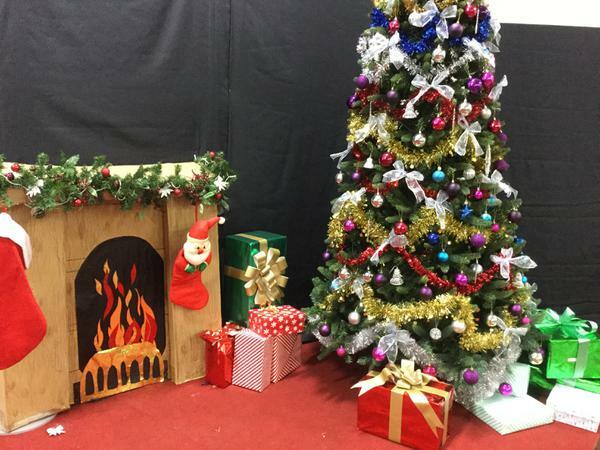 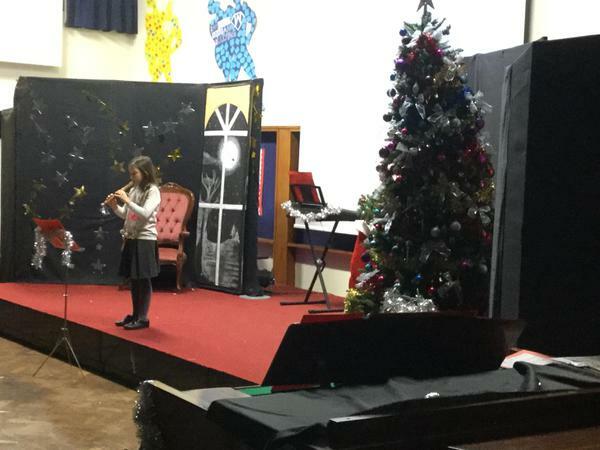 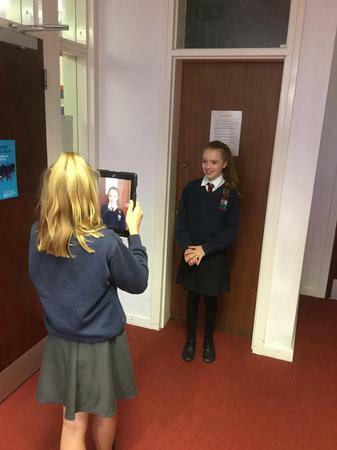 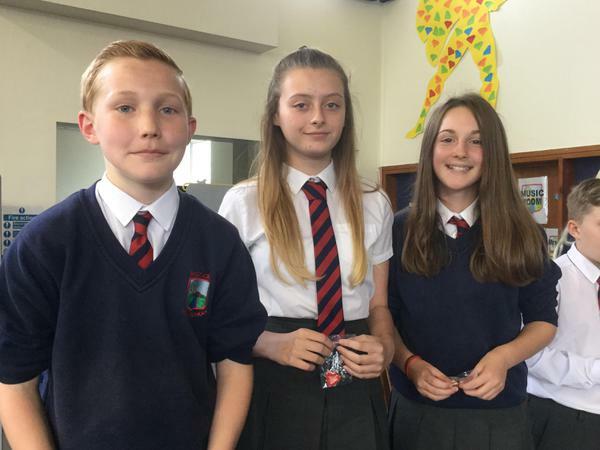 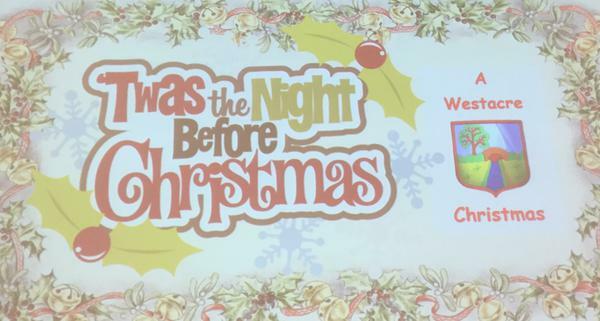 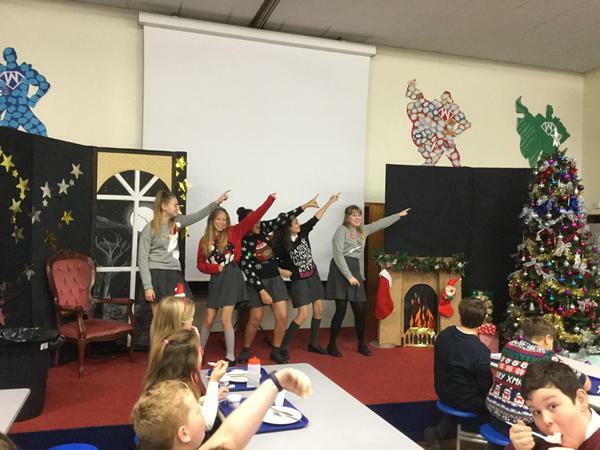 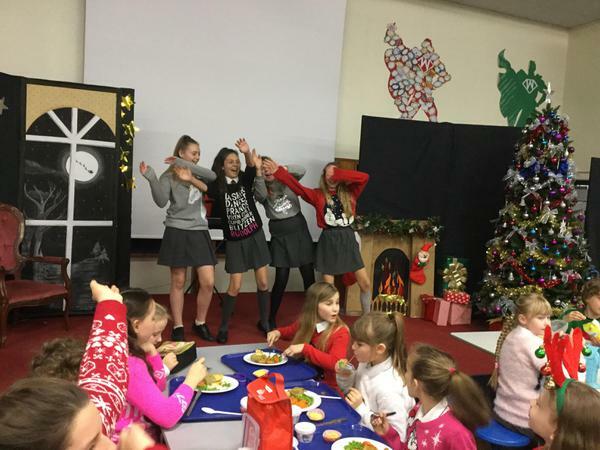 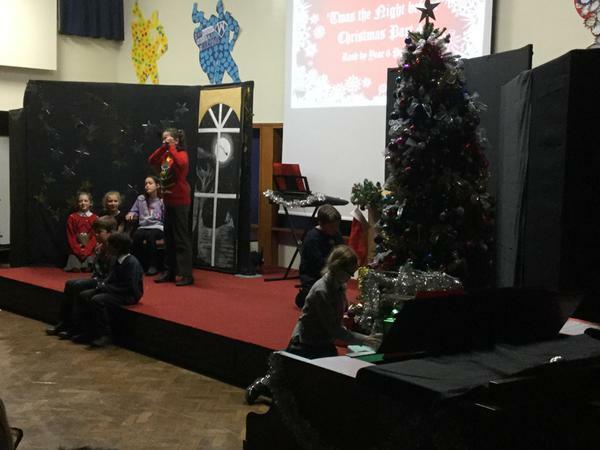 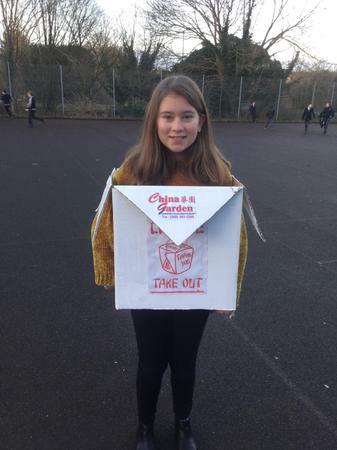 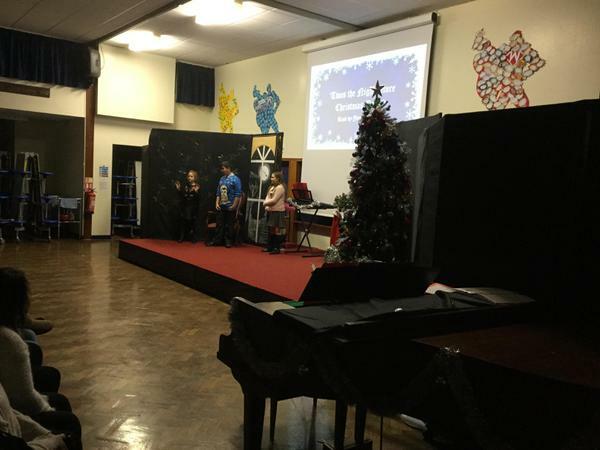 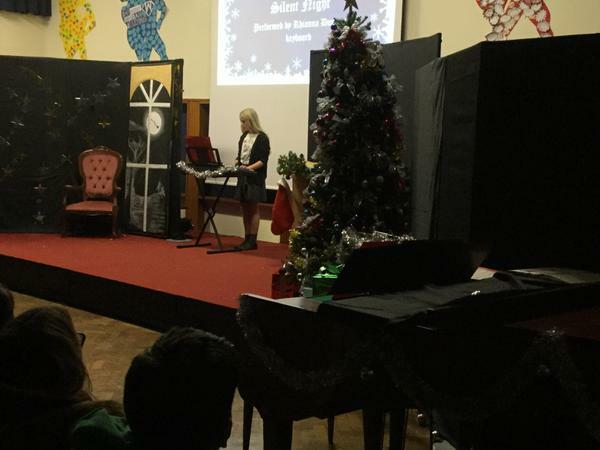 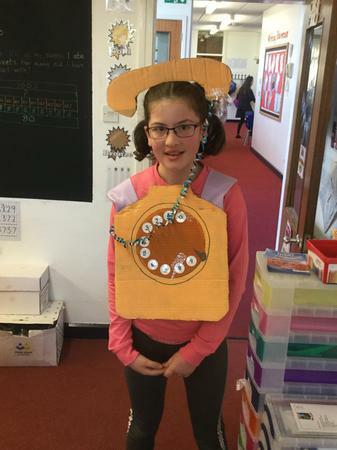 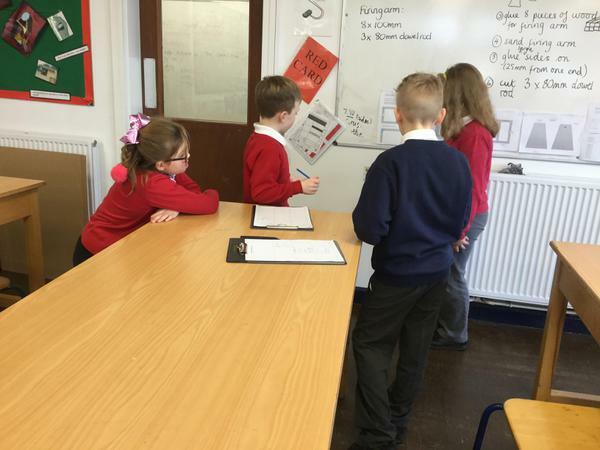 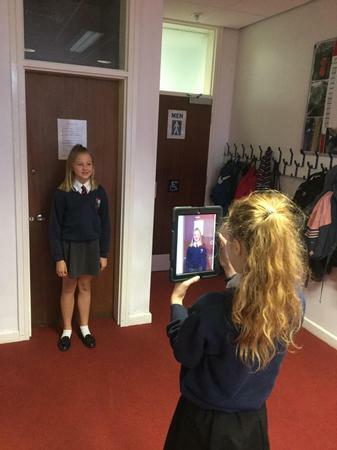 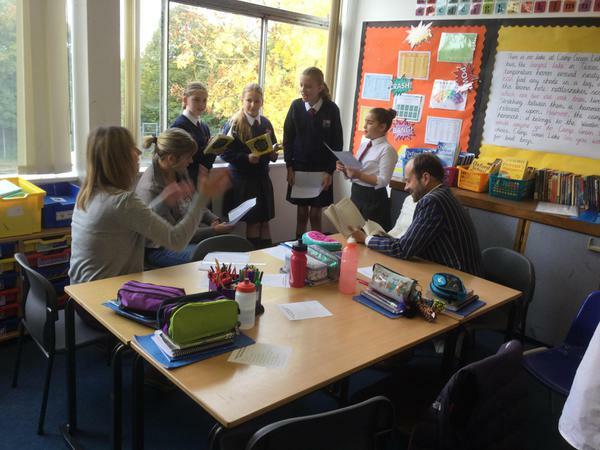 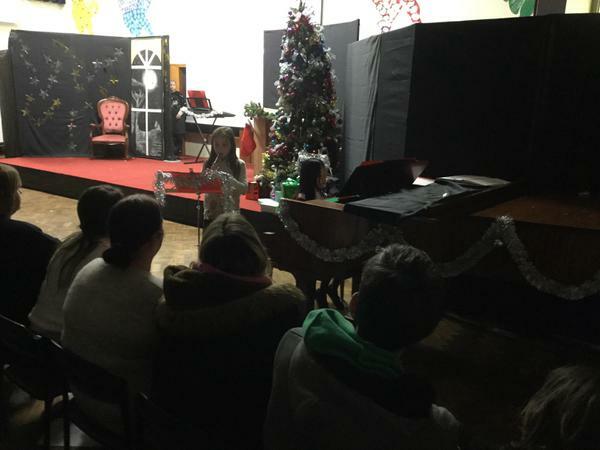 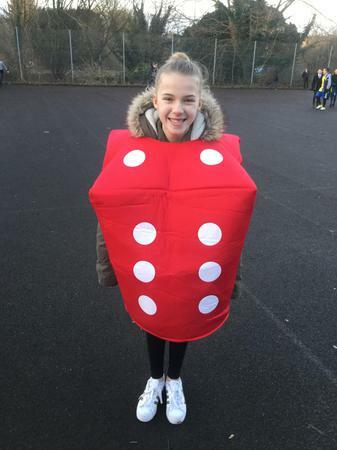 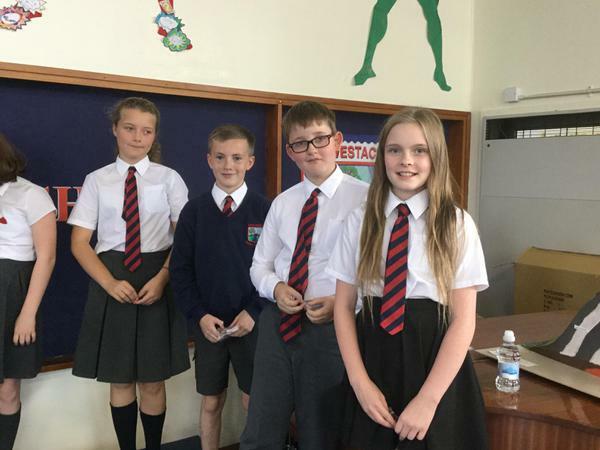 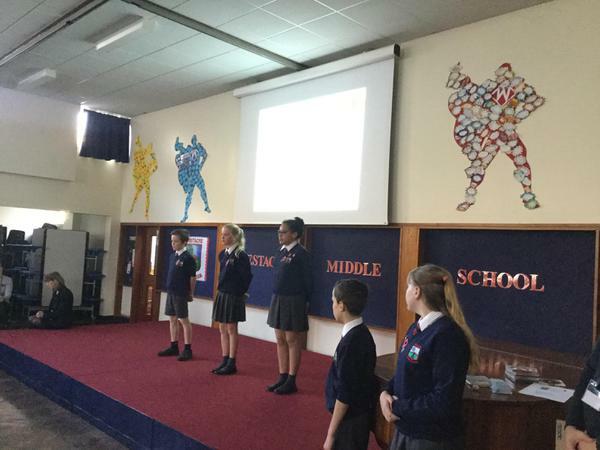 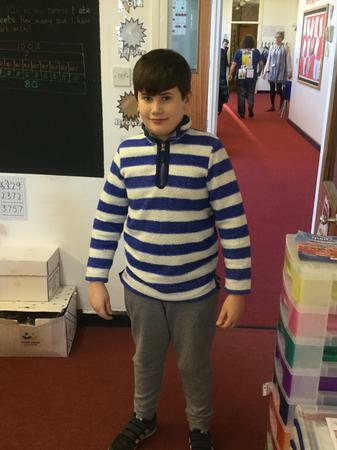 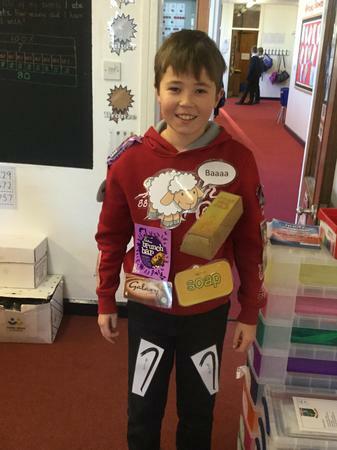 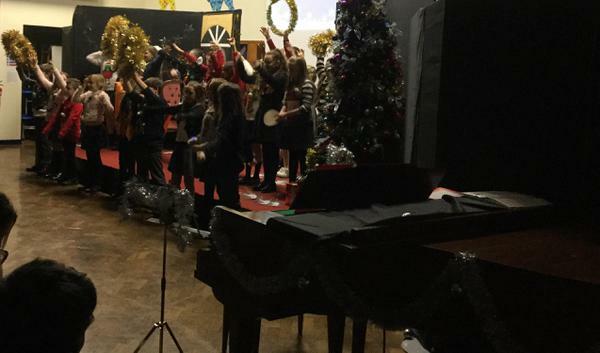 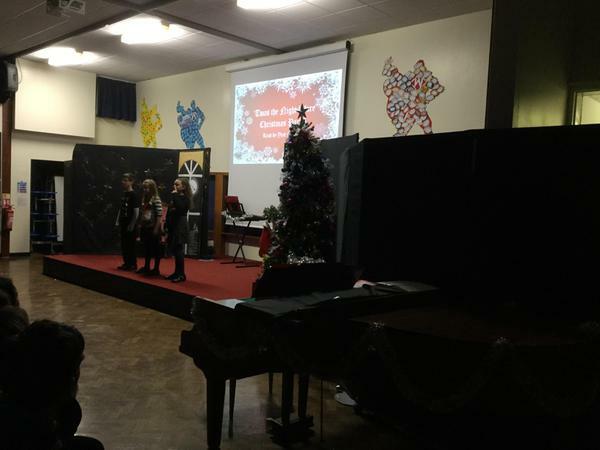 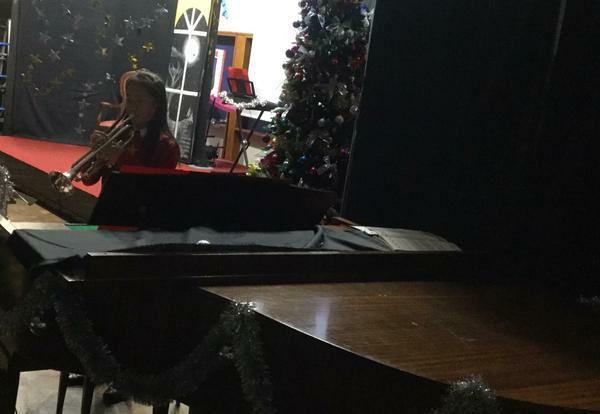 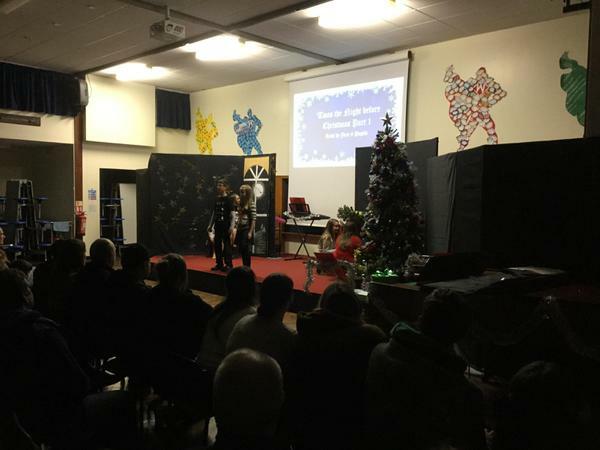 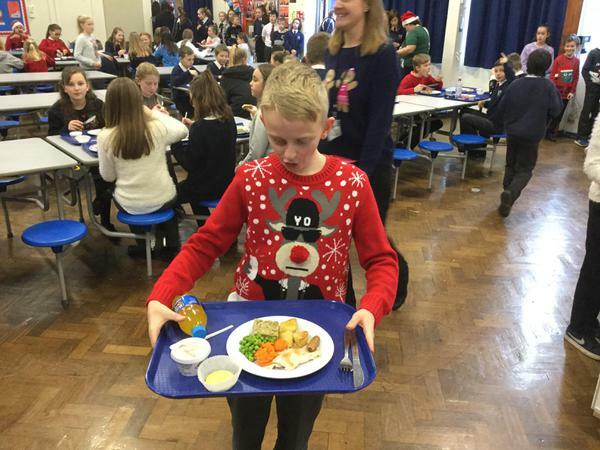 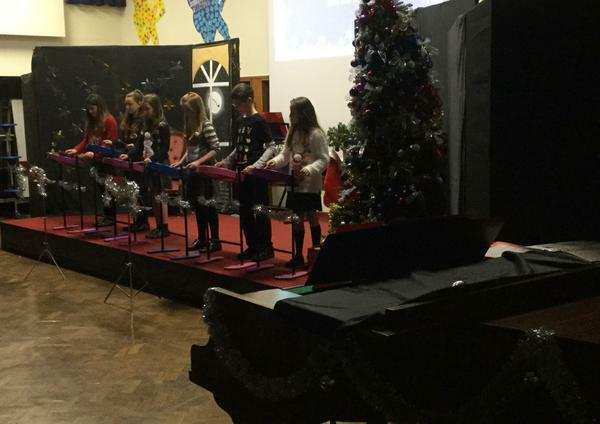 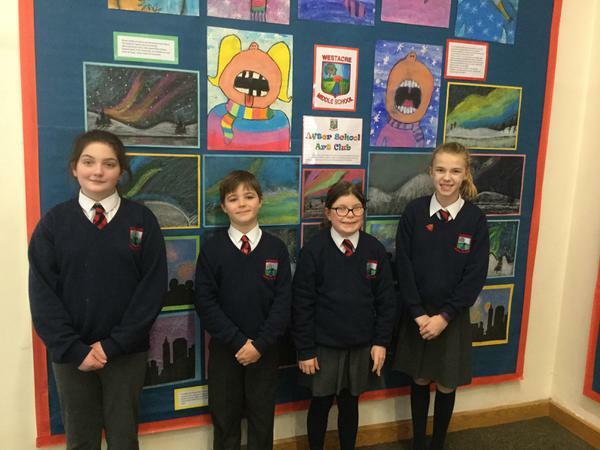 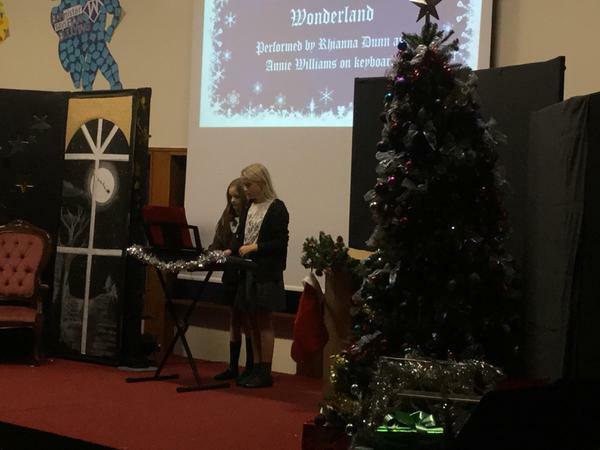 During whole school writing week, Year 7 pupils wrote and performed their own Christmas TV adverts. 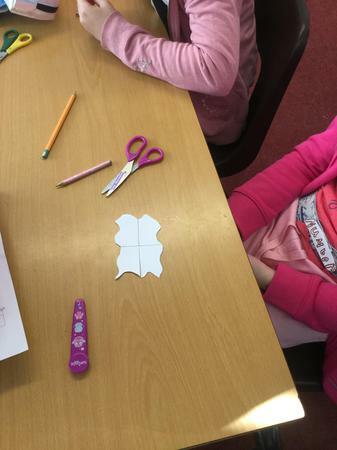 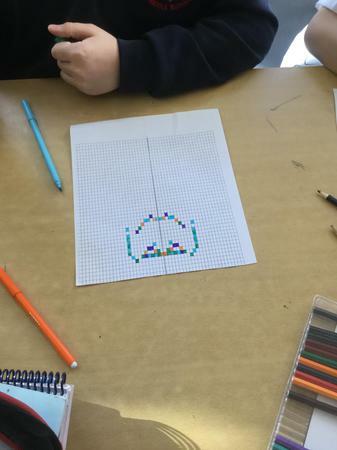 Thoughtfully, many children came up with the idea of using these to highlight the issue of loneliness amongst elderly people. 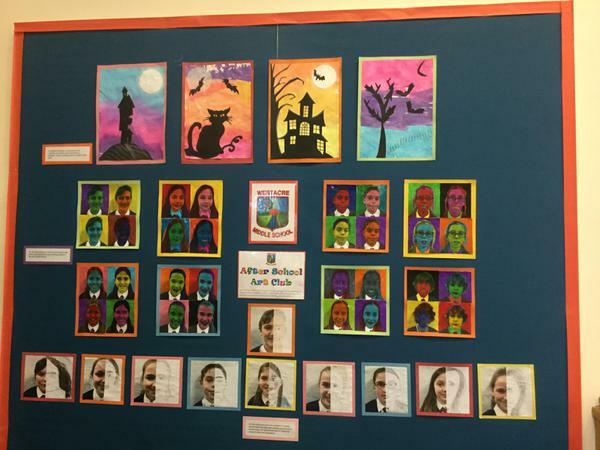 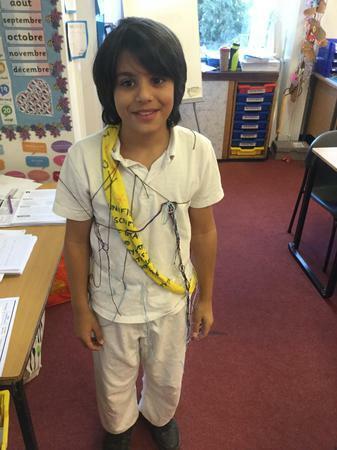 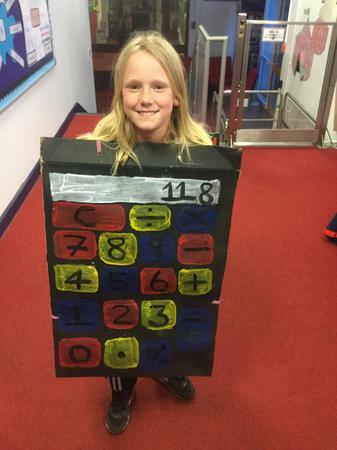 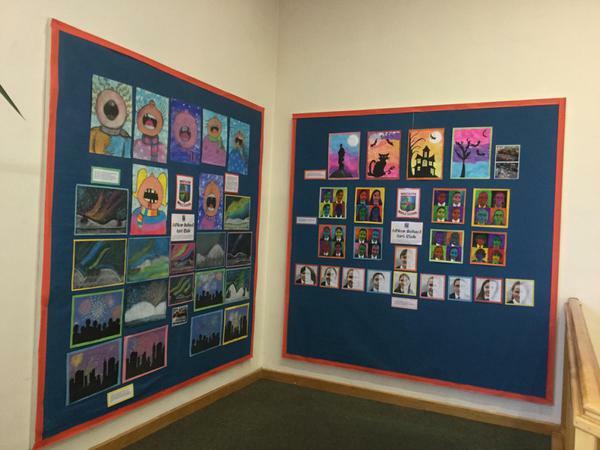 Have a look at the impressive video below for one example of what the children created. 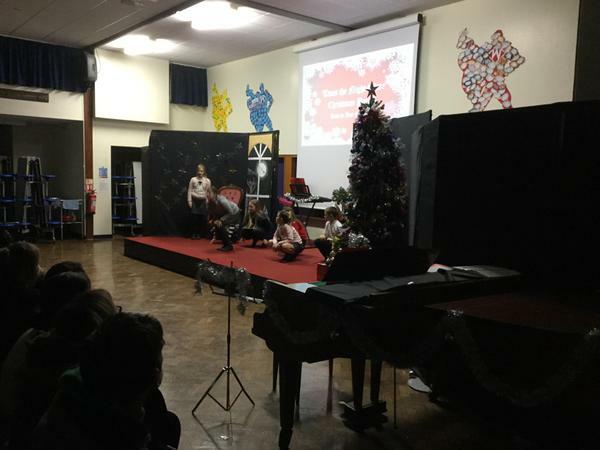 Any donations collected during our upcoming Christmas Production performances will go to the Age UK charity. 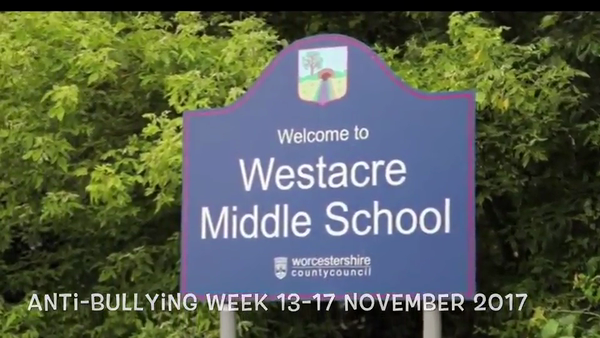 The week beginning 13th November was National Anti-Bullying week. 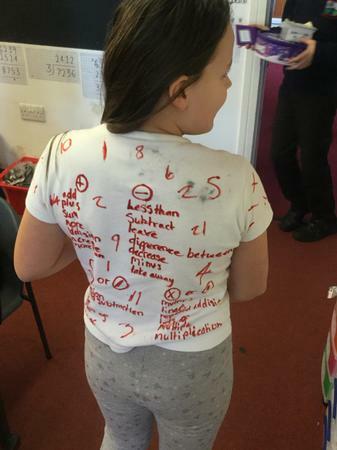 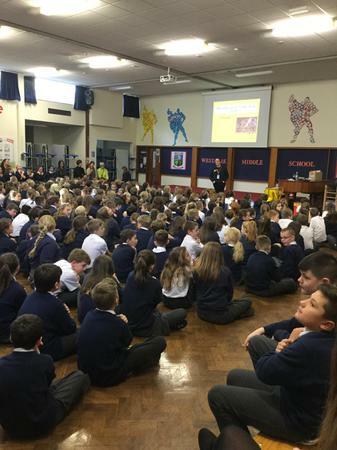 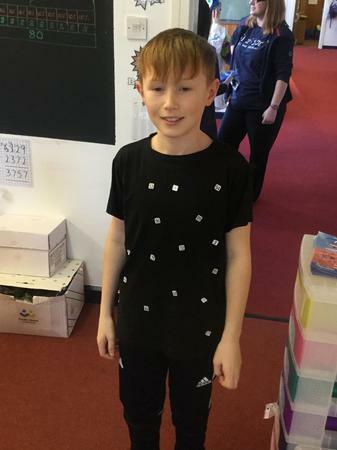 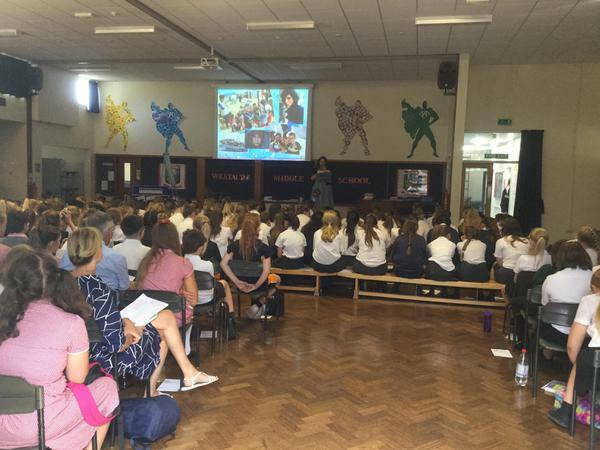 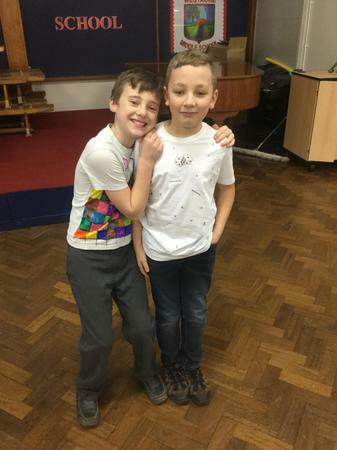 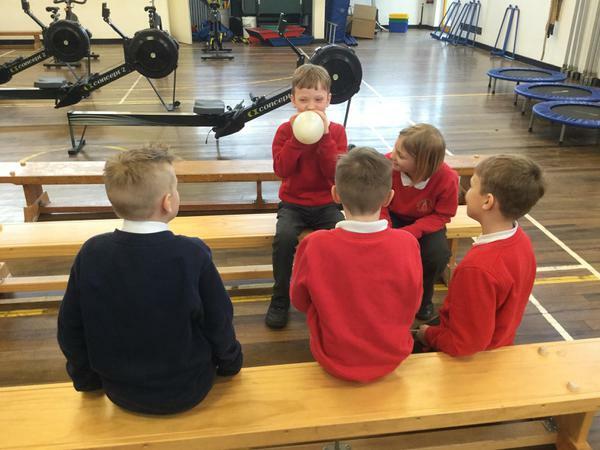 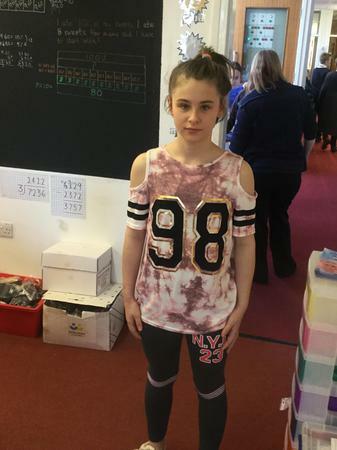 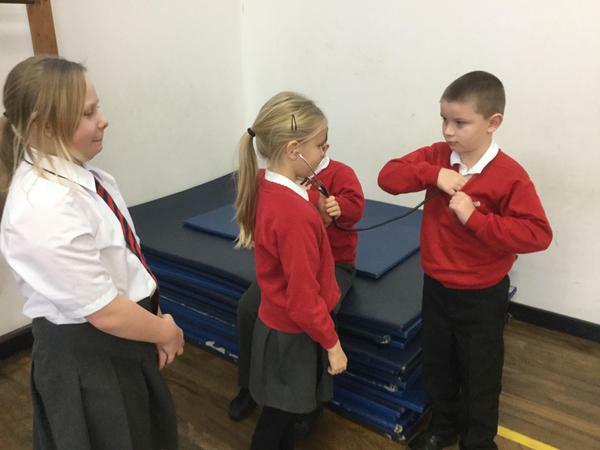 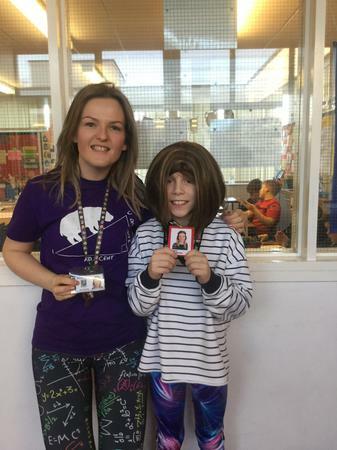 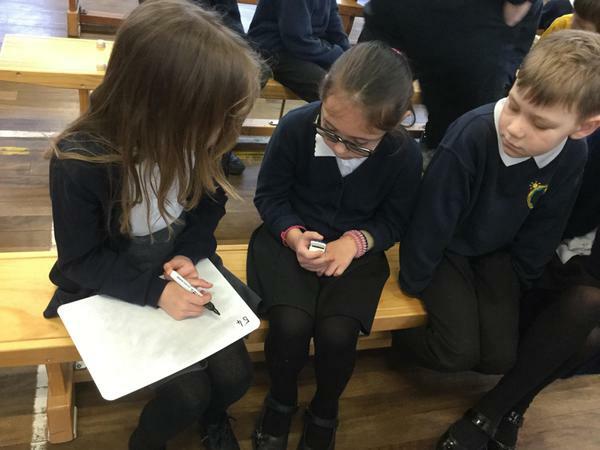 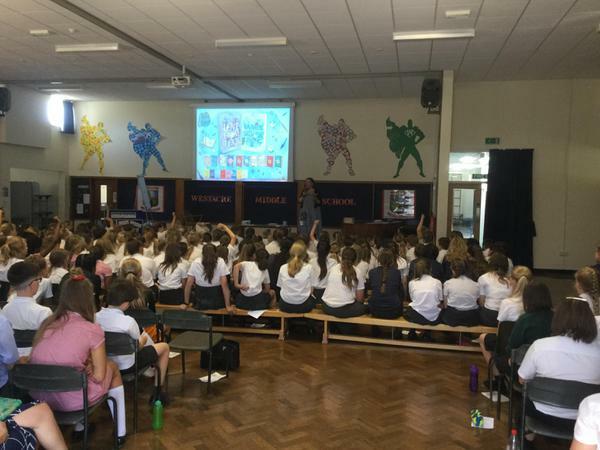 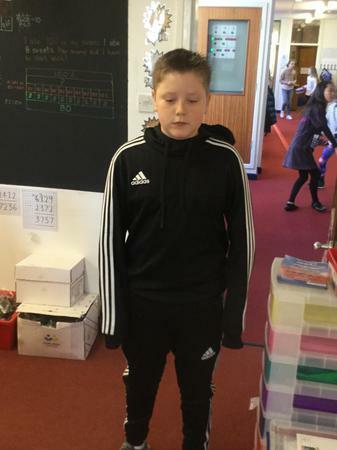 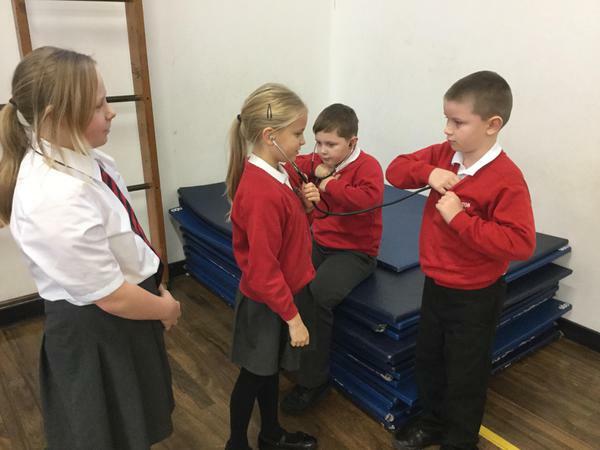 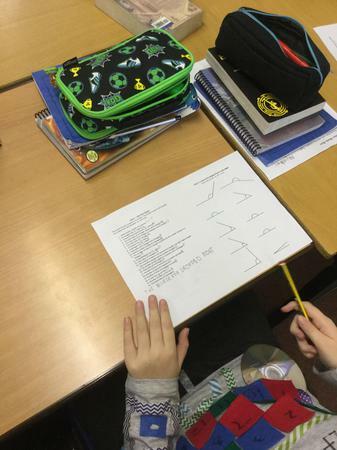 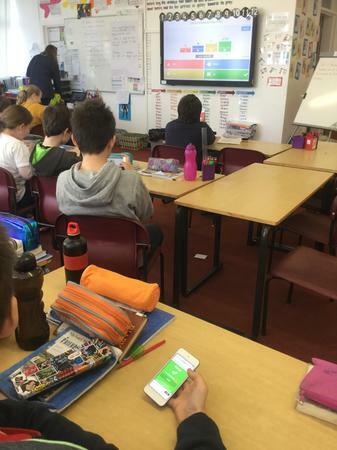 Although, we talk to the children throughout the year about bullying and how to create an environment where it is not tolerated, this week gave us an opportunity as a whole school to do a variety of activities to draw attention to the issue and give the children lots of opportunities to discuss any concerns or ideas they have. 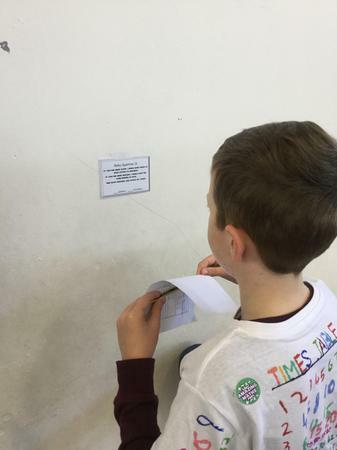 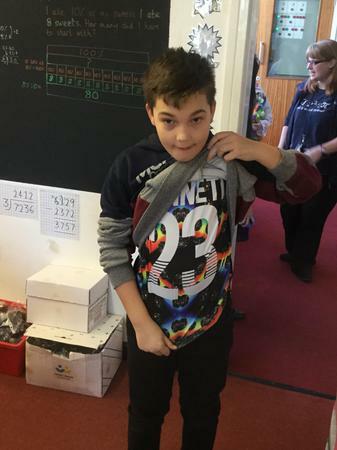 Please watch the video below to get a flavour of some of the activities that took place and look out for our Anti-Bulling graffiti wall next time you are in school! 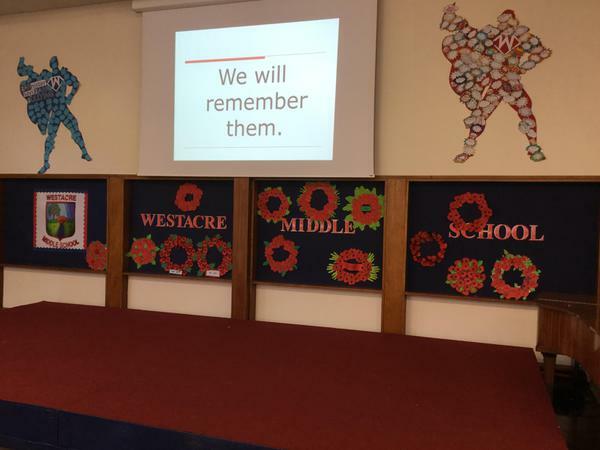 To mark Remembrance Day, we held a special whole-school assembly on November 10th. 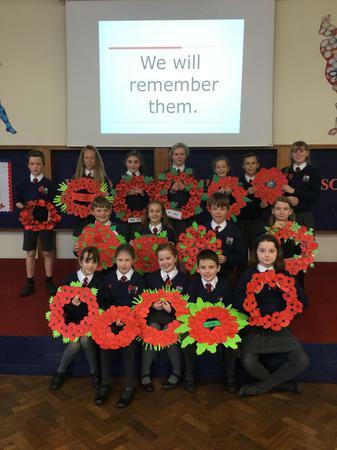 Miss Withams told us about the history of this special day and why it is important we still remember those who lost their lives during conflict. 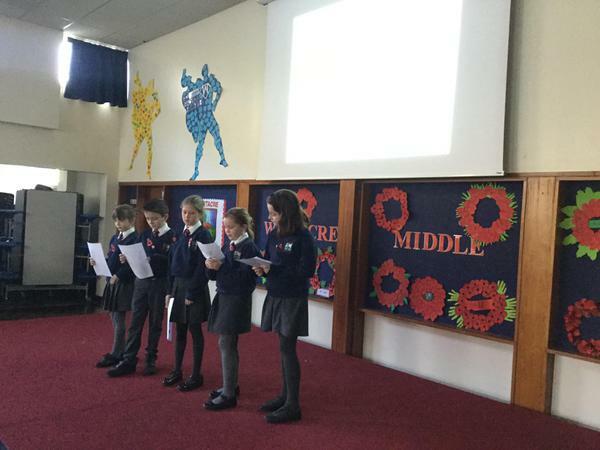 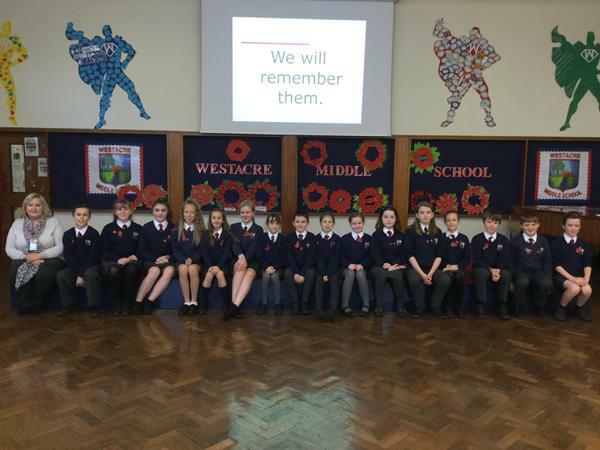 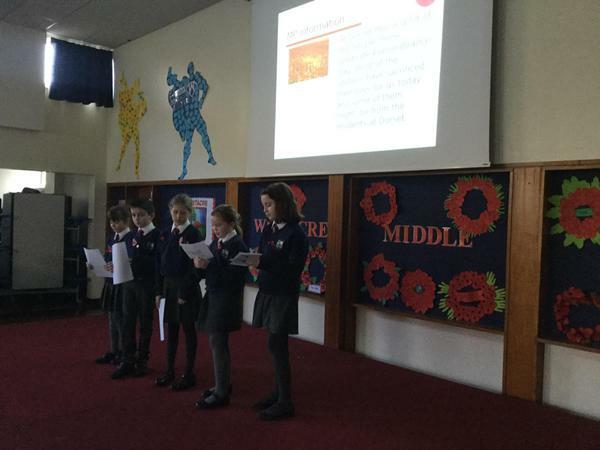 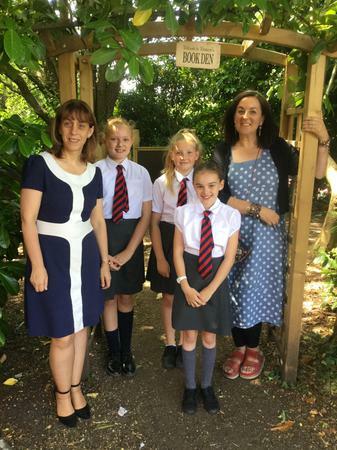 Year 7 pupils did a poetry reading from Flanders Field then Year 5 MPs told everyone about their recent visit to Dorset House and what the elderly residents there told them about their memories of war. 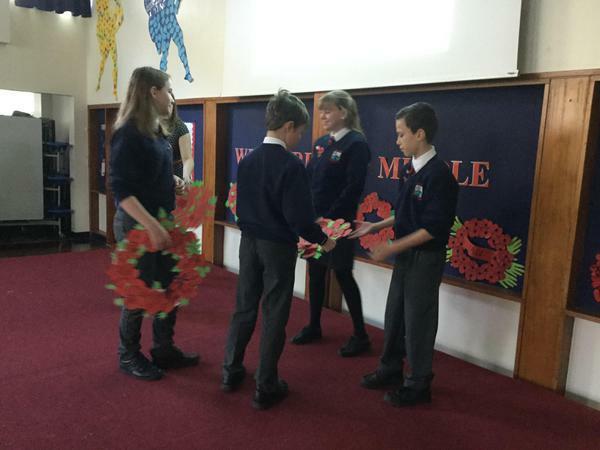 After we observed a two minute silence, each of our school MPs joined our Head Boy Jack and Head Girl Verity to lay a wreath created by their class. 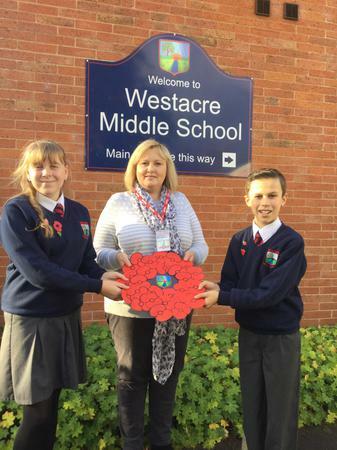 Jack and Verity then donated a special wreath created in school to Lisa from Dorset House. 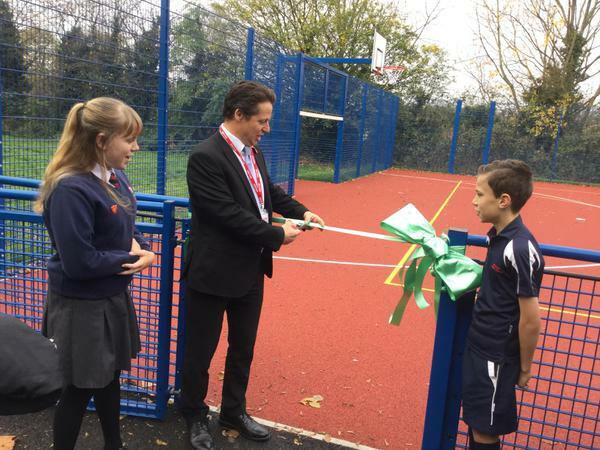 We opened our new Multi-Use Games Arena with a special week of activities that included an official opening from local MP Nigel Huddleston. 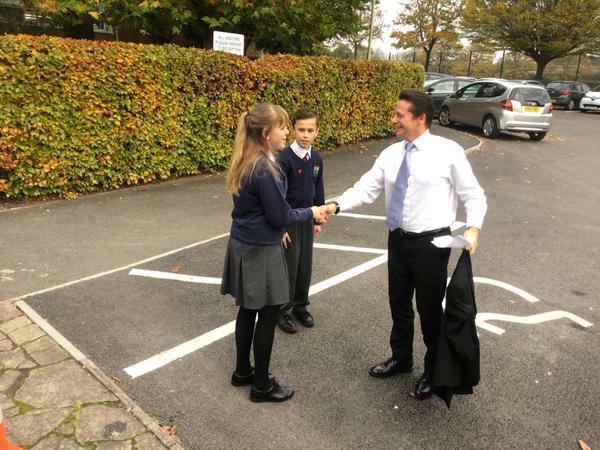 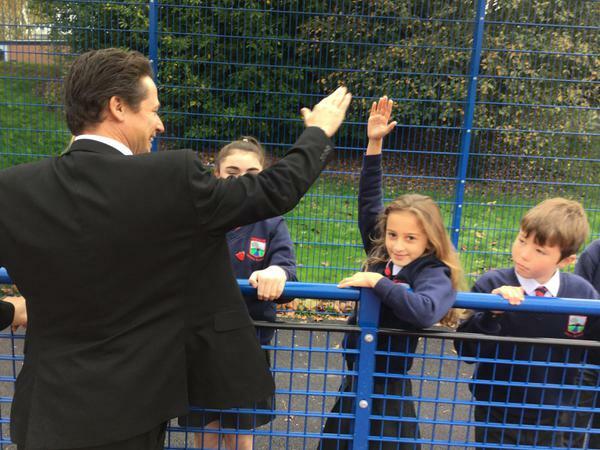 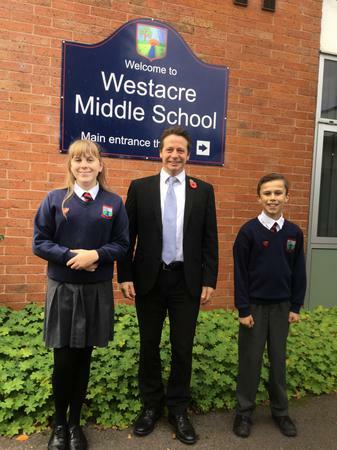 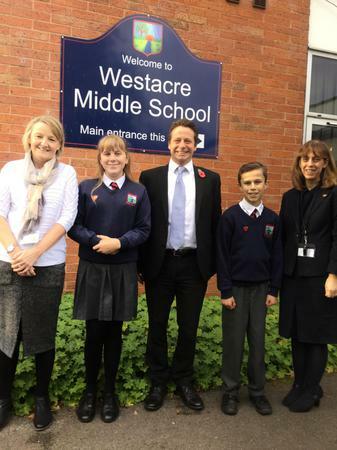 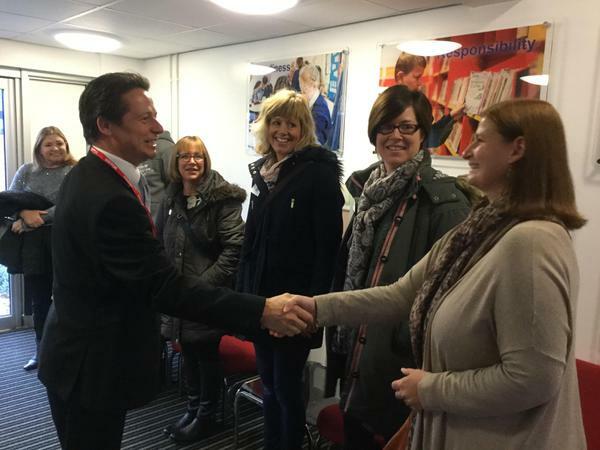 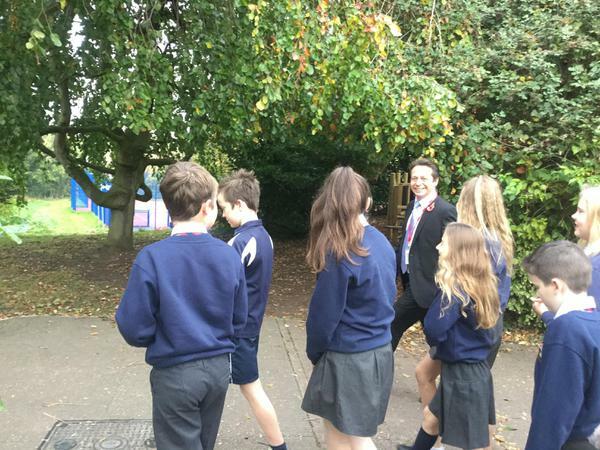 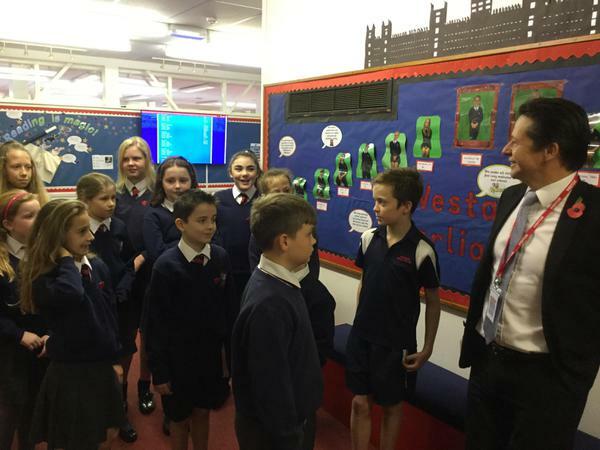 He visited Westacre to meet the school's leadership team, PTA group, pupil MPs and sports leaders. 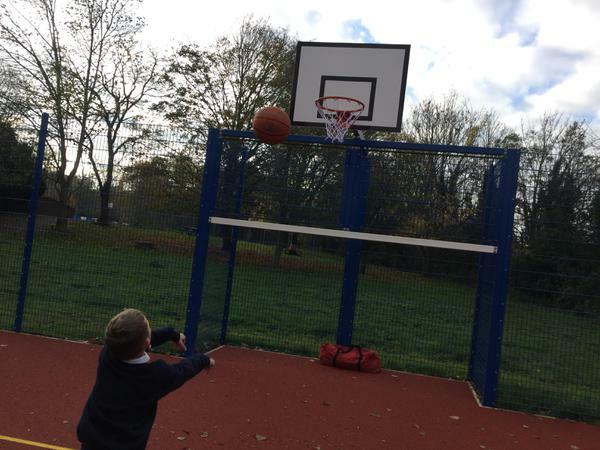 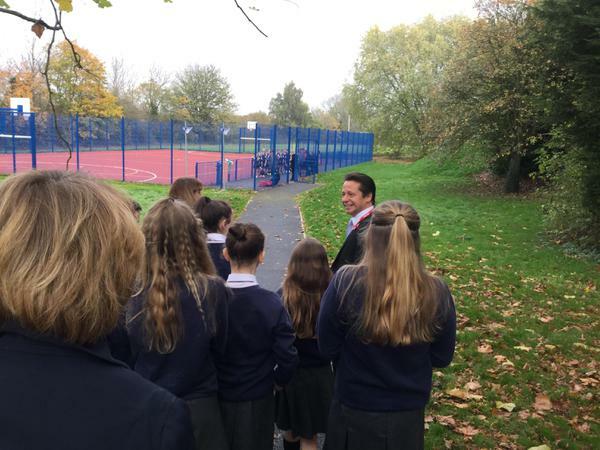 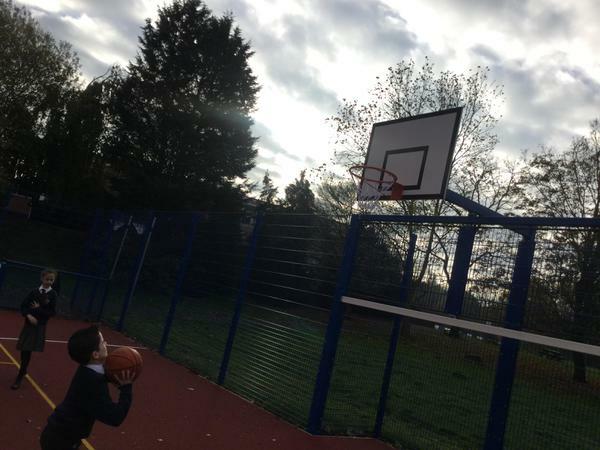 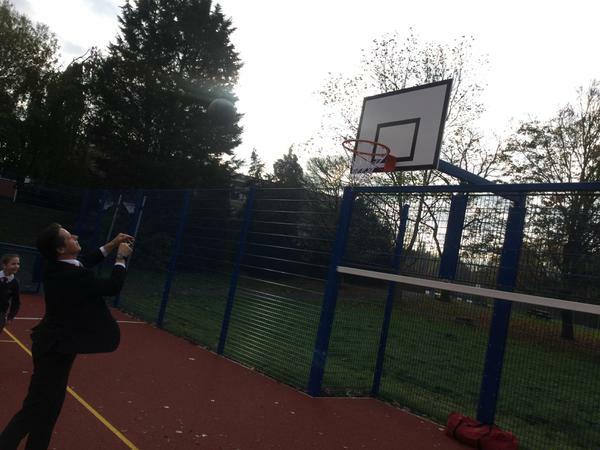 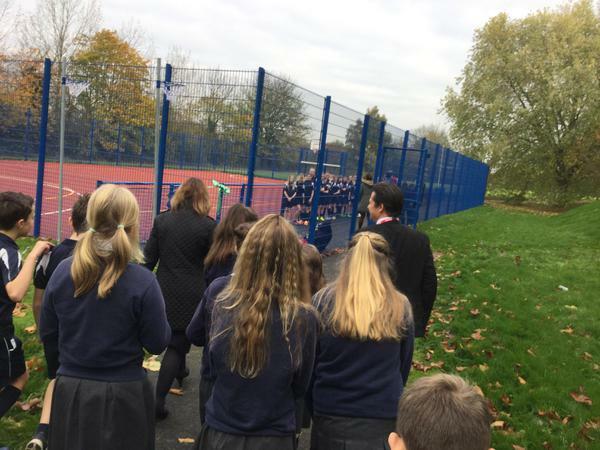 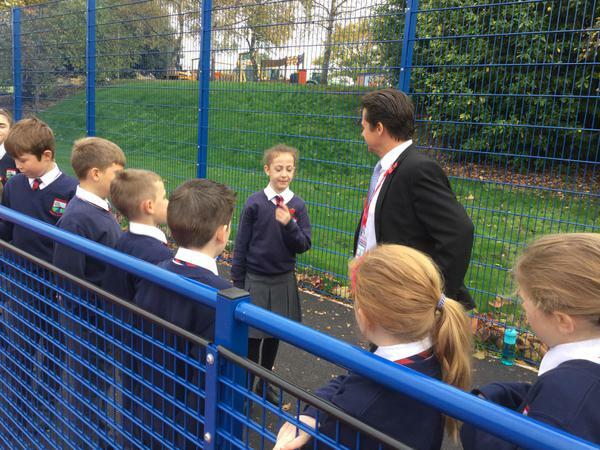 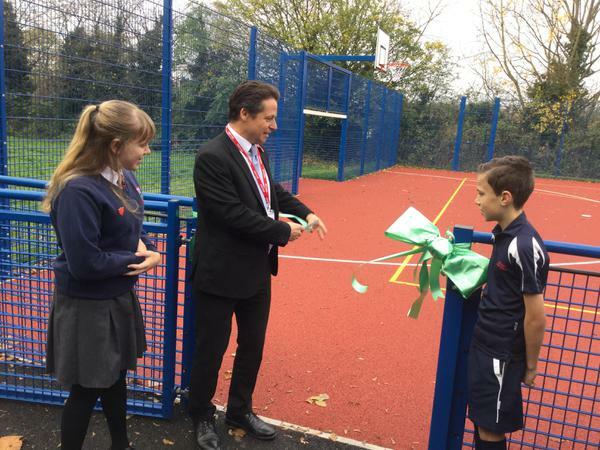 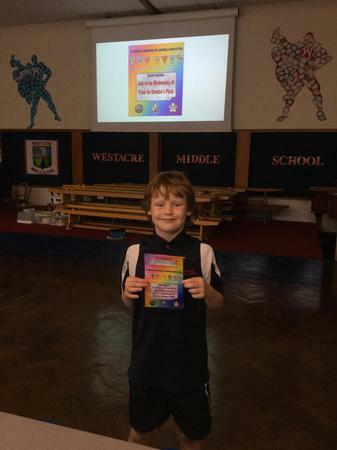 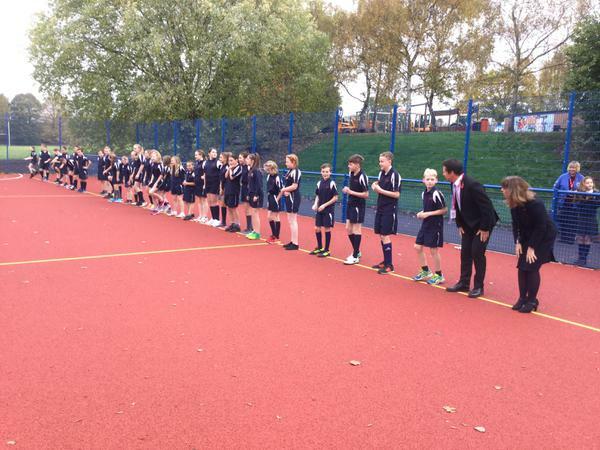 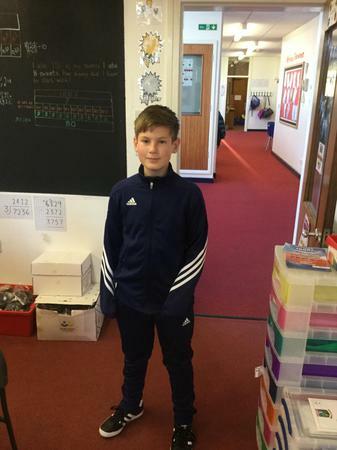 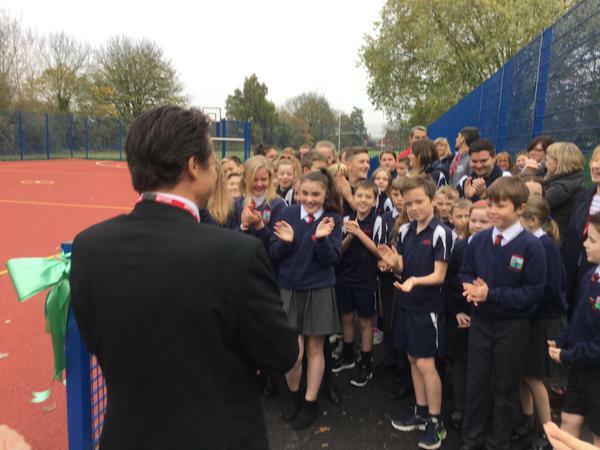 He then cut the ribbon in front of many members of the school community, before joining a Year 7 class for a Basketball lesson on the main court of the Muga. 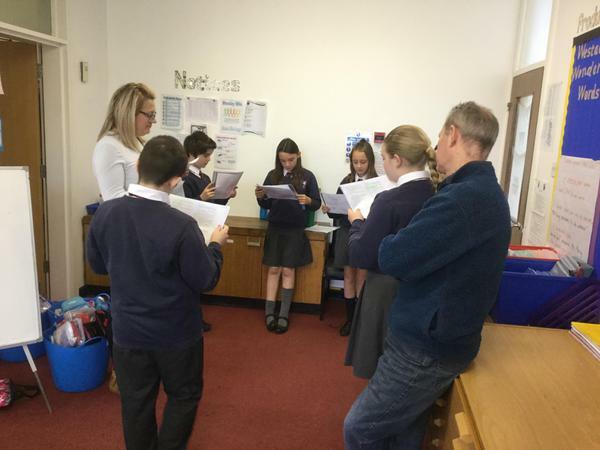 Both Nigel Huddleston and Mrs Evans enjoyed taking part in the lesson! 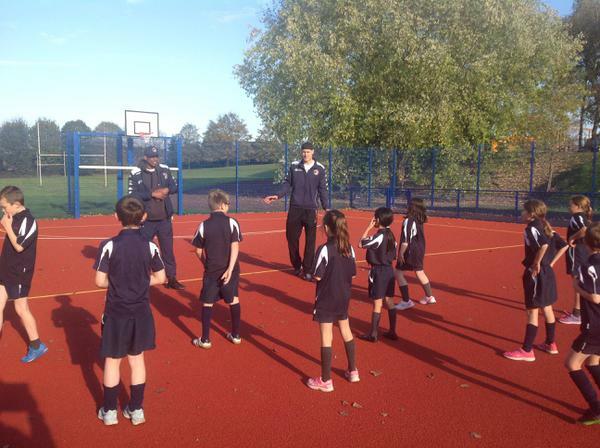 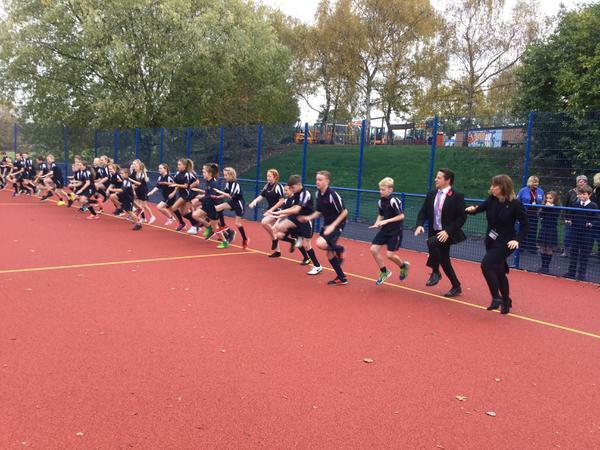 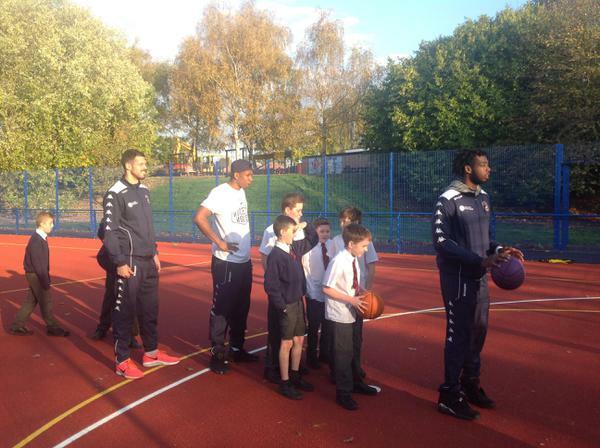 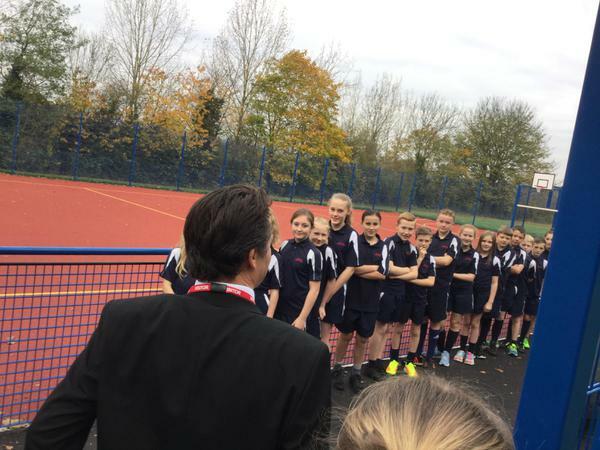 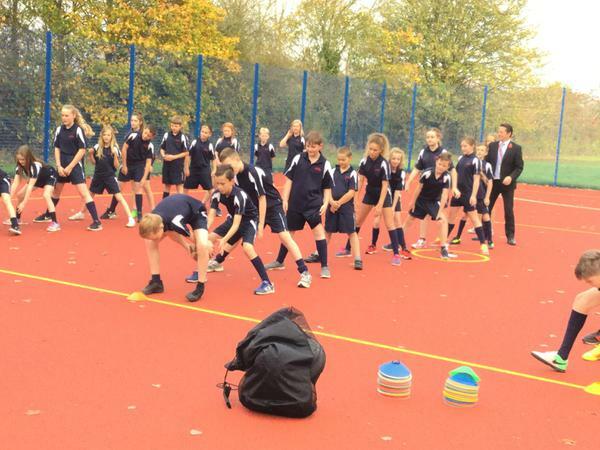 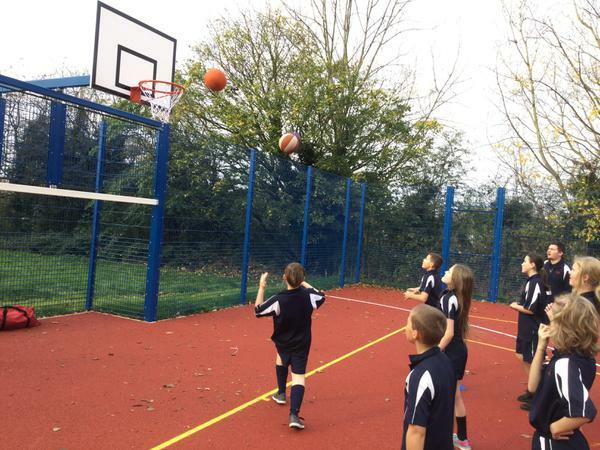 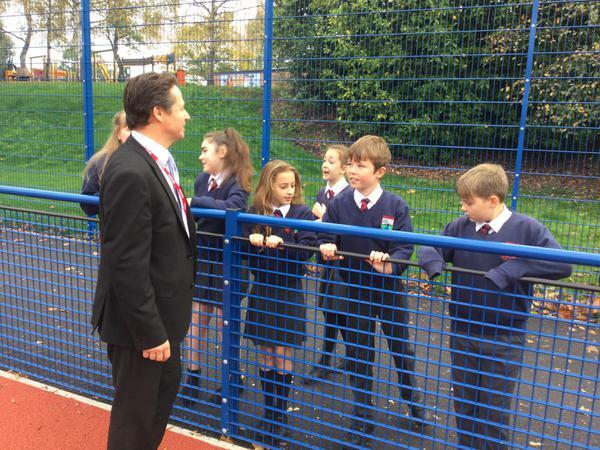 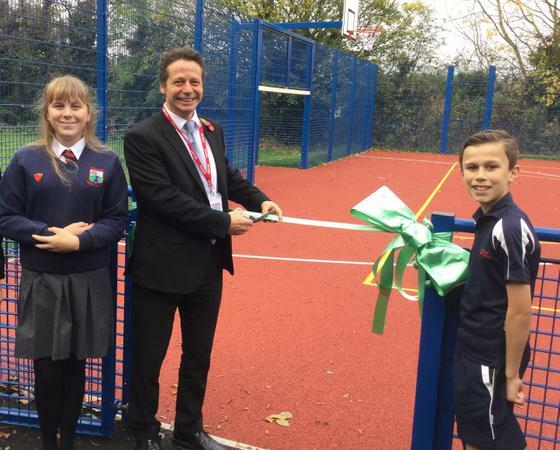 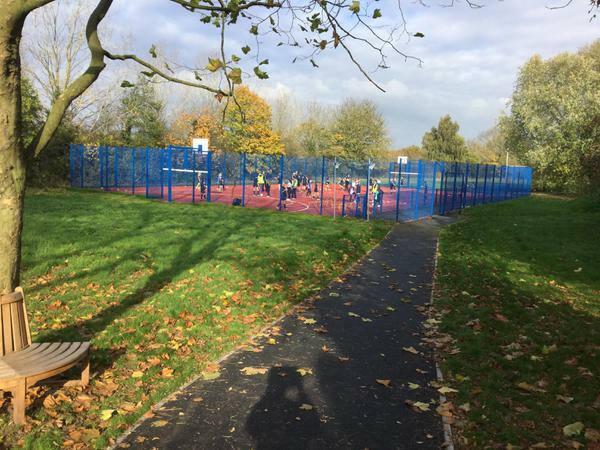 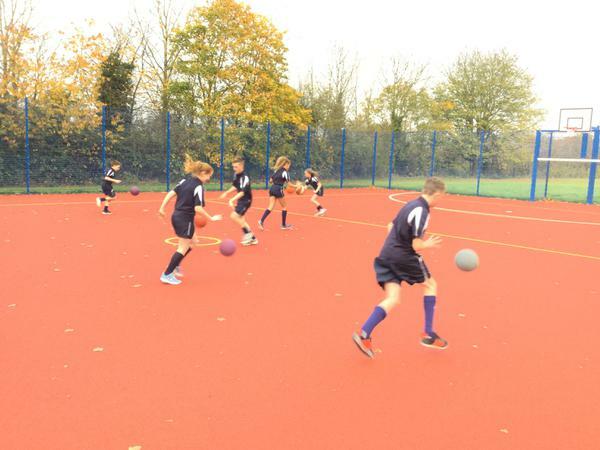 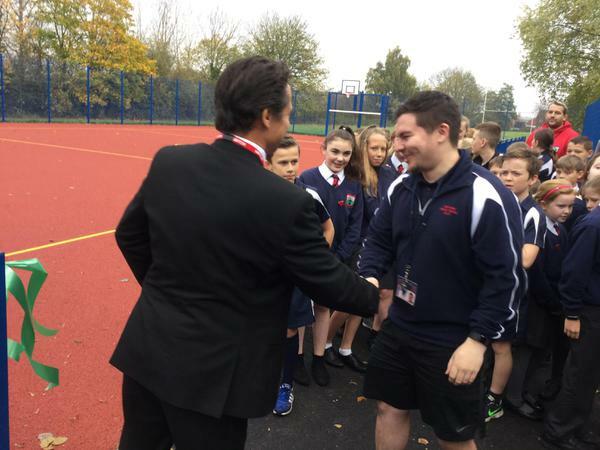 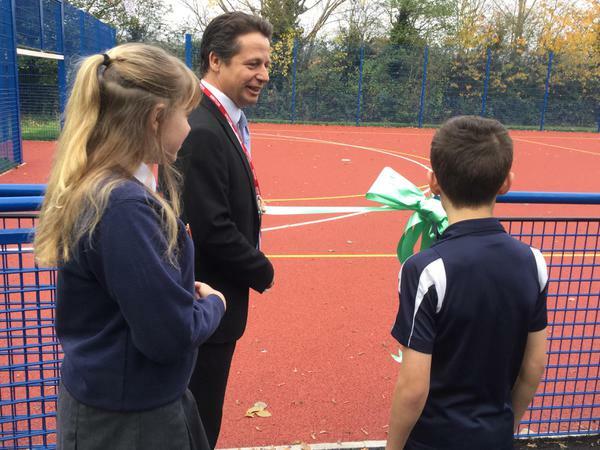 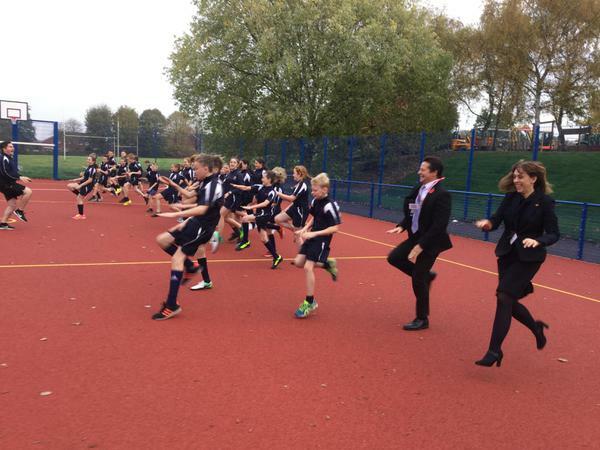 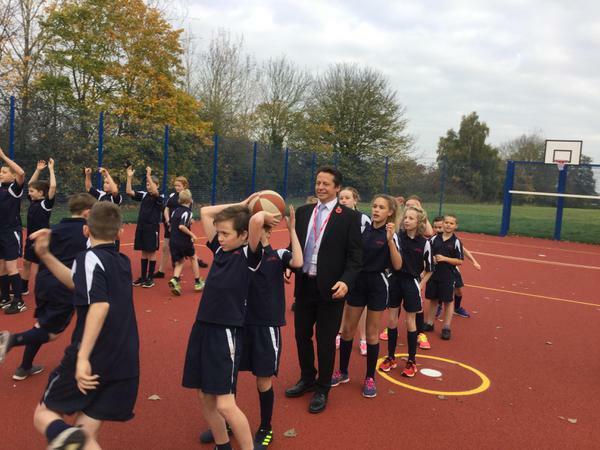 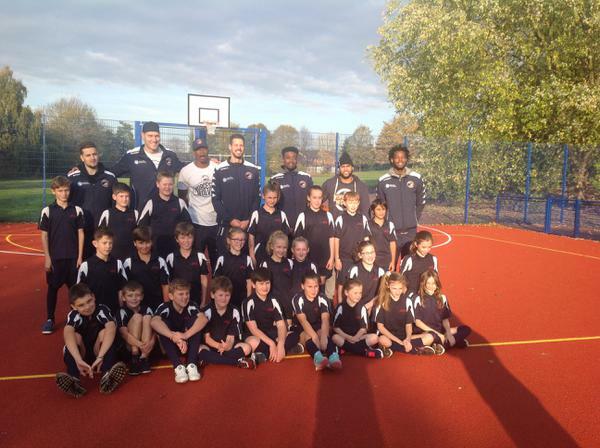 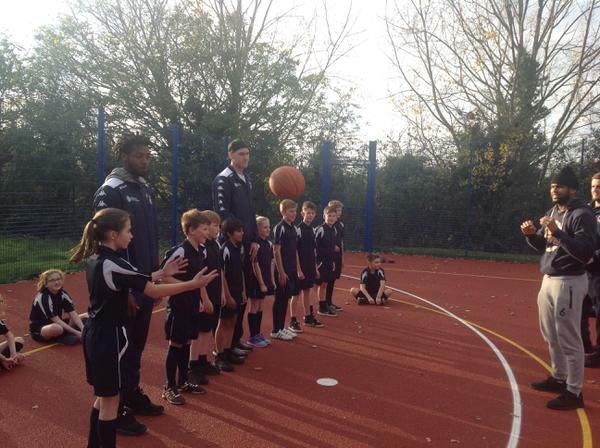 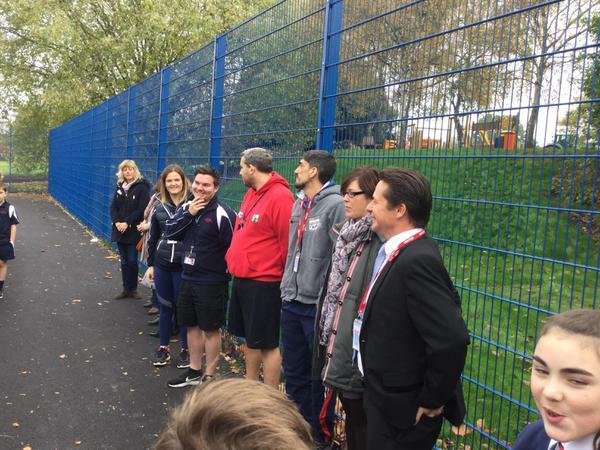 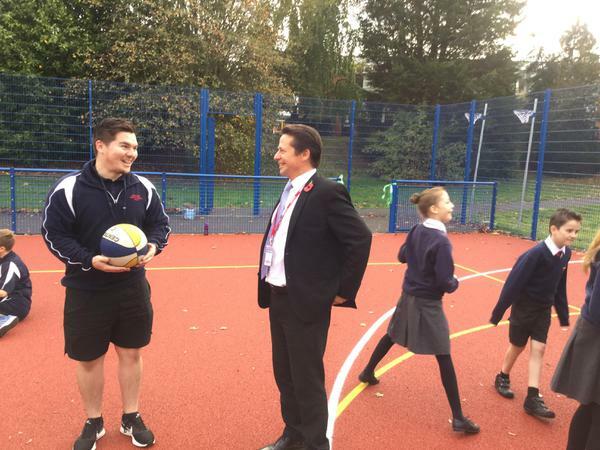 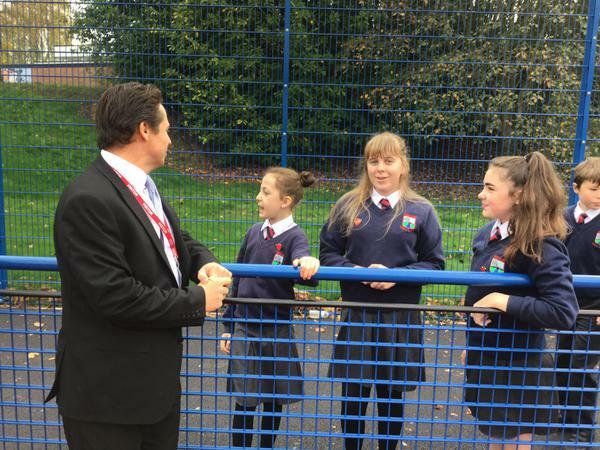 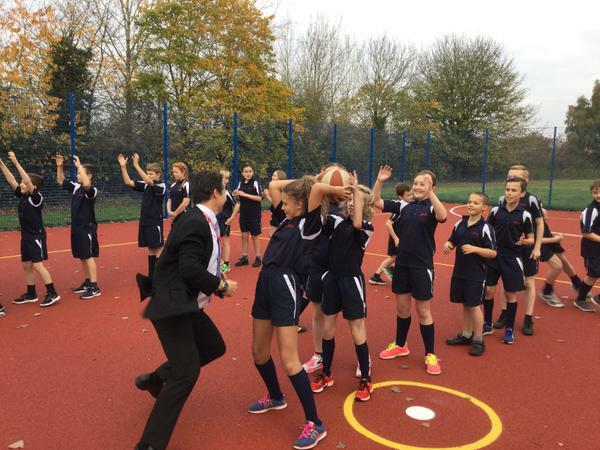 Mr Huddleston commented, "It was a pleasure to visit Westacre again and see the new Muga sports facility. 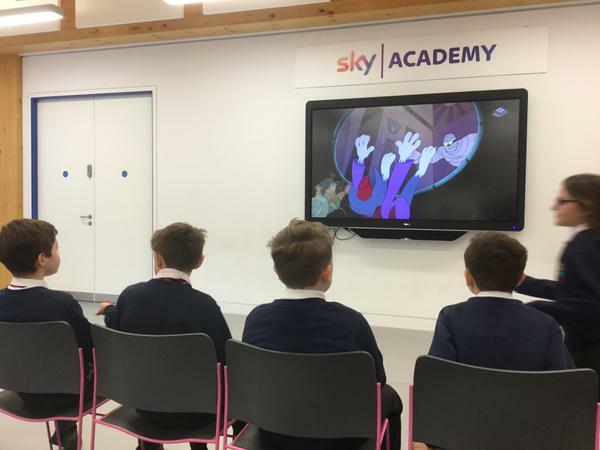 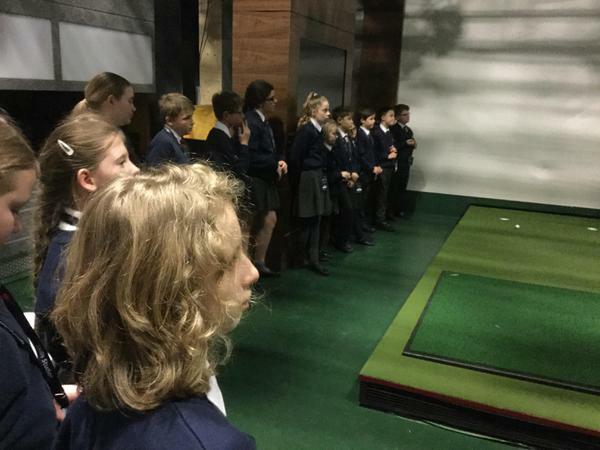 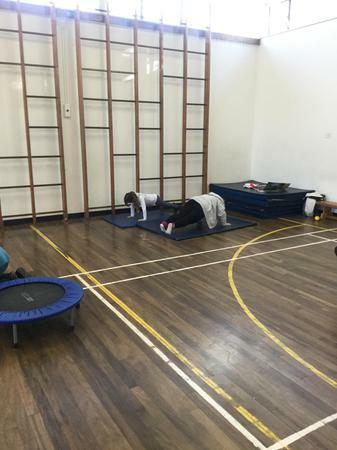 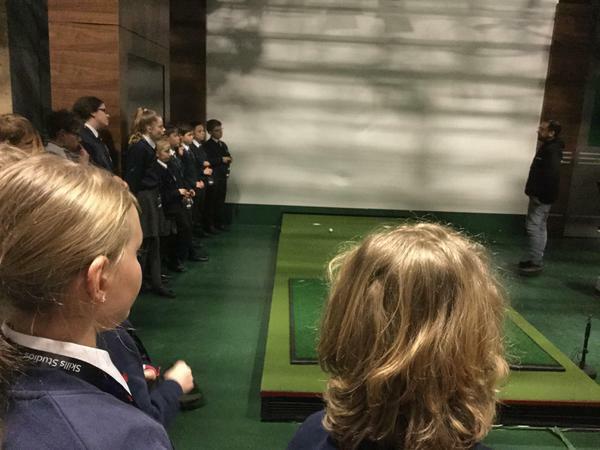 The children were rightly very enthusiastic about the amazing facilities here and I was pleased to able to join in with the lesson!" 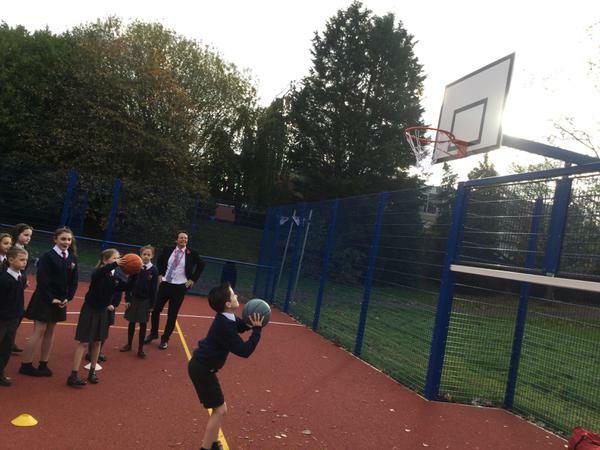 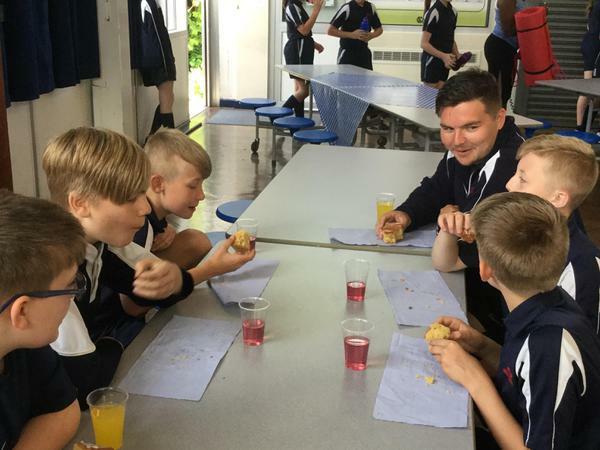 We also welcomed a number of visitors to the school, including Year 4 pupils from Wychbold First School, who had a fun, multi-skills session organised by Mr McMullen and the new Year 7 sports leaders. 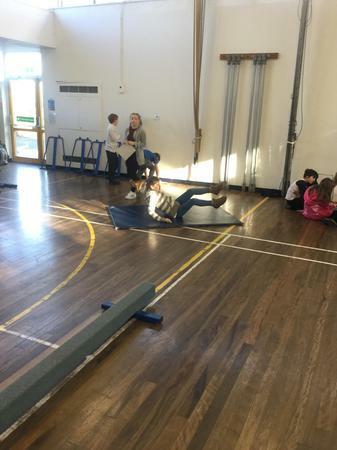 Both staff and pupils from Wychbold commented on how enjoyable the session was. 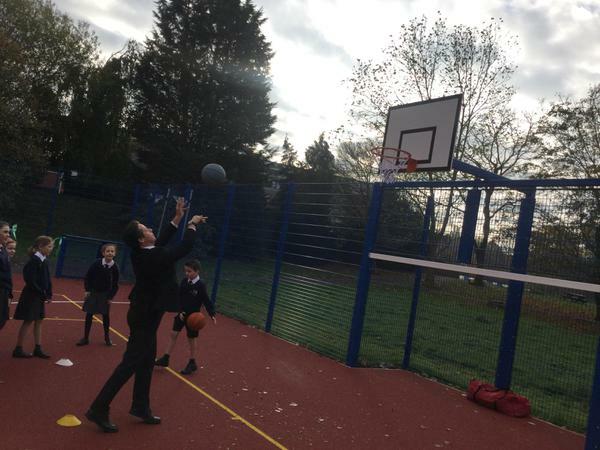 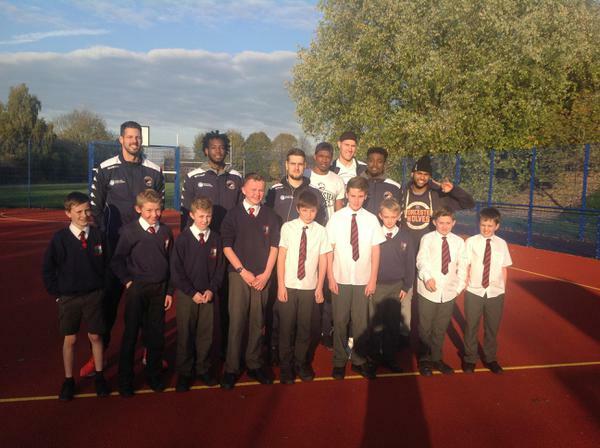 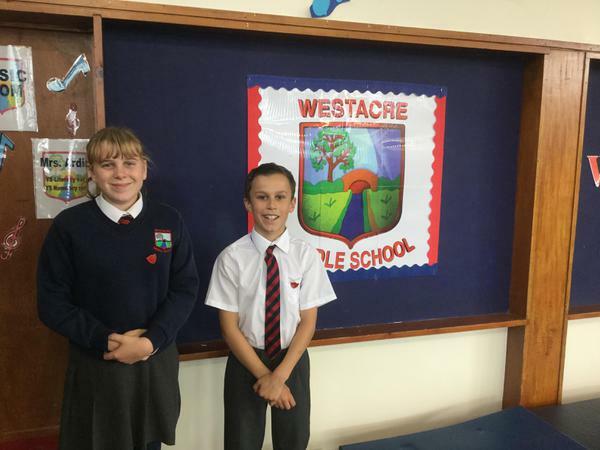 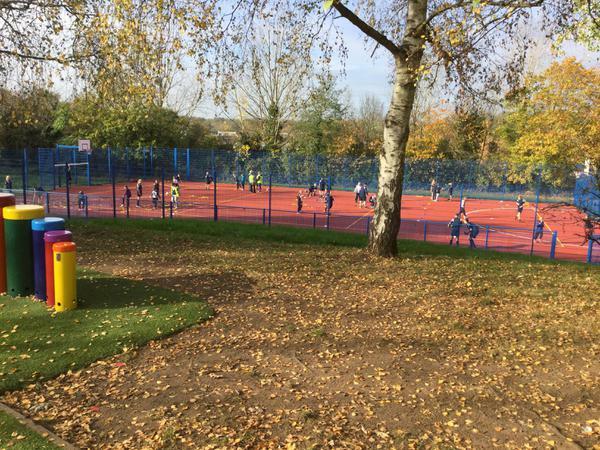 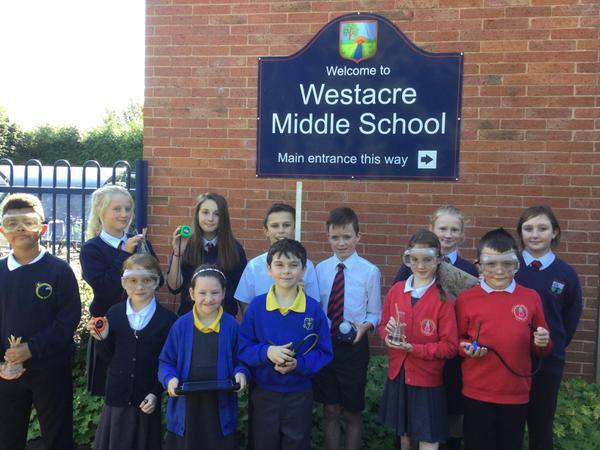 Pupils at Westacre are now looking forward to spending many of their twice-weekly PE lessons on the Muga throughout the year. 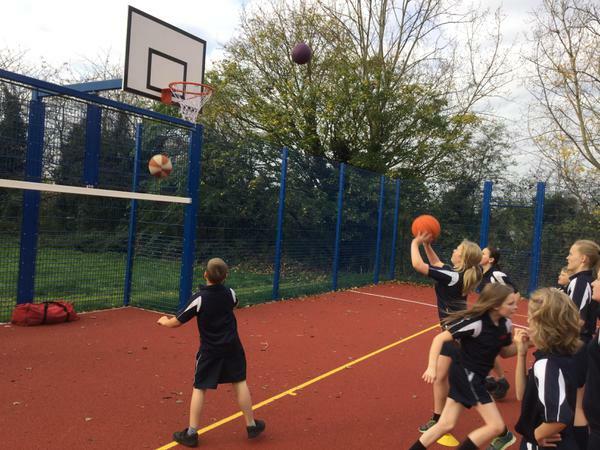 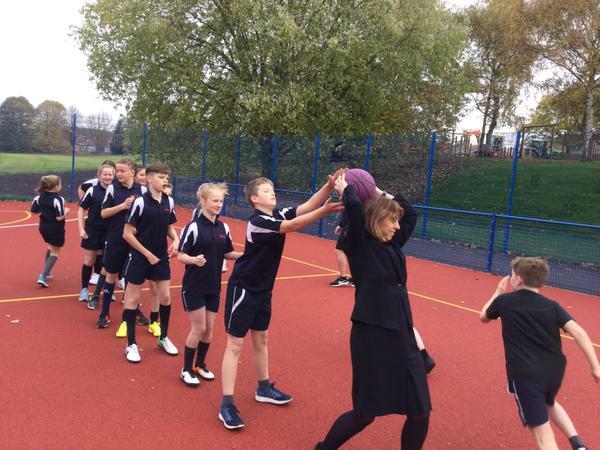 The many extra-curricular opportunities available at the school, including boys and girls football, basketball, netball and rounders, will also take place on the all-weather court. 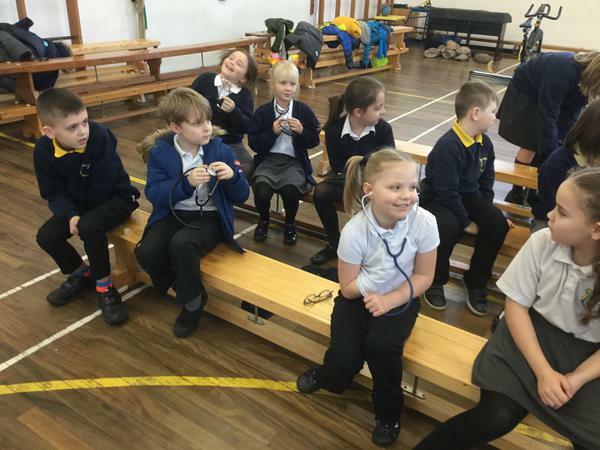 A big thank you to Charlotte Paddock from, Dogs Trust Evesham, for coming into school this week to teach the children about staying safe around dogs. 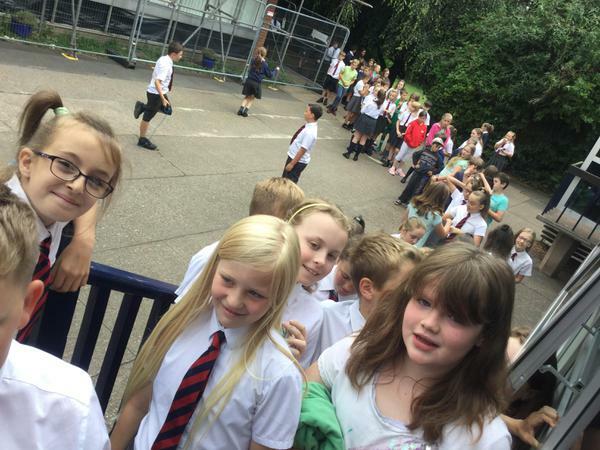 As a school we always acknowledge and reward good behaviour and hard work. 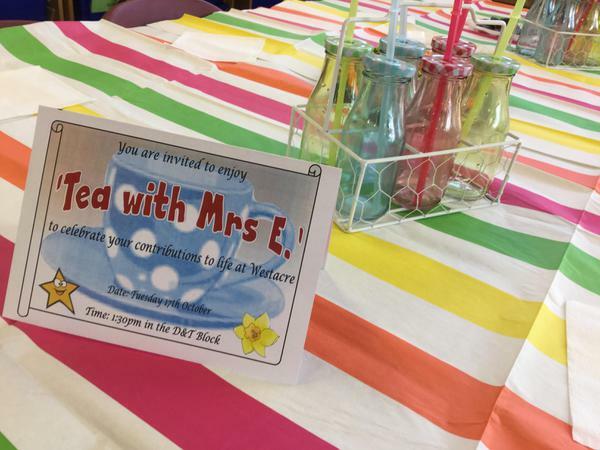 This year we have introduced, “Tea with Mrs E.” Each half term one child from each class will be invited to afternoon tea with Mrs Evans as a reward for working hard and consistently making good choices in school. 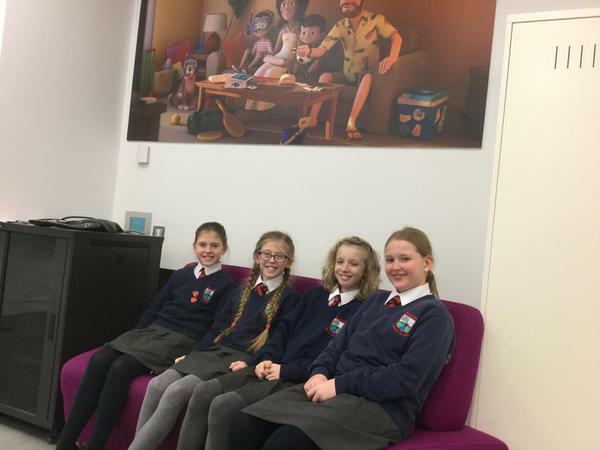 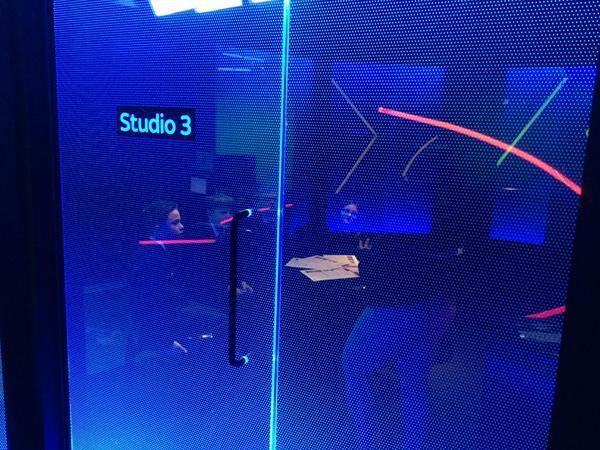 Well done to our first ever guests! 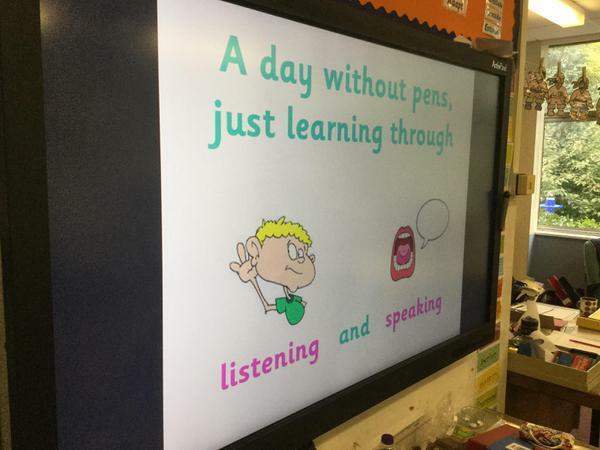 No Pens Day Wednesday is a national event that encourages schools to put down their pens and to run a day of speaking and listening activities. 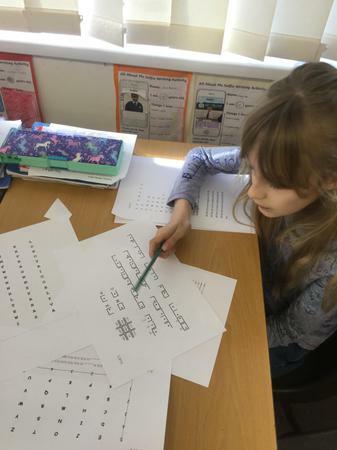 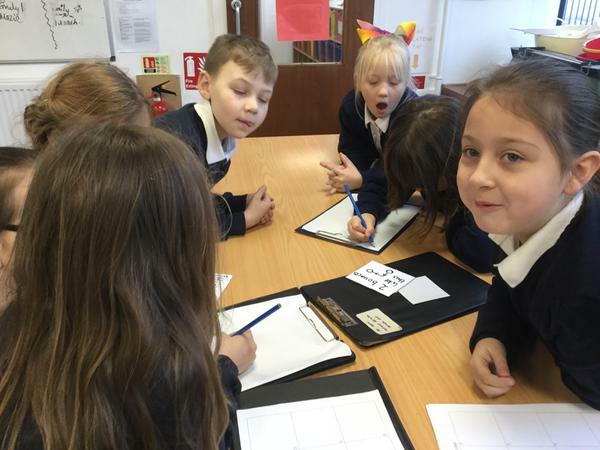 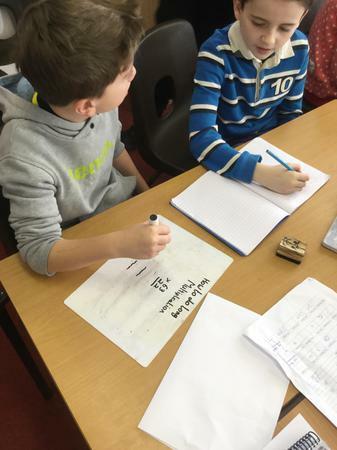 These elements of Literacy are embedded throughout the curriculum at Westacre, but getting involved in this day is still a fun way to remind the children of these important skills. 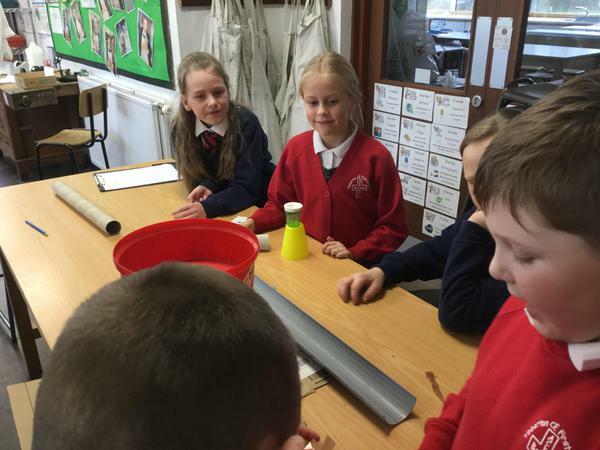 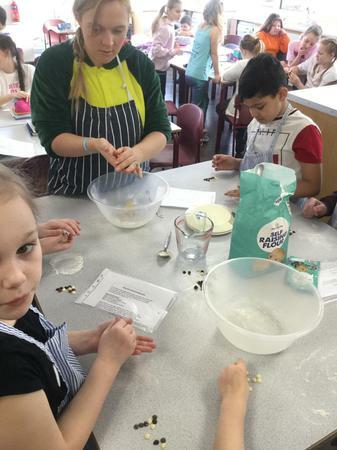 Below are just a few photos of activities across our year groups. 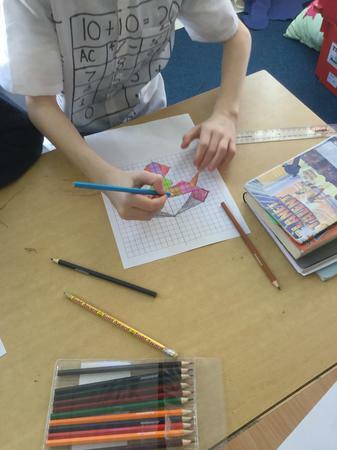 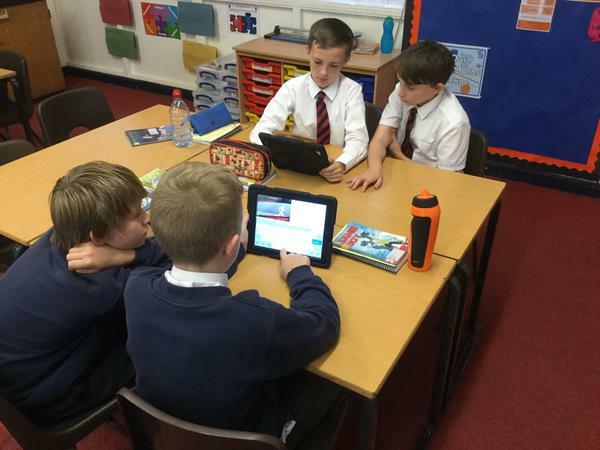 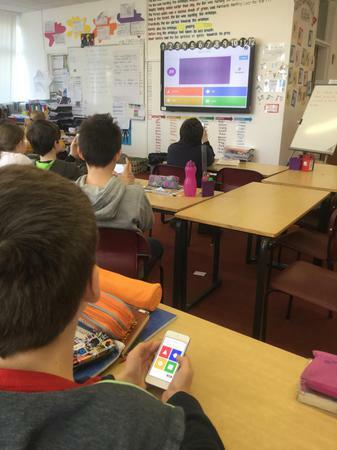 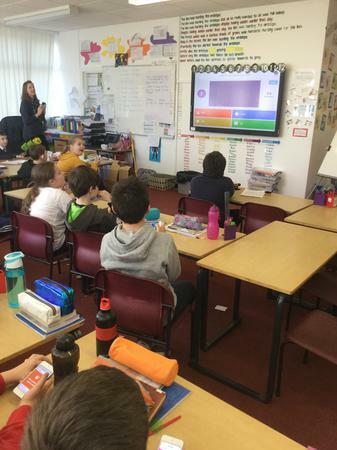 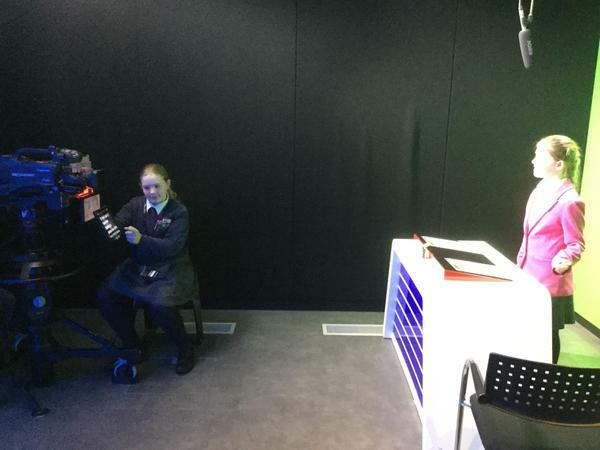 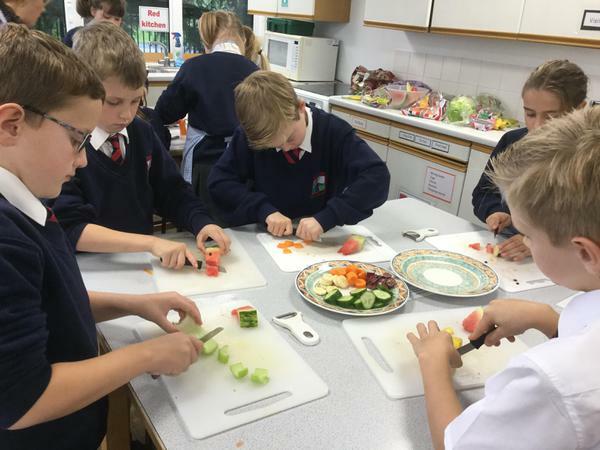 Tasks on the day included Drama, Debating, Art, Cooking, Yoga and Computing. 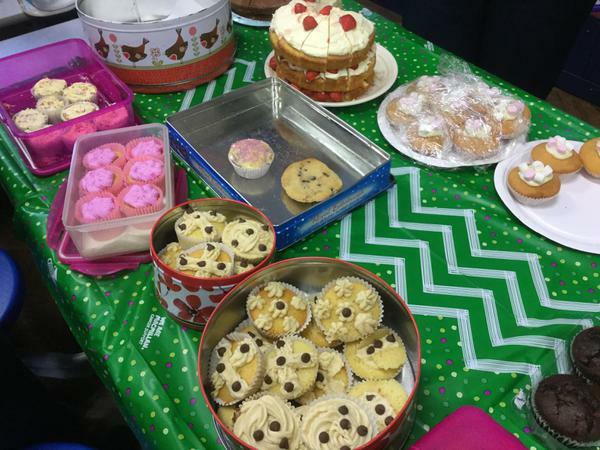 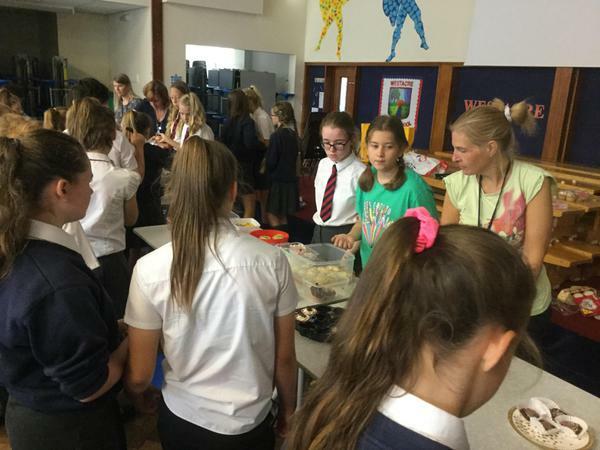 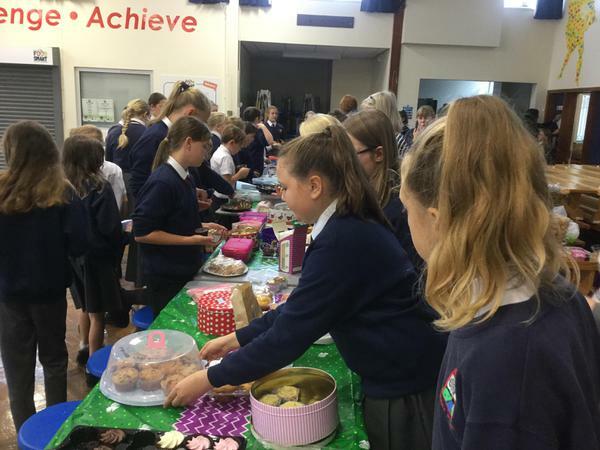 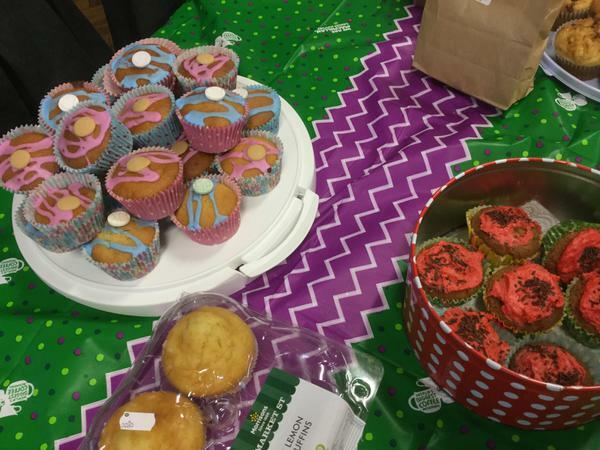 Now becoming an annual event, our Macmillan coffee morning saw a record number of cakes both baked and donated to school. 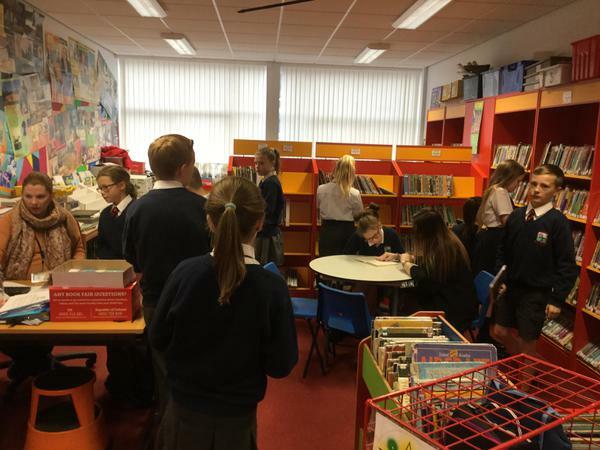 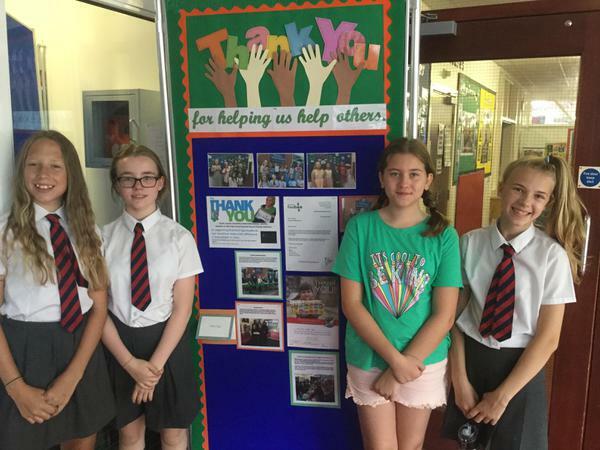 Our Year 7 helpers did a great job managing the sale to the rest of the school. 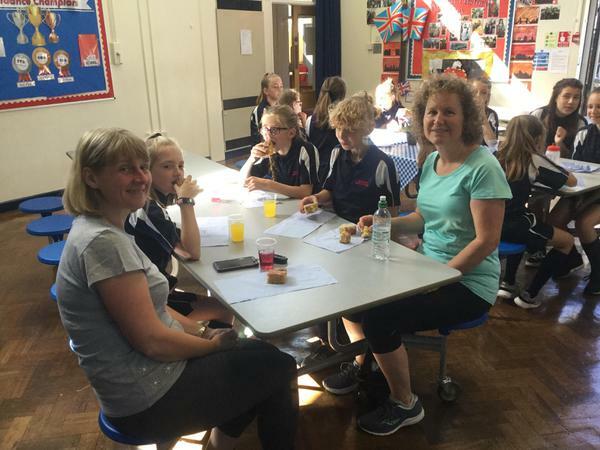 Meanwhile, our Year 5 parents joined in our Read Alongside Morning whilst enjoying a hot drink and slice of cake. 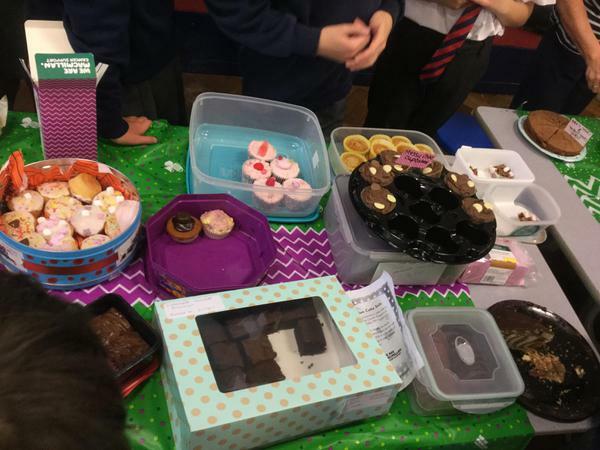 Altogether as a school we have raised an amazing £295.88 for this fantastic cause. 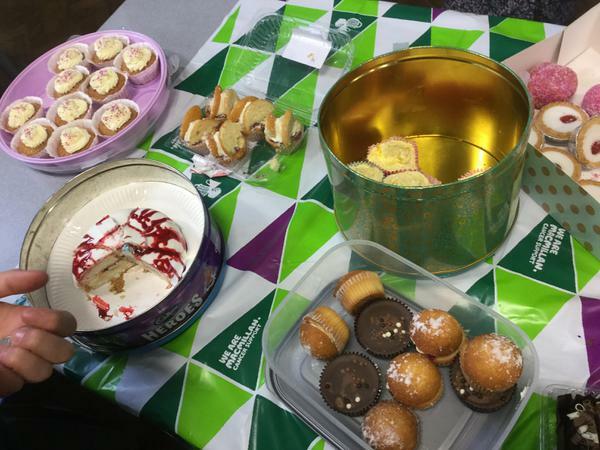 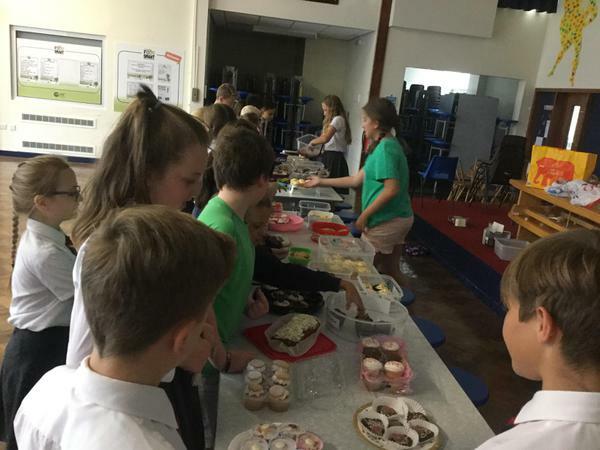 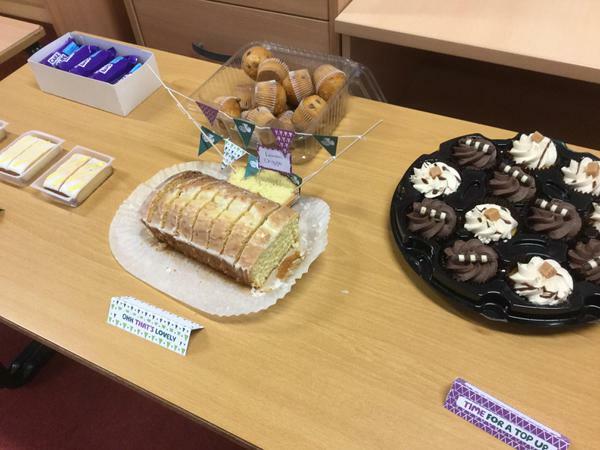 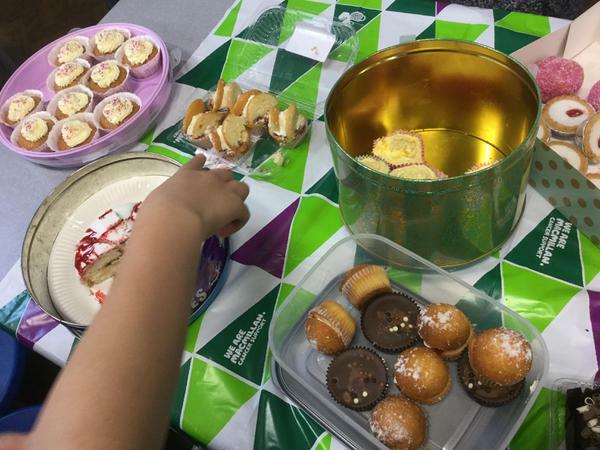 Thank you to all those who supported this event by purchasing cakes, baking their own or turning up to share in our efforts to host a fabulous coffee morning for Macmillan. 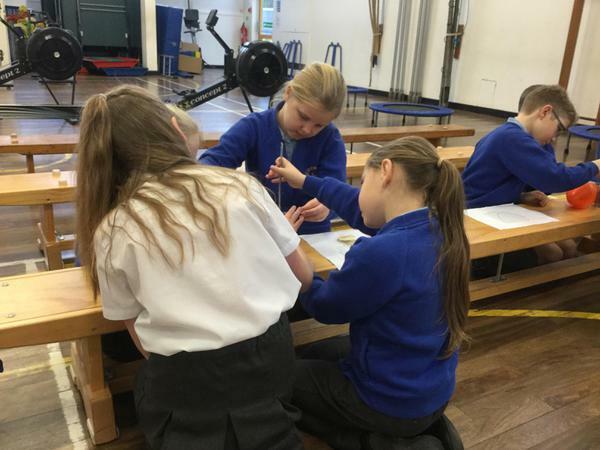 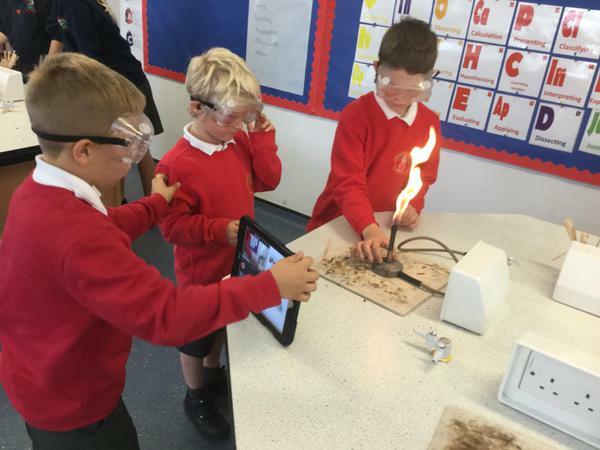 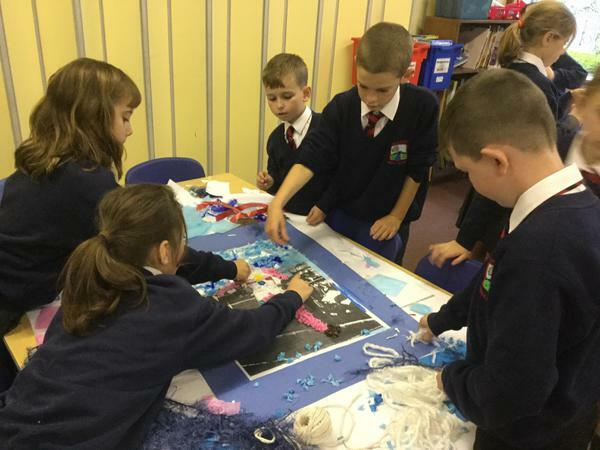 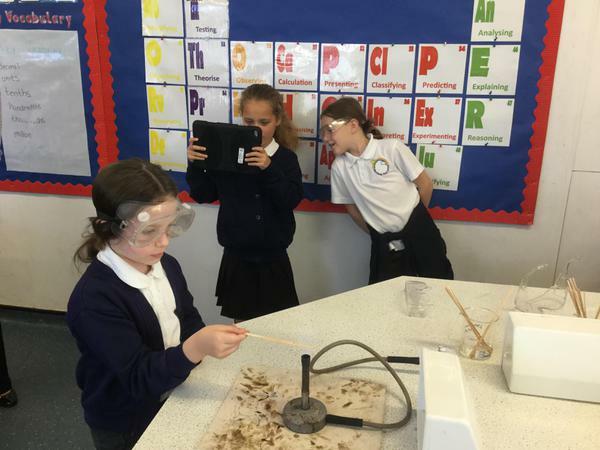 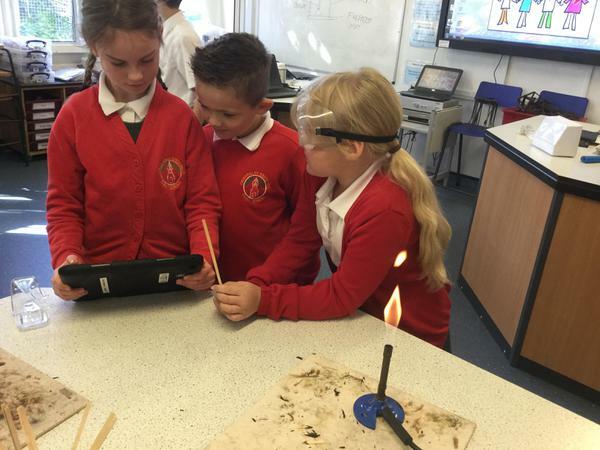 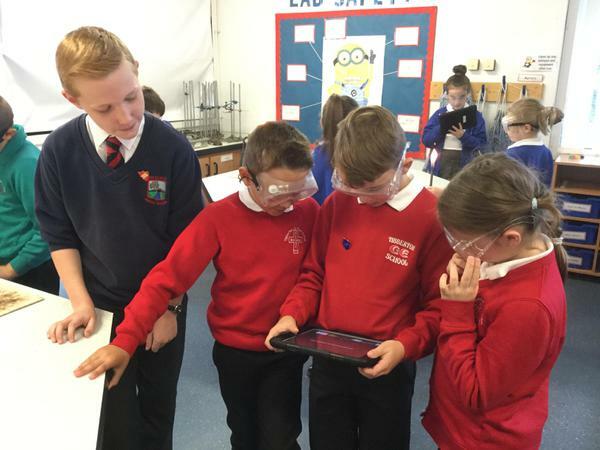 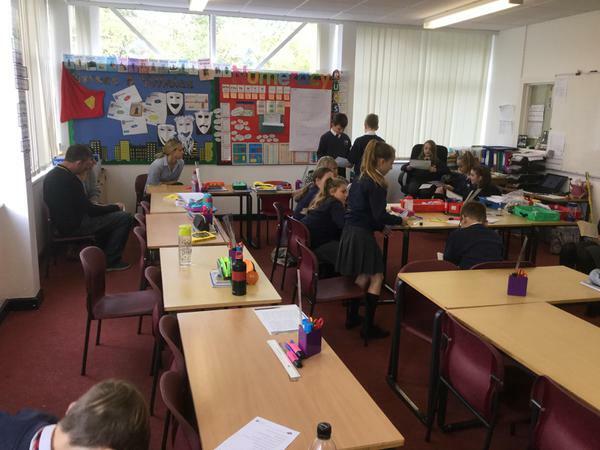 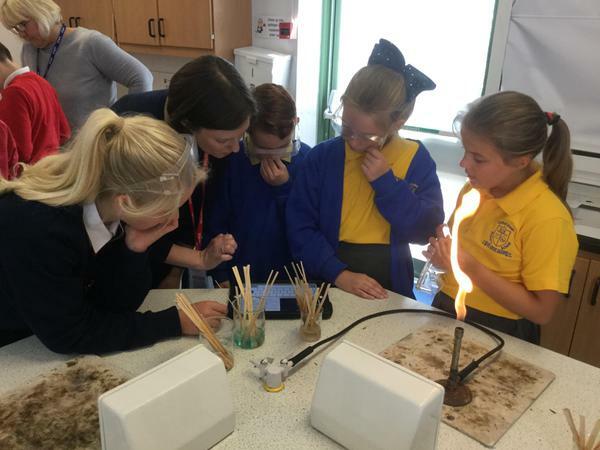 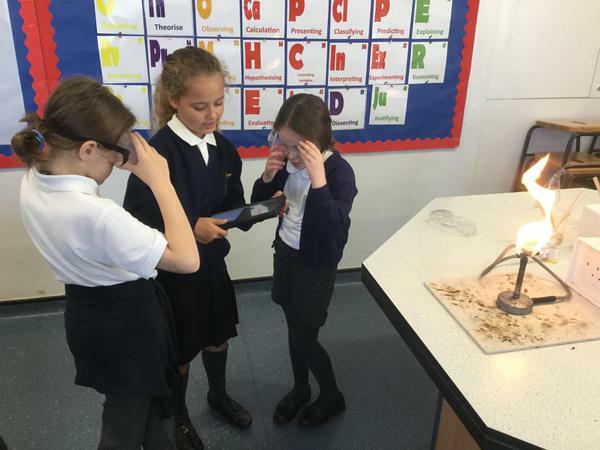 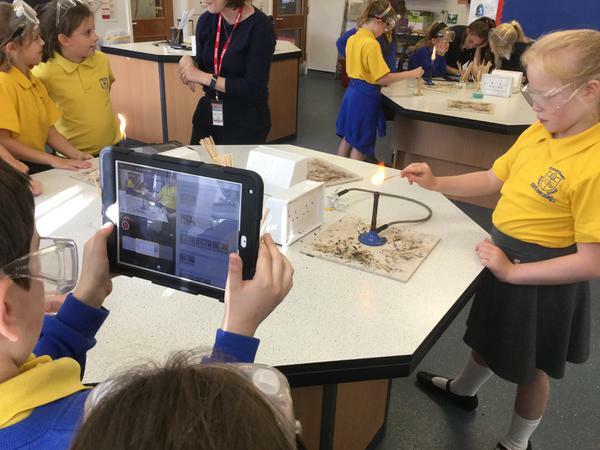 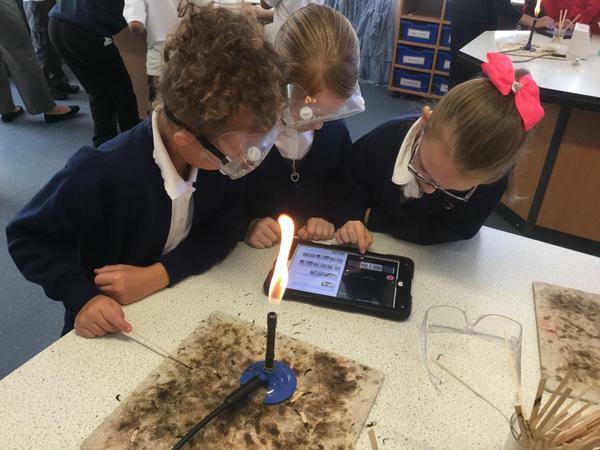 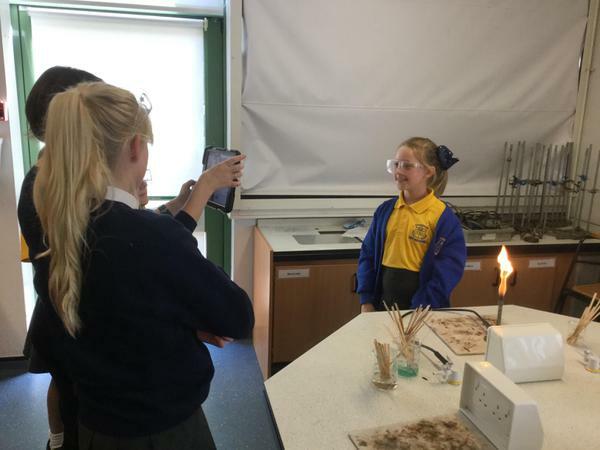 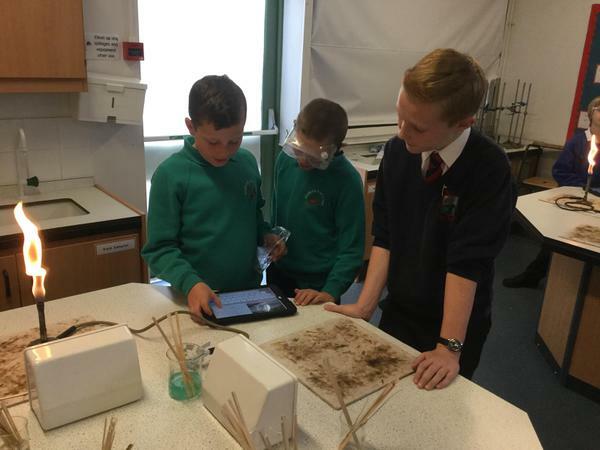 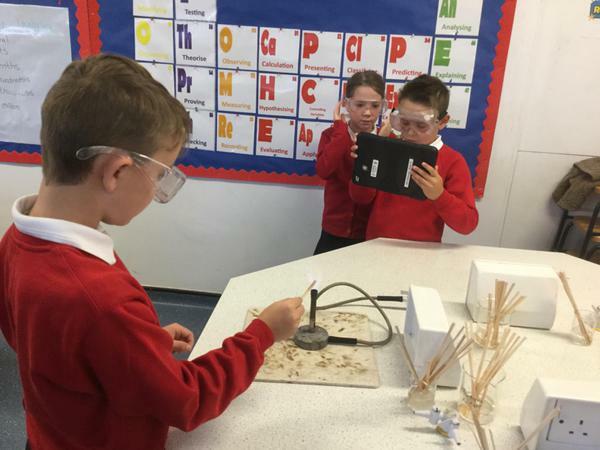 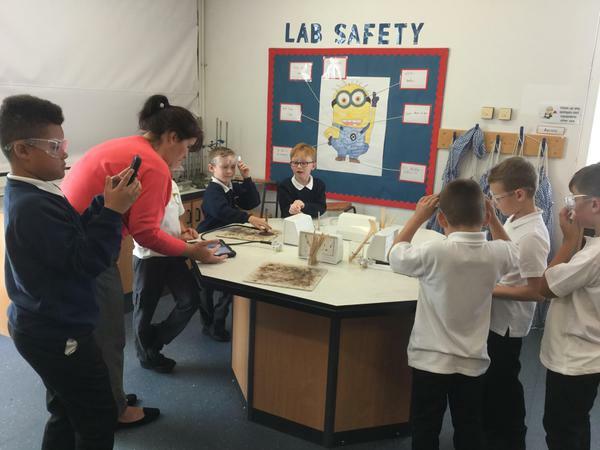 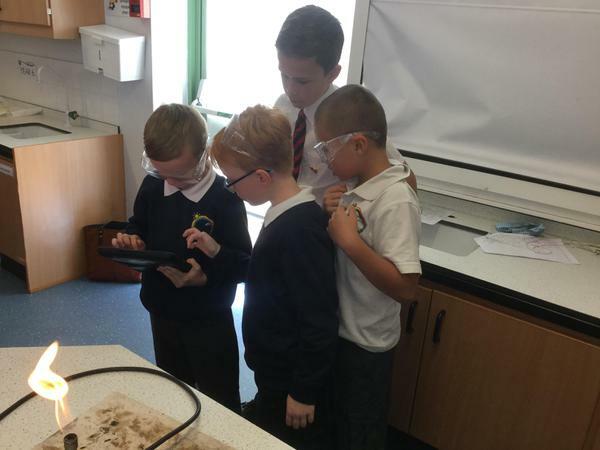 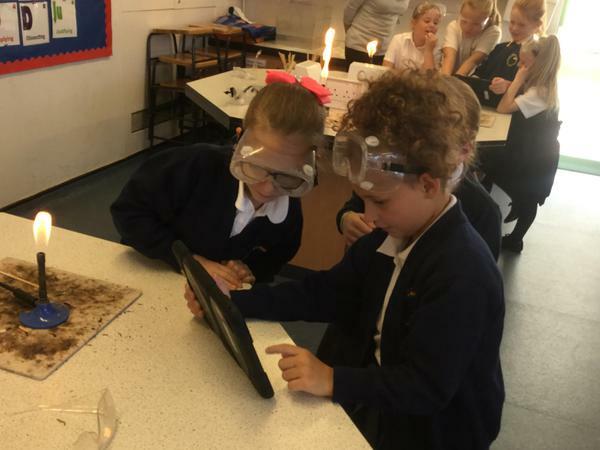 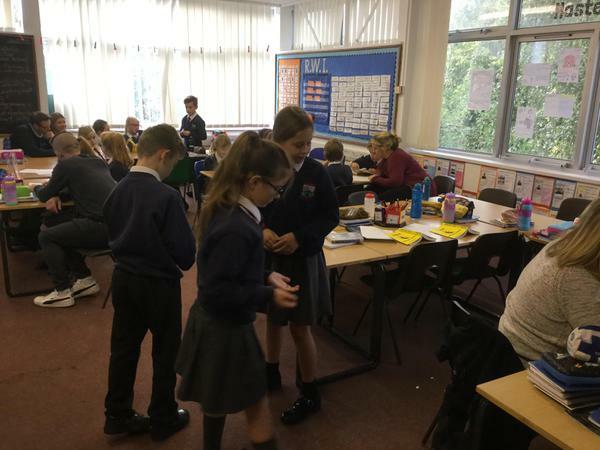 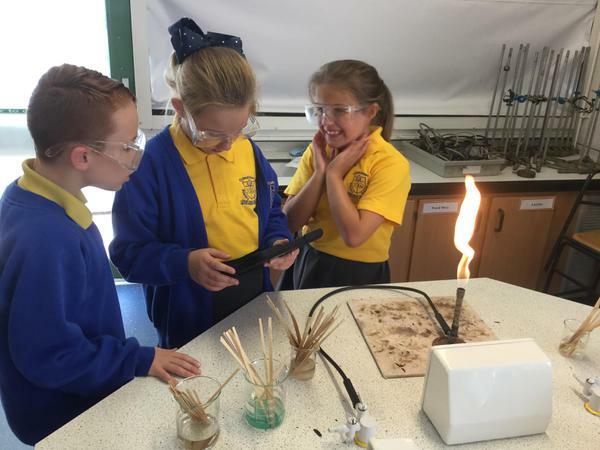 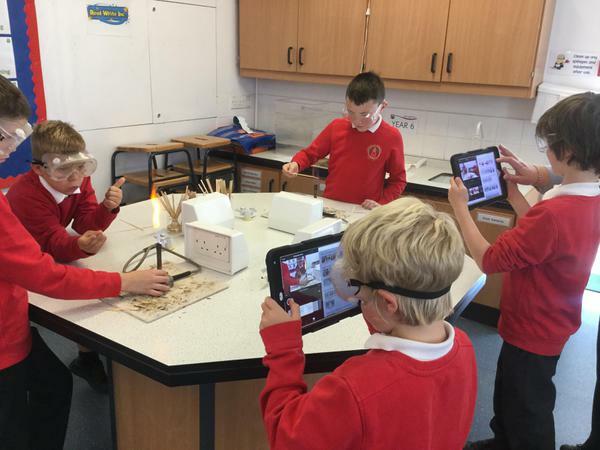 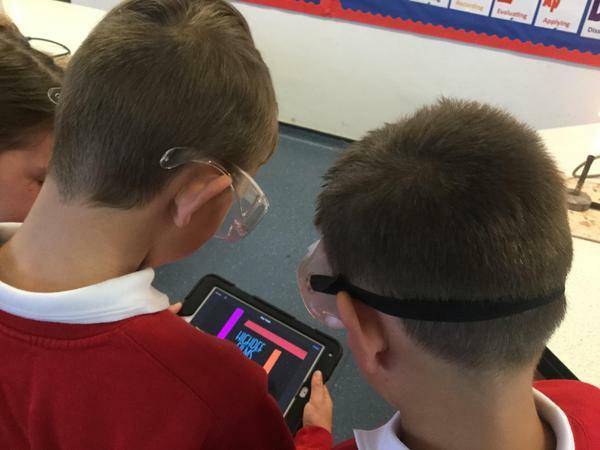 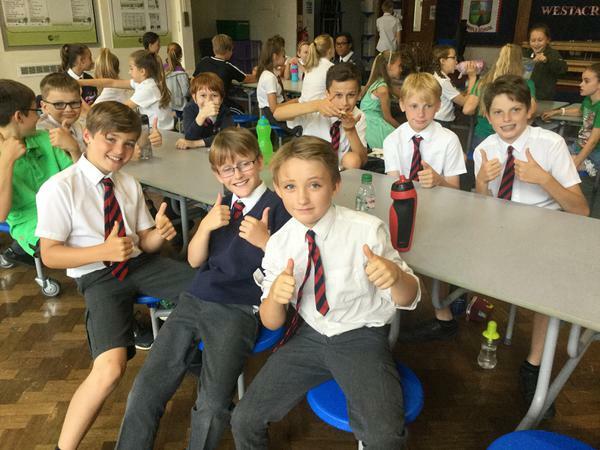 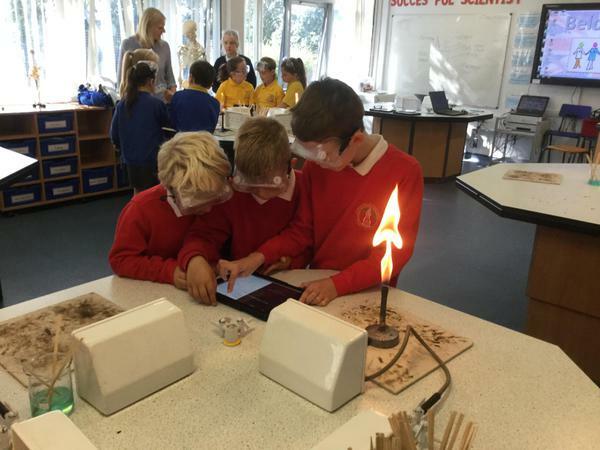 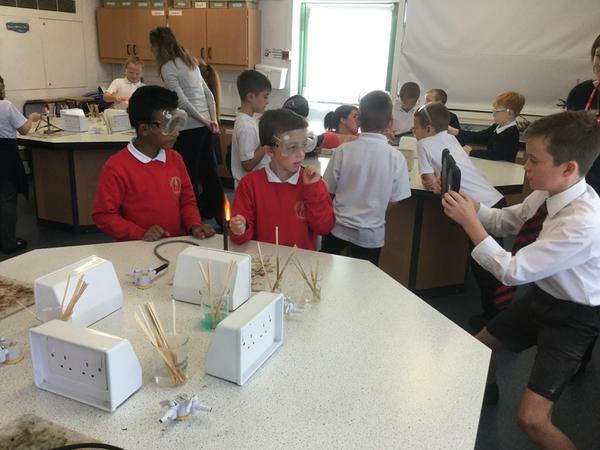 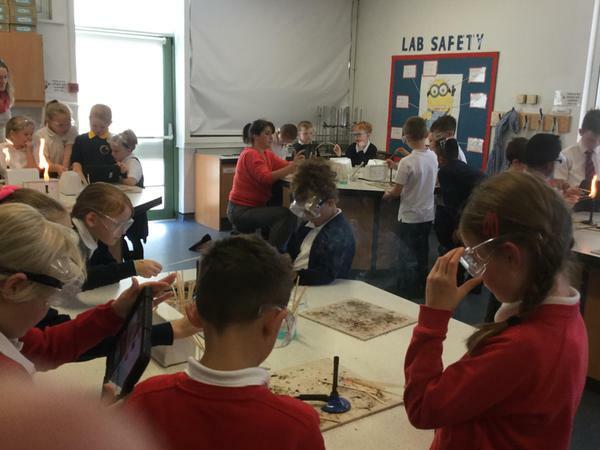 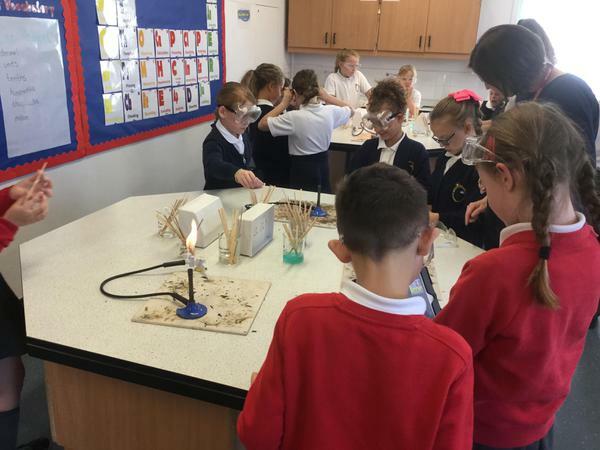 Following the success of previous STEM days over the last couple of years, we organised yet another STEM day at the start of the Autumn term for local Year 4 pupils. 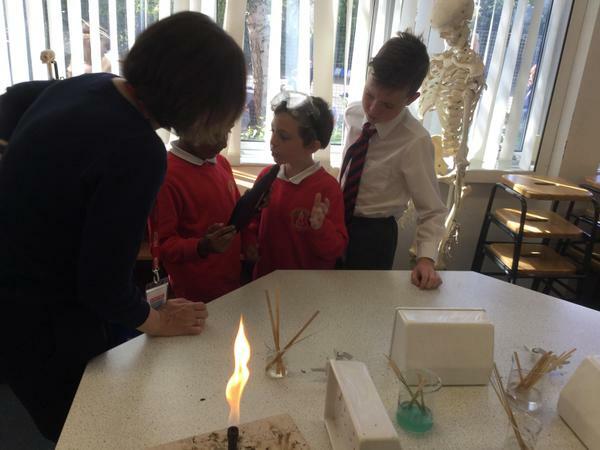 This time the theme was 'Explosions' and we welcomed pupils from Westlands, Chawson, Ombersley, Tibbeton, Hindlip, Wychbold and Cutnall Green. 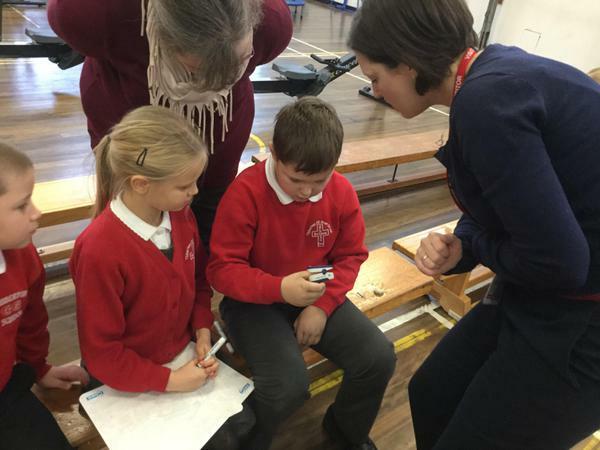 Once more, Westacre teachers Mr Barber and Miss Steenson were joined by Mrs Fisher and Mrs Park from the Prince Henry's High School in Evesham in organising different workshops for the children. 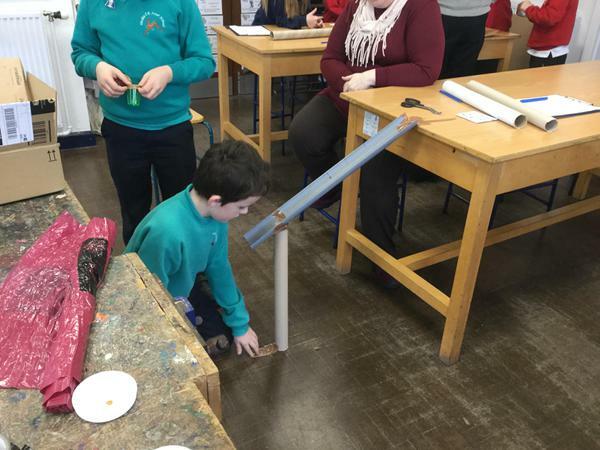 Well done to all of the pupils for their enthusiasm and skill throughout this STEM day! 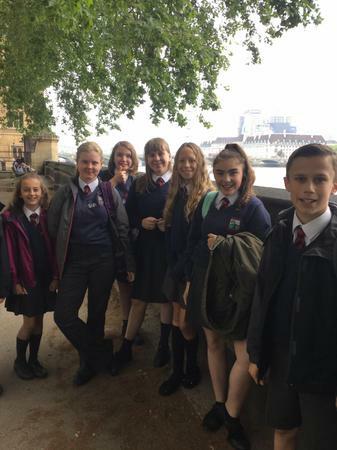 Well done also to the Year 7 prefects who helped with the organisation of the day and supported the children who joined us for the day. 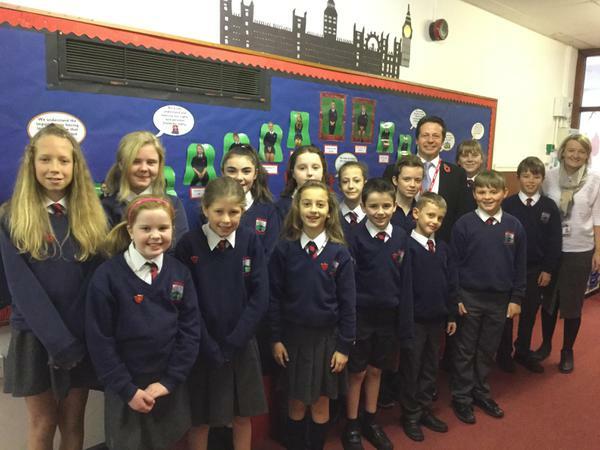 Congratulations to all of these children for being chosen for each of these very important roles! 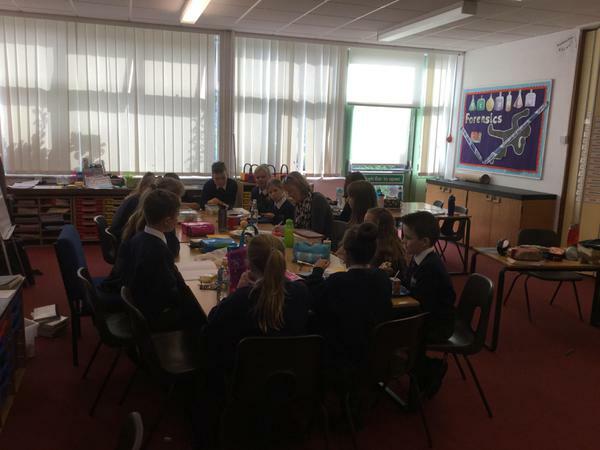 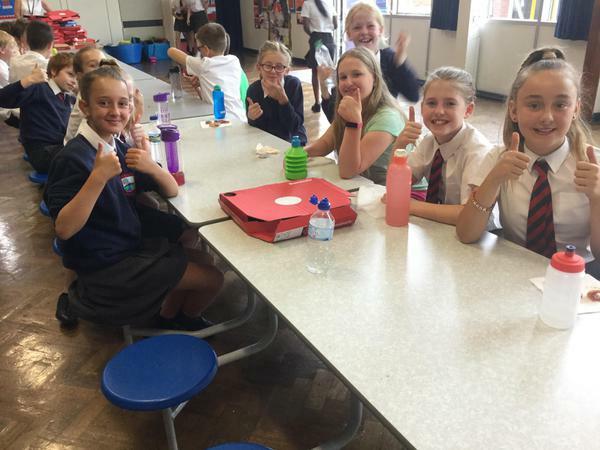 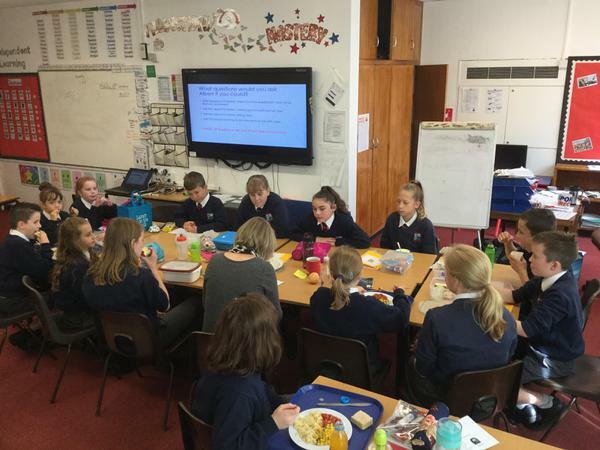 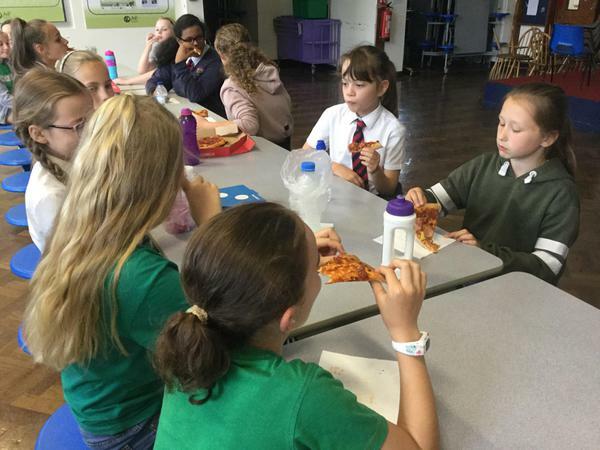 Our new Pupil Parliament working hard during a working lunch!